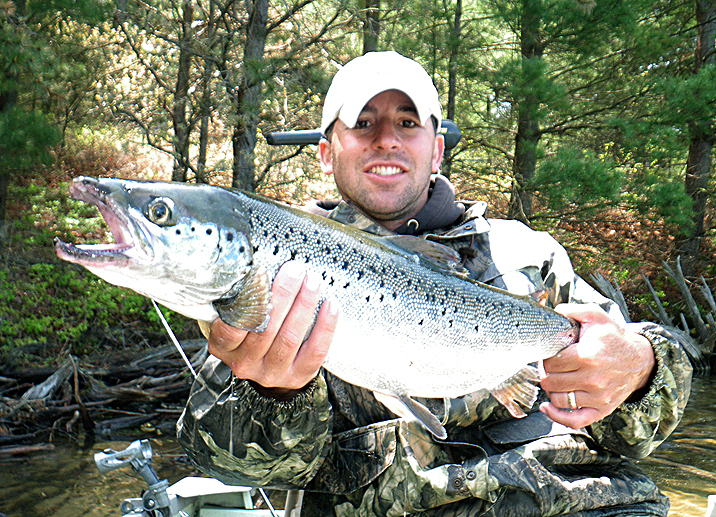 NY OCTOBER 2010: TROUT AND SALMON TRIP. Hey George its Doug Brennan, got some pics of this years NY trip. Matt’s Atlantic I believe was 13 plus pounds. Mine was 6lbs 7 ozs. 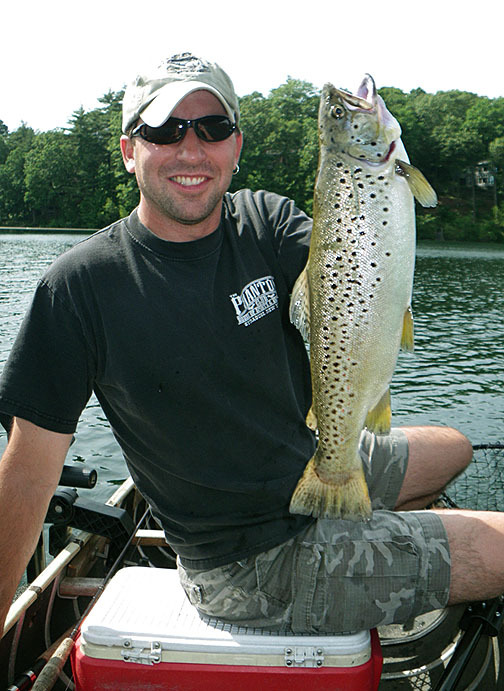 My buddy Eric Munroe had an 8 lb 11 oz Brown, his king he's holding was 18 lbs and his on the stringer was 22 lbs even. My king was 22 lbs 4 ozs. My favorite was my last one of the trip a 20 lb fresh hen, so silver I thought it was a steel head, got her on my fiberglass ultra light rod with yozuri 12 lb hybrid line, not braided. That fish destroyed my reel. It blew all the bearings. Had to retire it after that fish. Was a great trip. David called the fish a "bullet" cause it was at the end but looked so fresh, no green tint at all. 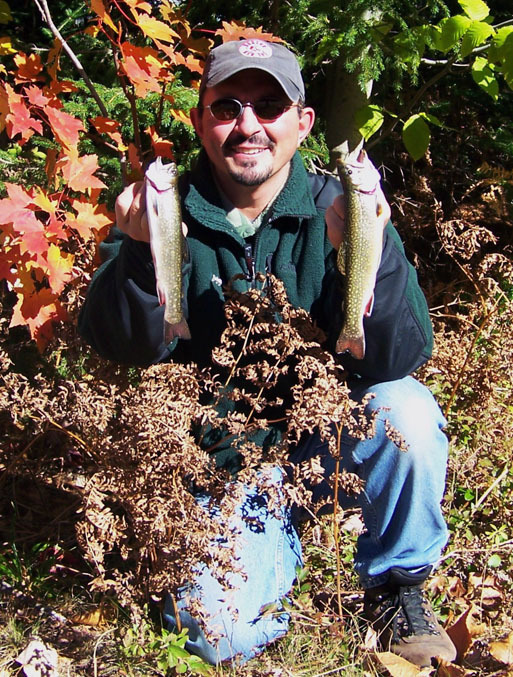 FALL 2010: HAVE NOT BEEN FISHING MUCH BUT MORE FISHING CONTENT TO COME. Sorry for the lack of fall fishing reports and pics. I usually enjoy fall fishing and mixing it up with a little hunting but this year I really got bitten hard by the deer hunting bug and have barely fished at all since mid September. This season I wanted to fill the freezer with venison, so this year I decided to take hunting more serious. I even joined a rod & gun club and made some new friends who have inspired me to hit the woods hard. After bagging a deer during the bow season I thought the bug would wind down a bit and I’d pick up my rod again but all it did is intensify my quest for more back straps. Even with no hunting on Sundays in MA I’ve been busy scouting, hanging stands and setting and checking trail cameras. 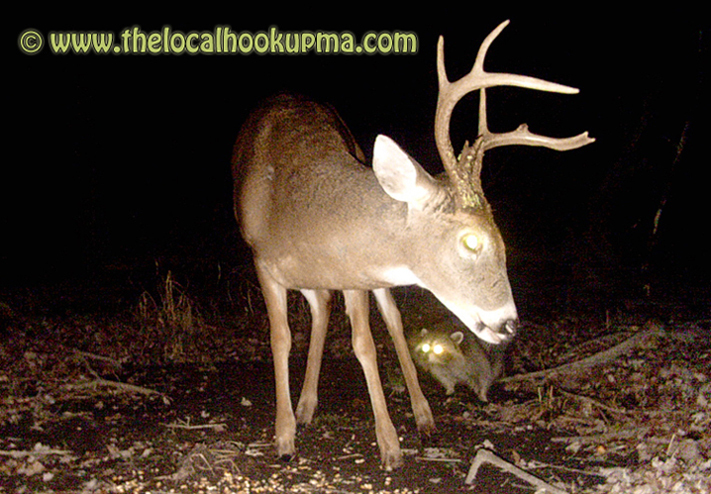 Add in a few buck sightings and some pictures of some big bucks shot on my trail camera out back behind my home and lets just say it’s been to hard to pick up a rod. 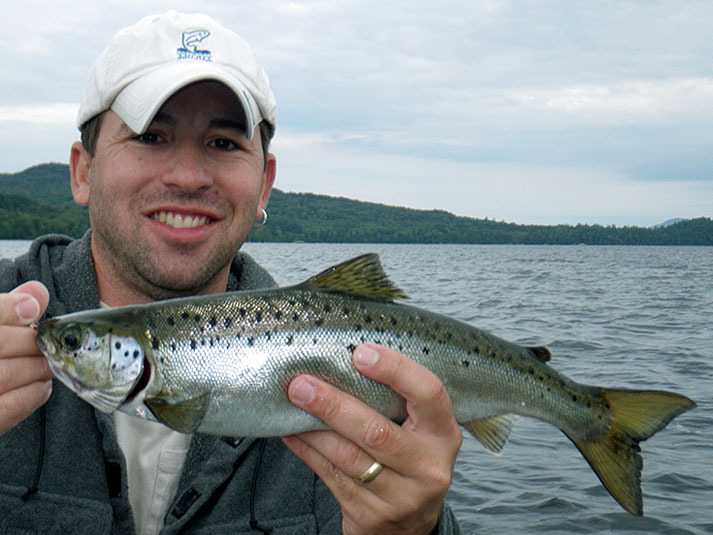 I do have some fishing reports and pics I’ll be posting soon from some friends (feel free to send me yours) and I’m also hoping to eventually break away on Sundays for some fishing, after the state stocks it’s allotment of brood-stock Atlantic salmon. Hopefully the state does it this month and not January. I’ll also be hitting the ice at the end of the hunting season and doing so with a new shelter (no more rain and wind for me). 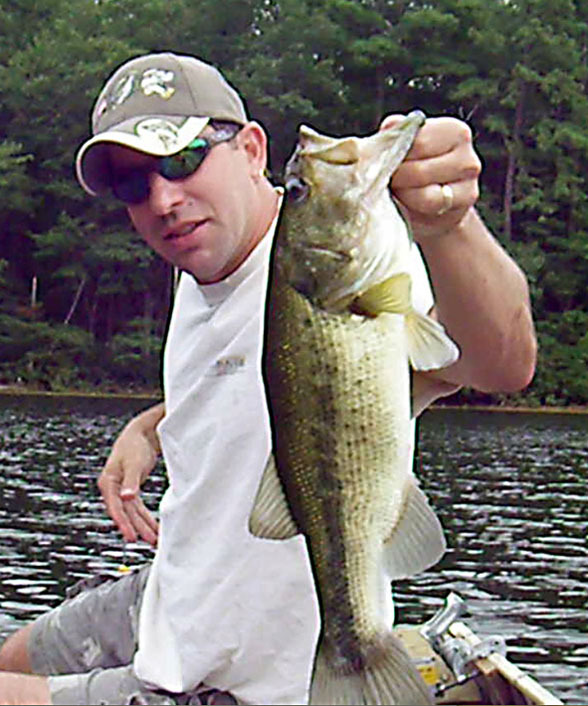 Look for more fishing videos to come of my 2010 season thus far. Some new hunting content to come also. So come back and check us out again soon. In the meantime check out my new fishing video below. Tight Lines & Straight Shooting. 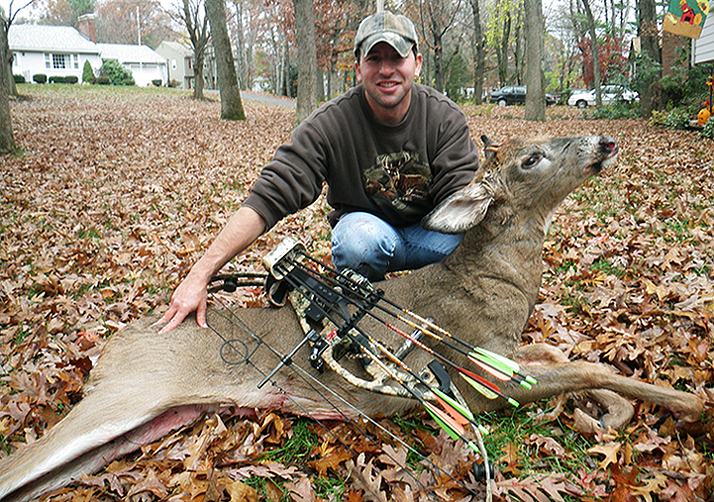 BOW HUNTING IS THE REASON FOR THE LACK OF FALL FISHING REPORTS. Hey George, I recently took a trip to my favorite Bass spot in Orange. I used to fish there allot several years ago when I lived in the area. I had caught many Bass in the 4 1/2 pound range. 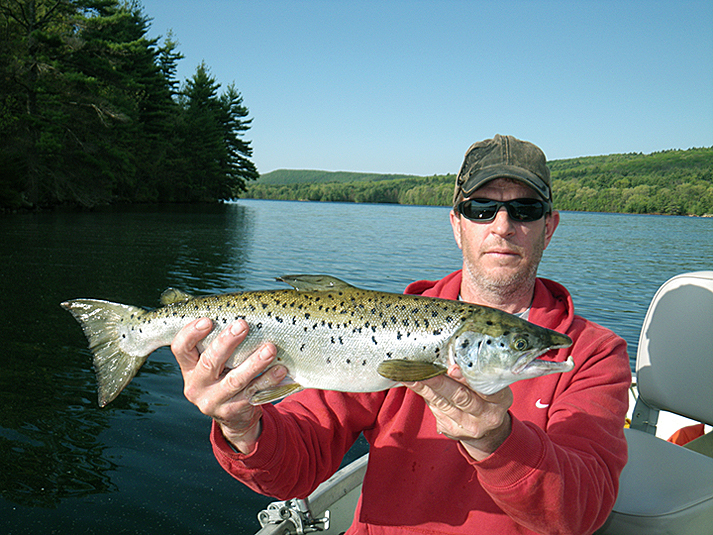 I suspected I might find some bigger ones on this trip because I was using live Fallfish in the 6 to 9 inch range that Mark and I caught out of the river a couple of days before. As we both know they are Big Bass candy. 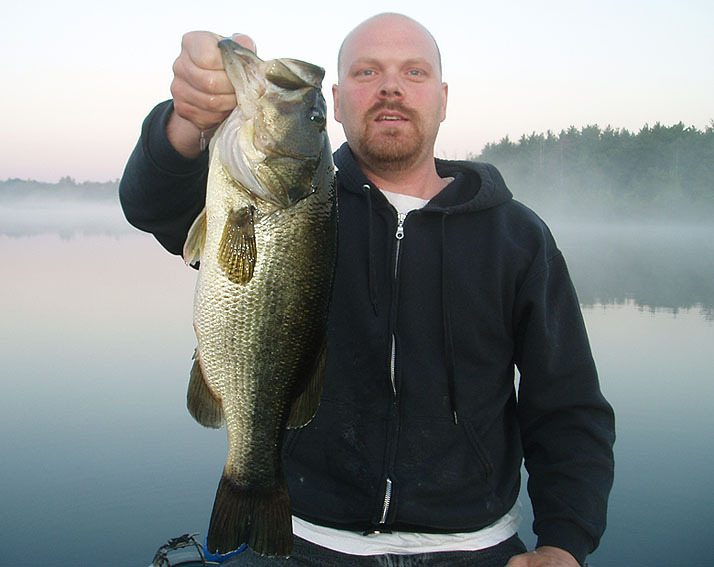 We were on the water before light and a big one hit me about 15 minutes after sunrise in the same area where I was catching 4 pounders years ago. The official weight 6 lbs 13 oz. 23 in 16 1/2 in girth. A new personal best. Was weighed in at Flaggs and released healthy at the boat ramp. Was the only big fish caught on this day. A few other small ones caught. My daughter Madison was along for the trip. She has recently been interested in getting up extremely early with me to go Bass fishing. The early mornings is what prevented me from taking her before but she seems to be getting more into it now. She had a good time and caught a couple of decent Bass herself. I think if she goes back with me next time she will have a good shot at her 2nd state pin. See ya Steve. My wife wanted to get away for a long weekend before the summer ended and requested some place rural and lakeside. She wanted to tan; swim, fish and just plain relax in an outdoor setting. She didn’t need to ask if I’d be up for such a thing but she did ask if I knew of such a place and I said how about Maine, it’s full of some great sporting camps. It fits what you’re looking for and rustic lodging and great food are part of the tradition of these camps. She happily agreed, so it was time to make some plans. It’s been years since I’ve been to one of these camps but after some research and few phone calls we ended up booking a cabin at Bald Mountain Camps. Day 1: It was sunny and warm when we pulled out Sunday to begin the drive north. When we finally got to our camp it was cold, extremely windy and overcast. I’m glad I talked the wife into packing some warm clothes. The lake was sporting some serious white caps, so our afternoon plans got shot down. We were advised that renting a boat was not recommended with the current conditions. Our plans of sun in the fun turned into welcome to an early and windy fall. We checked into our cabin, which had a beautiful waterfront view of Mooselookmeguntic Lake. So we settled in and made the best of it. I loaded up the fire place and then opened up a beer and sat for a little while and enjoyed the fire for a bit, then grabbed the rod and headed to the boat dock in front of the cabin. I knew it was probably too windy to fish but figured it couldn't hurt to try. On my third cast I got surprised when I landed a fallfish, the same species I catch in a creek behind my house hours away. 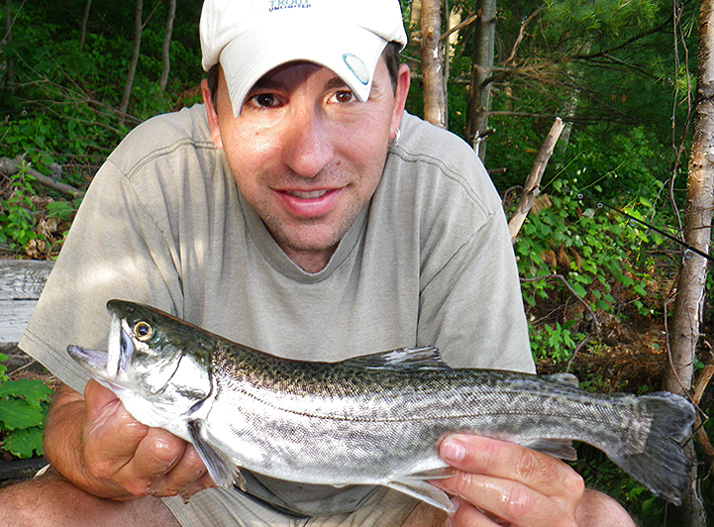 About 5 casts or so later I landed a small native brook trout. My wife saw me catching the two fish so she came down and started casting as well and before long she had a fish on as well, she was hoping for a trout on the end of her line but it ended up being a yellow perch instead. The bite had ended and the wind picked up. We decided to head back in the cabin and enjoy the fireplace; we then hit the camp dinning hall for a fantastic meal. Deciding between prime rib or lobster is a wonderful problem to have. The micro brew was also excellent. Afterwards back to the cabin to relax and hit the sac early. Day 2: We got up early and hit the camp dinning hall again this time for a tasty breakfast. It was still windy and choppy on the lake but not as bad as the previous day. I decided to rent a boat so the wife and me could fish. With my wife's comfort in mind the camp owner was kind enough to offer his boat. His was the only one with soft seats and none of the other camp boats had any soft seating. He also suggested a spot to try for our outing. 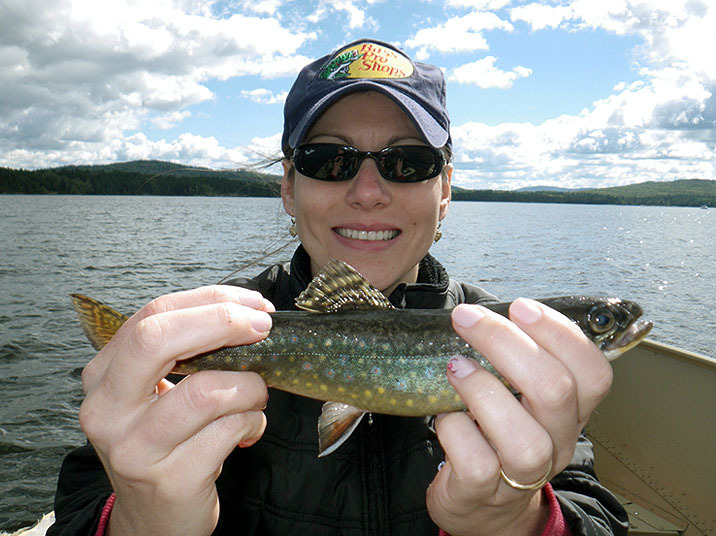 Unfortunately after fishing most of the morning all we had to show for it was a brook trout my wife landed and a yellow perch I landed. We came back in for lunch and then headed downtown so my wife could do a little shopping. When we got back the wife relaxed back at the cabin and I headed out in the boat again to give the fishing another shot before dinner but unfortunately conditions were still bad and the fish still uncooperative. Day 3: Our last day I woke up early in the morning. I looked out the window and was pleased to discover some sunshine and a fairly calm lake. The overcast skies and wind finally left. My wife and me quickly packed our things for the later commute home and then headed back to the dining hall for breakfast. We decided to spend the morning giving the fishing one last try before heading home. 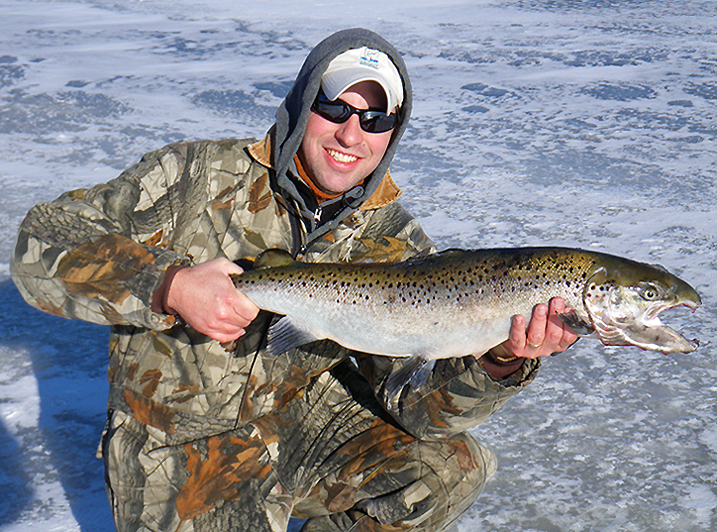 With the conditions being much more favorable we felt like we actually had a real chance with the fish. Neither of us had gotten into any of the lakes landlocked salmon. Yesterday while taking the wife downtown so she could shop. I stopped in a local sporting goods shop. I picked up some DB smelt spoons and also some top gun spoons that one of the guys working the shop recommended. 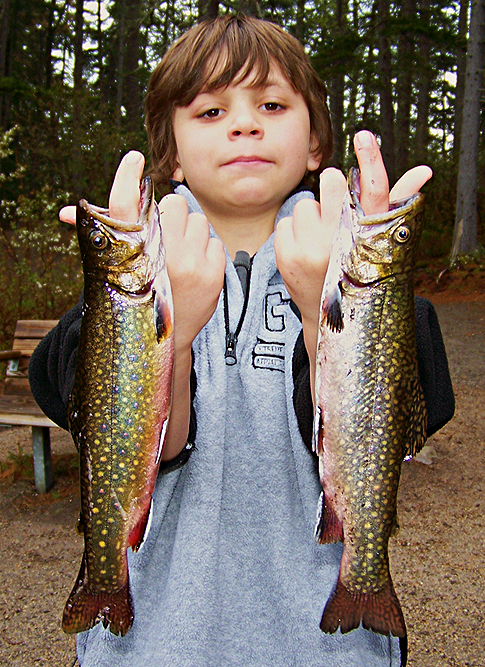 I asked him what the hot color patterns were for these baits and how many colors down guys were fishing their lead-core line. If you’re a newbie to fishing an area these little local shops are a wealth of knowledge and worth stopping in for some tips. So I had a new game plan based on yesterday’s information and also this time I decided to forget about any suggested locations and look for some deeper water. I found a nice deep area to troll and ran two rods outfitted with lead-core line, one for me and one for the wife. I dropped both lines down 8 colors and put a db smelt on one and a top gun spoon on the other and began our troll. Unfortunately the first hour or so was a bit slow. We ended up finding some even deeper water and started fishing over this deep hole and I was hooked up with my first fish of the day a decent brook trout. 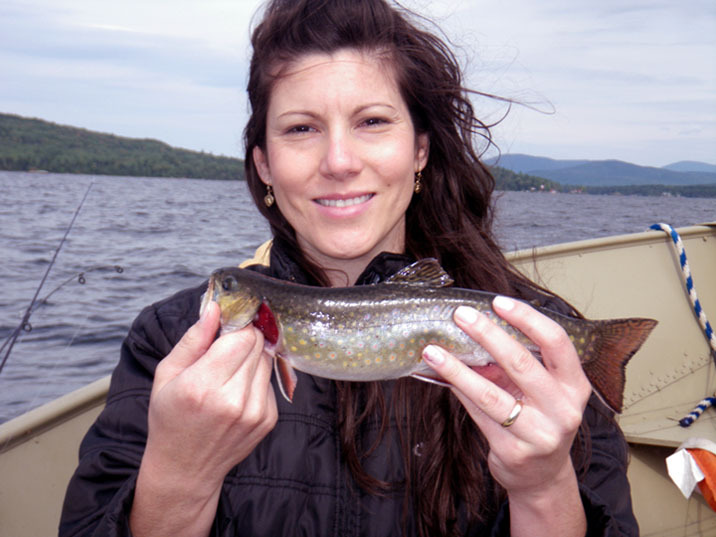 Not long after my wife hooked up with her brookie. After getting back in position and making another pass over the deep hole I connected and landed the first land lock of the trip. We then repositioned the boat and made another pass over the same hole and this time both the wife and me had a double hookup, both of which were successfully landed landlocked salmon. In between we also had some fish come off and I landed another trout. 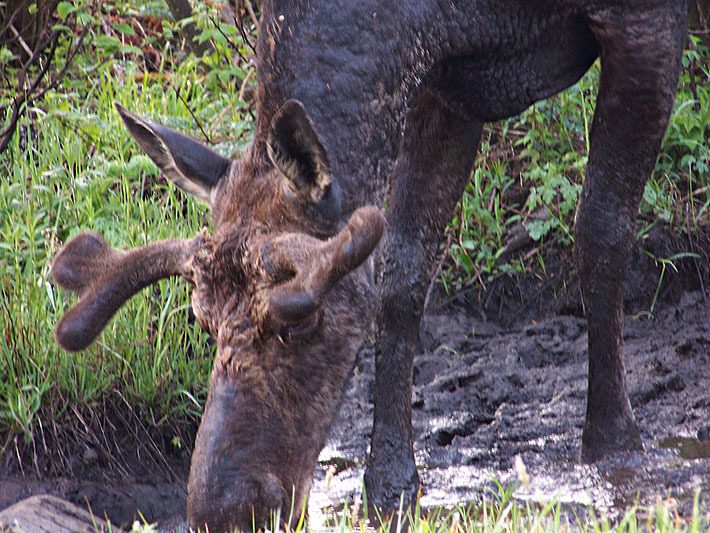 The bite was surely on and we could have continued to probably catch many more but we were hungry and had a 6 hour ride back home and I wanted to avoid driving at night, the last time I drove at night through Maine I almost hit 2 moose. So we grabbed lunch at the hall again and then headed home. Though thanks to Mother Nature we never got to partake in the warm summer activities like we had planned but regardless it was still a great time that I got to enjoy with my wife. Tight lines! Hey George. Was fishing at my favorite local Lake early Sunday morning. You know the place. Had the best hour of bass fishing of my life. At 6 am caught a nice 5lbs 3 oz Bass. Was pretty excited because it was my first 5+ in over 2 months. 20 minutes later I boated a 6 lbs 2 oz Hog which is my new personal best. 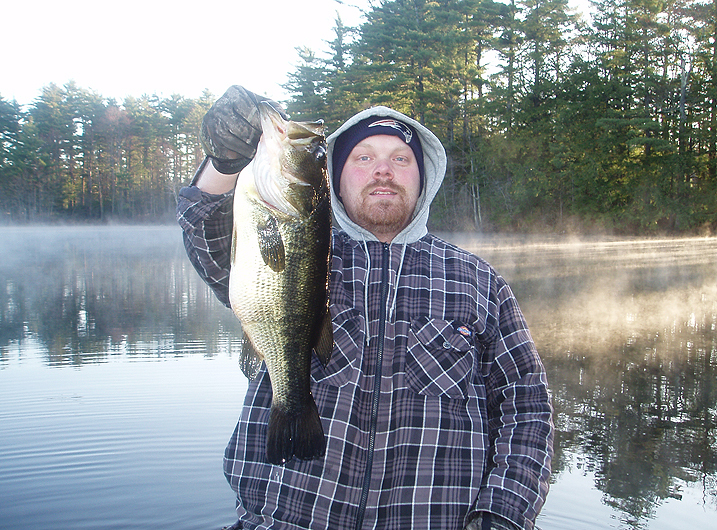 At 7 am got a 4 lbs 6 oz Bass with a nice bulge in its belly from a recent meal. Between me and Mark we got 10 Bass in the boat and a very large turtle next to the boat which I was forced to let keep my hook. 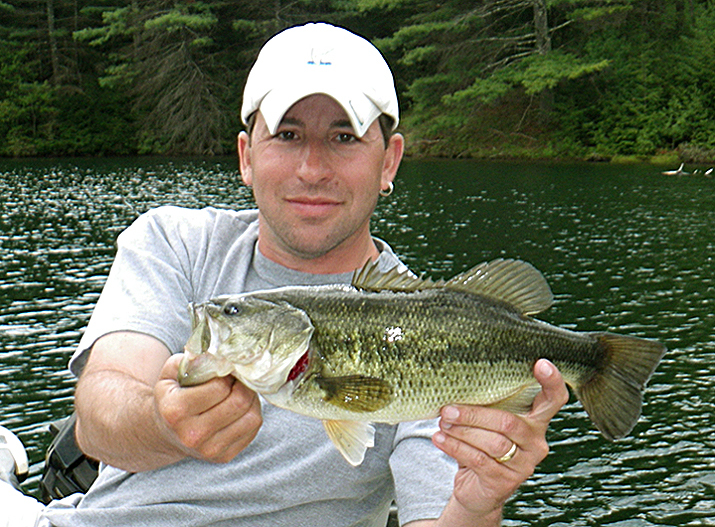 Mark did get hit by 1 large Bass but didn't hook up. Sounded almost like a Beaver tail when it hit. There are large fish in this place. I'm sure much larger than we have seen. 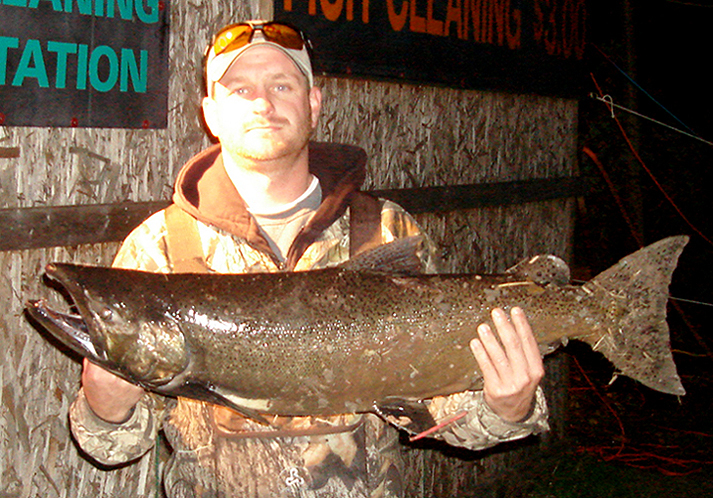 The big fish were all caught on live Fallfish in the 6 to 8 inch range that we caught 2 nights before from a new bait spot we found on the river. GOOD TIMES!!! 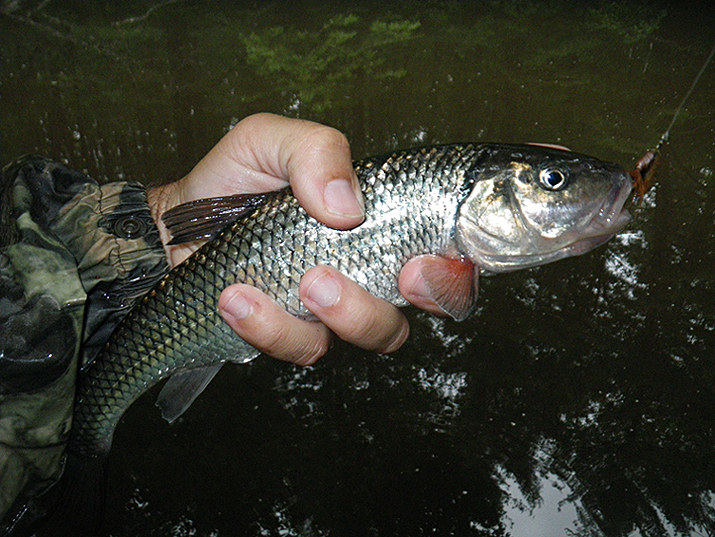 I went behind the house and down to the creek to fish for fallfish and also to catch some smaller bait fish with a minnow trap and a small cast net. 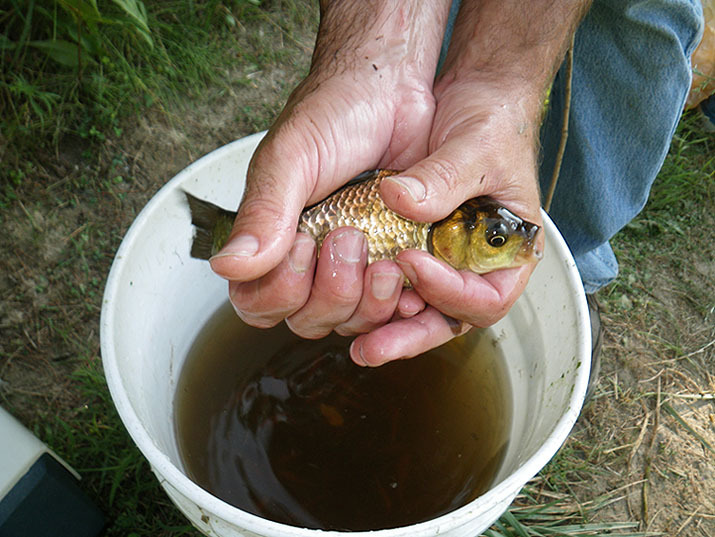 I brought down the trap and net to the creek for the first time not only to help collect bait but also to survey what other types of minnows and baitfish might be in the creek. 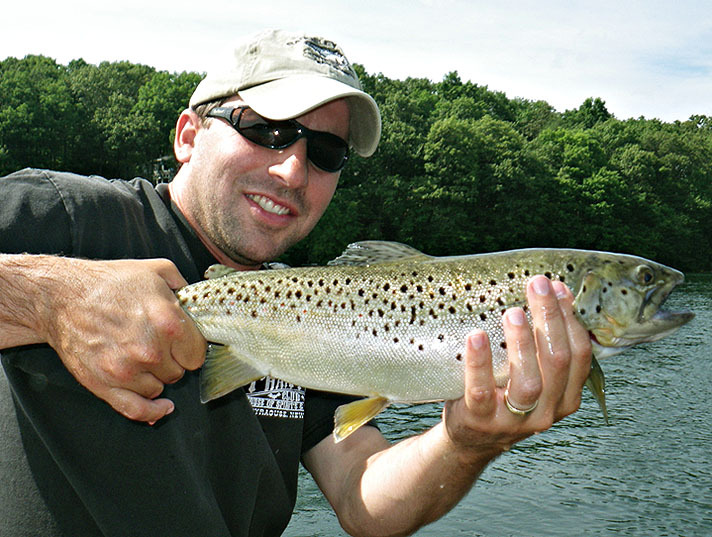 The larger fallfish bit well on spinners. Captured in my net and trap though were the usual smaller fallfish, a couple of bonus golden shiners, a few white suckers and minnow I have not identified yet. See the sampling photo below and the fork-tail minnow in the upper left corner? If anyone has any idea let me know! While relaxing at a restaurant last night and enjoying a great meal with great company, my family. My nephew tapped me on the shoulder and wanted to know when I would take him fishing. I said how about tomorrow buddy, his parents gave their nods and blessing and he was instantly excited. 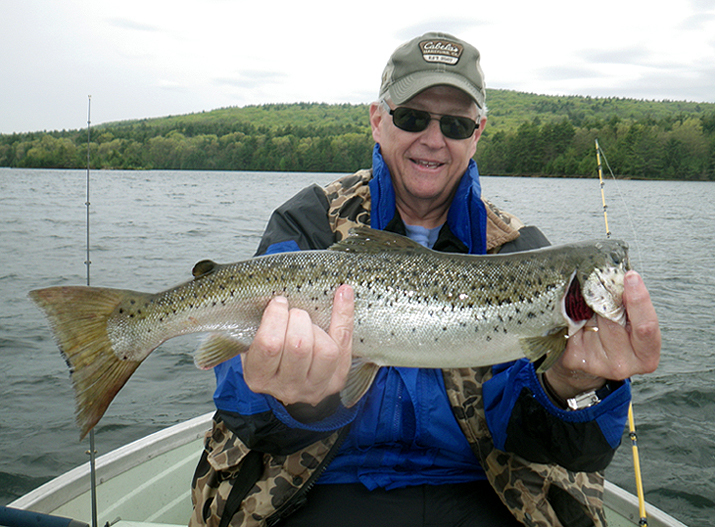 Though I had planned on hitting the Quabbin Reservoir early Saturday morning, with visions of giant lake trout in my head, it was already a 40 minute ride to pick him up and then an additional 80 minutes heading back the opposite direction to fish the big reservoir. 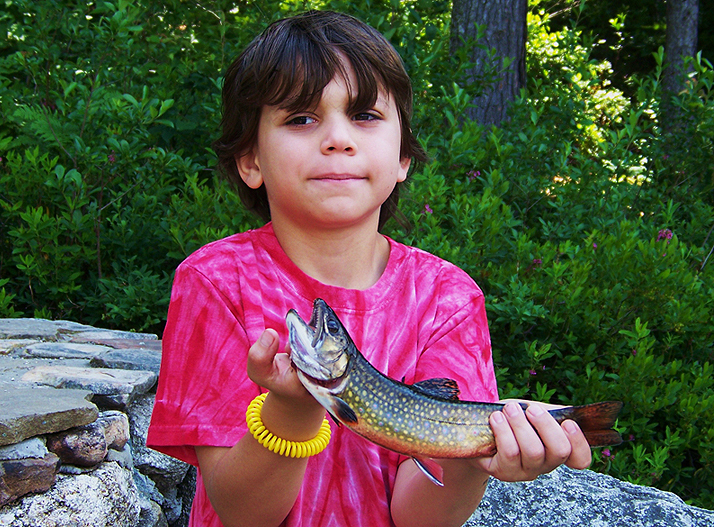 The Quabbin can be slow at times as well and kids just want to catch fish, they are not all that picky on what kind their catching as us adults can usually be. So I decided it would make more sense to take him to a little pond not to far from his home. Little Tyler has never gone fishing before so this would be an extra special outing, being the first one to introduce this wonderful kid to the sport was a honor and a pleasure. The goal was to keep it simple and basic but also teach a little skill. 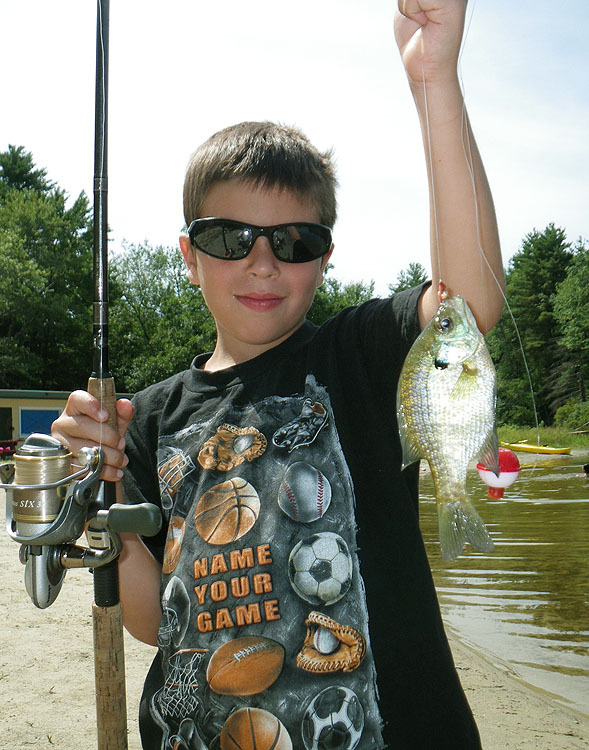 I brought the canoe but decided to start him off shore fishing and teach him how to cast a spinning rod first and put him on what most of us catch as our first fish here in the northeast, the very cooperative and eager to bite sunfish/bluegills, aka....kiva. 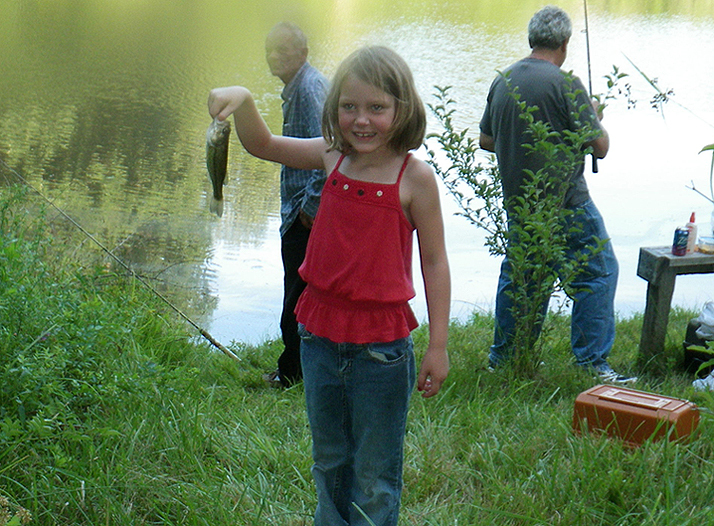 I was a proud uncle when he took to casting easily, especially with the spinning rod. 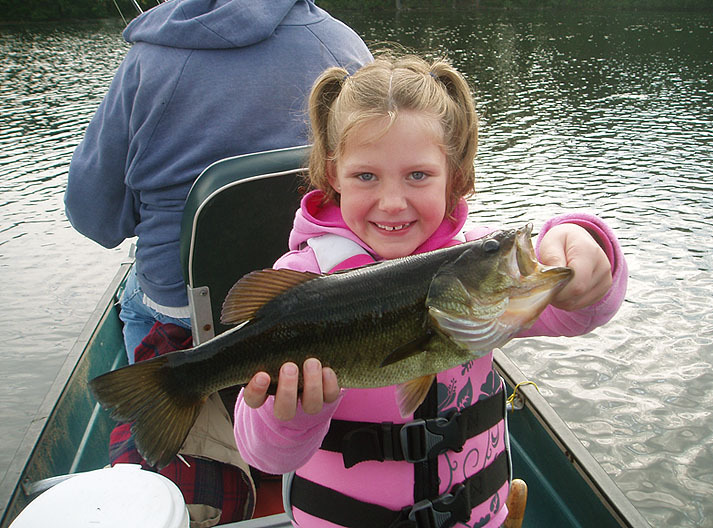 I want to also point out for those of you considering taking a young child fishing that you can even make it simpler for them by purchasing a push button reel and rod combo, that are much easier and faster for kids to learn and also pretty in-expensive. I bought one for the little guy shortly after his birth but mom lost it on him. Tyler's rod was set up with a bobber and a garden worm, like I said simple. It took no time before he landed his very first fish, a pretty little bluegill. 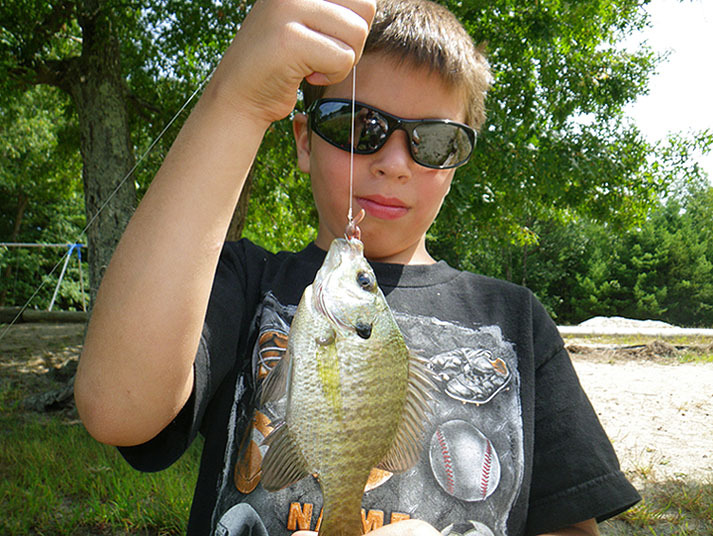 He began reeling in sunfish after sunfish and seemed to enjoy casting just as much as the catching. At that point all I could think was that this kid was going to be a natural. After Tyler’s great display I was glad I brought the canoe and decided he had graduated another grade up and it was time to slide the canoe into the water. The little guy seemed a little concerned about getting in the canoe but once he got settled he mentioned how fun it was. I asked if he wanted to continue to fish for sunfish or if he wanted to go after some bigger largemouth bass. His response was both uncle. 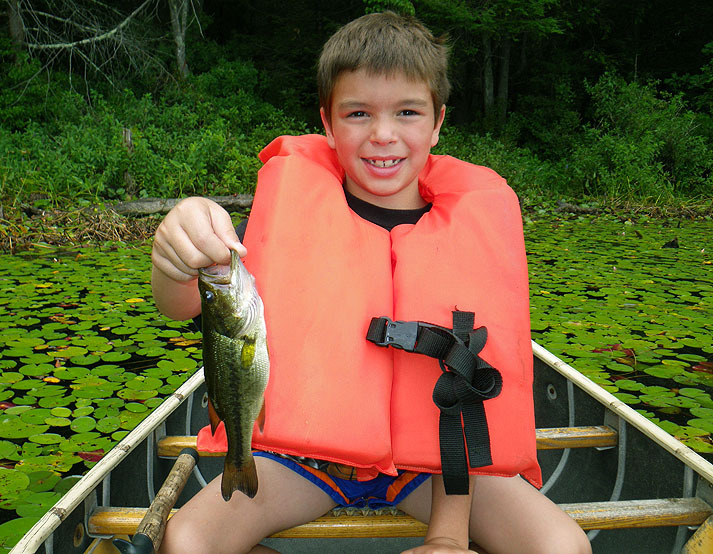 We began fishing out of the canoe and he continued to slay the bluegills and also managed to land his very first largemouth bass. After a while I decided to join in on the action in-between assisting and teaching the little man. 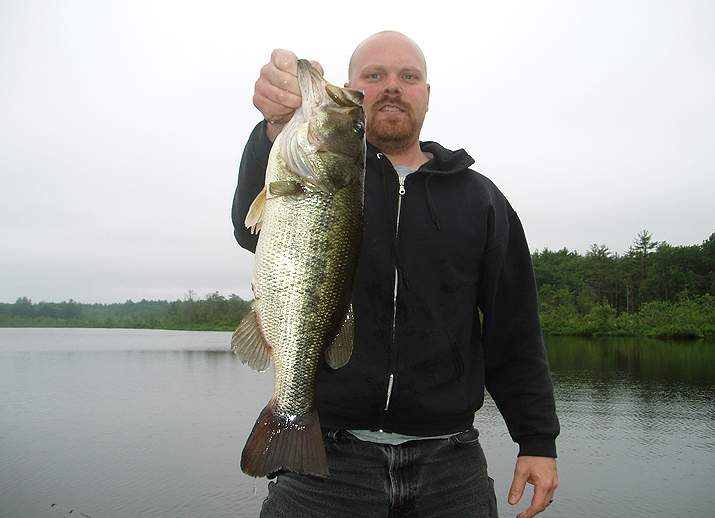 I was able to land a couple of lunker largemouth. One around 4 lbs and the other around 3 lbs. Both fish were caught on a black spinner-bait. Initially when I hooked the fish I asked the little man if he wanted to reel them up but he wanted nothing to do with it and preferred keeping busy and hauling up bluegills all by himself, like a big boy instead. 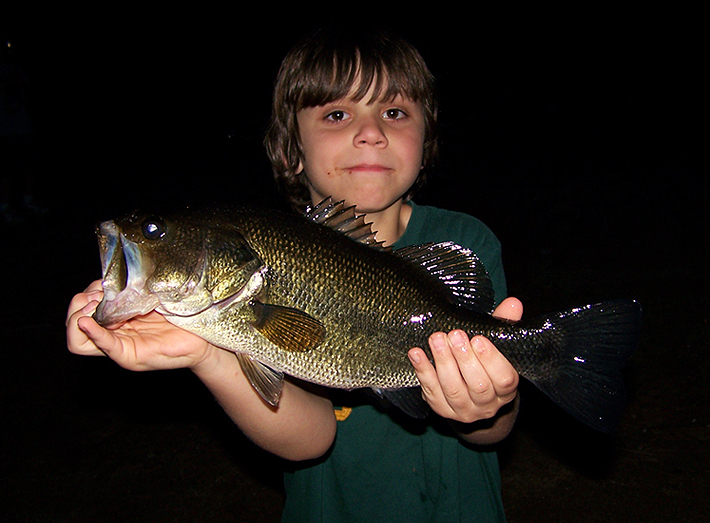 But he was still fascinated by the big bass when they were brought up. It was a memorable trip for both of us and Tyler wants to continue to join uncle on more fishing trips. 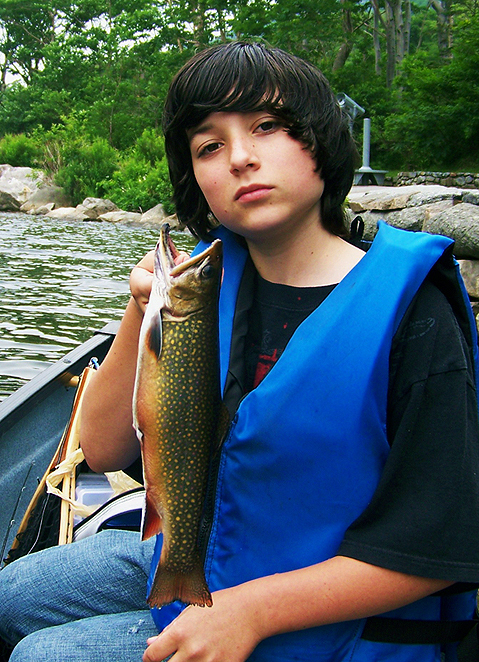 Something tells me he’s going to become a great fisherman someday and become a semi-usual boat fixture. Tight Lines! And Take A Kid Fishing! SO MANY BLUEGILLS HE LOST COUNT! I decided to head out and pursue some largemouth bass, a species I for the most part have incidentally neglected so far this summer. 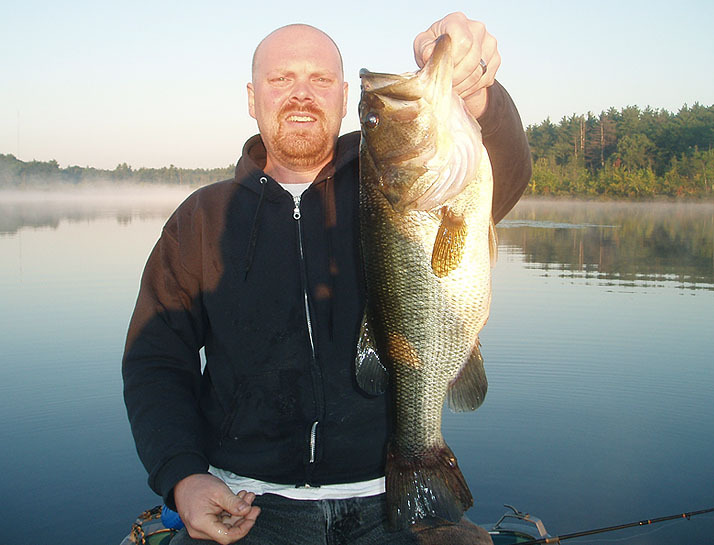 My original plan was to hunt down our most abundant species the largemouth bass during the course of the summer, until a trophy bass was landed. Instead I fooled around with other last minute pursuits' of other species. Regardless I finally made it out for some largemouth action. Hunting for big fish I brought only large swim-baits and as a backup plan I also brought some live and large fallfish, which I caught the other night in preparation for this outing. I finally get to the lake and immediately start tossing Slammers and AC Plugs, working every bit of cover and working the bait many different ways in hopes of trying to figure out how the fish wanted the bait presented. 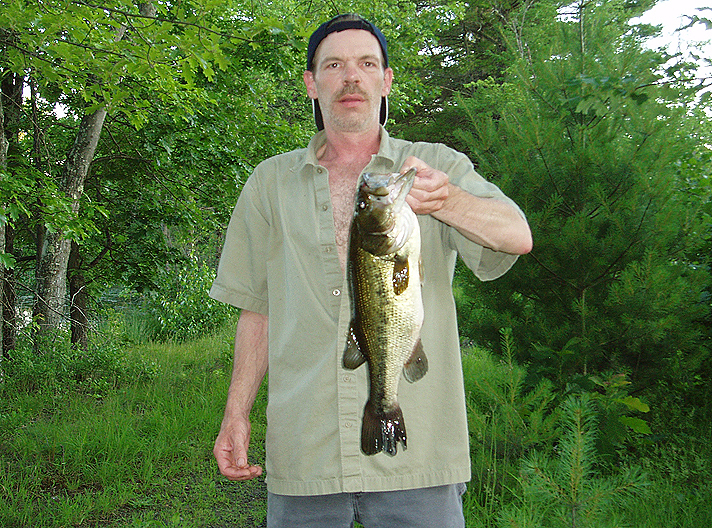 Unfortunately it was some slow fishing but I did mange to land a good chunker guesstimated around 4.50-5 lbs. I caught it while working the bait erratically on the edge of a heavy weed line. After about 3 hours of fishing the swim baits I then put them away and decided to bump my odds up with some live bait. I was baiting up fallfish ranging from 8”-12” long. I forgot my octopus hooks so I had to settle for the circle hooks I had. Great for hooking fish in the corner of the mouth but I find you miss more fish and your catch ratio goes down. So I was not happy about forgetting my octopus hooks. And as I expected I did have a few come off when setting the hook but I still also landed a few more bass, including another chunker around 4 lbs and the others around 2 lbs. I didn’t get the monster I had hoped for but still managed some decent fish and all and all not a bad day for an afternoon of fishing. Tight Lines! 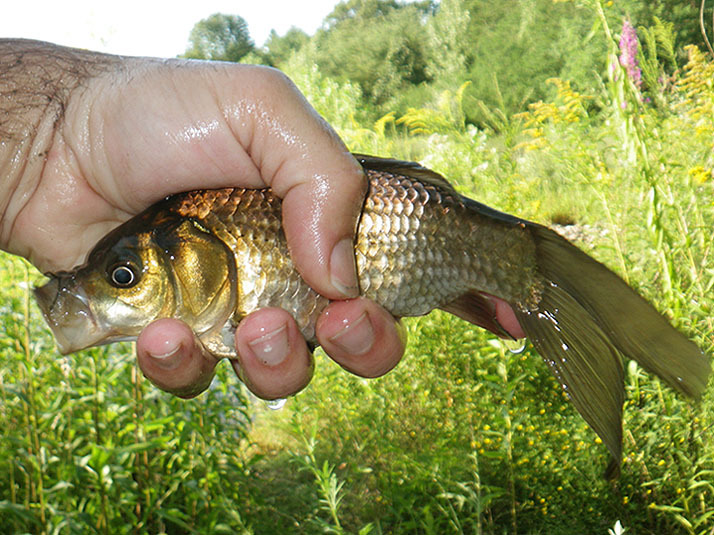 One weekday evening a friend had told Bill and I about a near by drainage pond out in the woods that he heard had been stocked by someone about 5-6 years ago with shiners from a bait shop and Rosie reds and Goldfish from a pet shop and how they flourished in the pond. 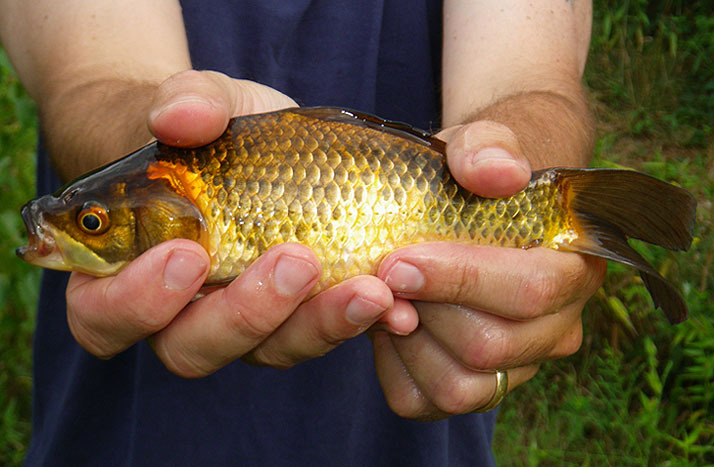 Now before I go on with this story I want to remind and discourage anyone from dumping any pet shop goldfish into our public ponds, lakes and rivers. It’s illegal and you risk spreading diseases and negatively impacting native fish and eco systems, (ok, back to the story). As silly as it might sound the pond sparked my curiosity. 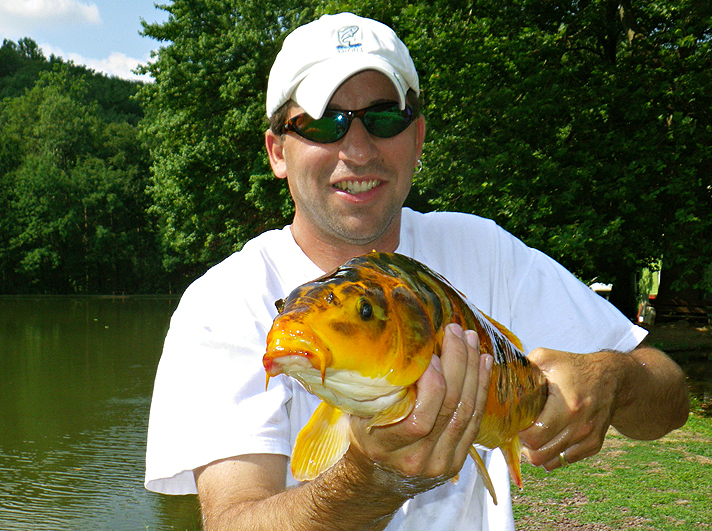 Wetting a line for any new species is always fun to me (yes even wild goldfish). Bill and me decided to check it out sometime. An outing to this pond sounded interesting since I could combine two hobbies into one...sort of. One of my other hobbies is fish keeping. I have a couple of fish tanks, including a 120-gallon tank that holds some very hungry peacock bass. I feed them pellets but every now and then I treat them to Rosie-reds and goldfish as treats, curtsey of the local pet shop. My pet fish usually put on a great show chasing and hunting every last minnow in the tank until they have all been eaten. I figured I’d bring a minnow trap and an ultra-light rod and see if I could bring home some free feeders for my pet fish. I also figured if I got into any large goldfish I'd bring home one or two as pets for my tanks. 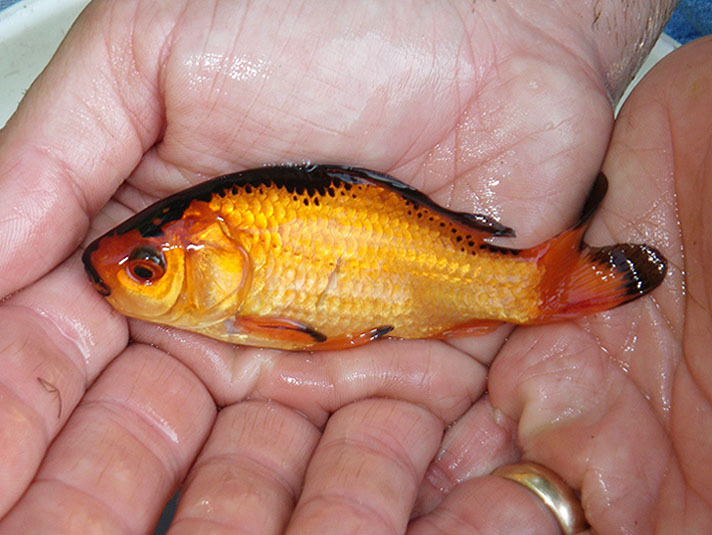 After all how many fisherman and aquarists can say they caught their own pet Goldfish. I also wanted to see exactly how large these gold fish have grown. 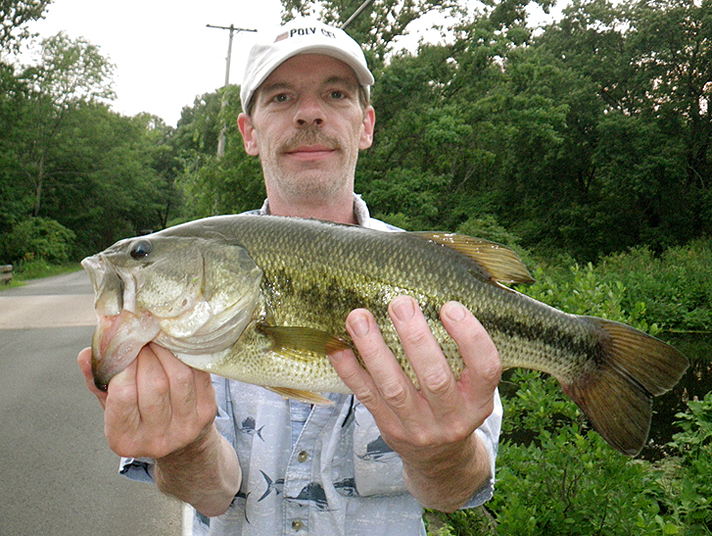 I was also curious if due to all the feed if there were any big fat largemouth bass in the pond. The following Saturday afternoon I ended up meeting Bill at the pond. We both tossed out our minnow traps. I then casted out a few lures and realizing shortly after that there were no bass or any other game fish in the pond, not even a sunfish. It was even more evident when nothing but Goldfish and Rosie-reds appeared (in droves) after tossing out some pieces of bread and crushed crackers. 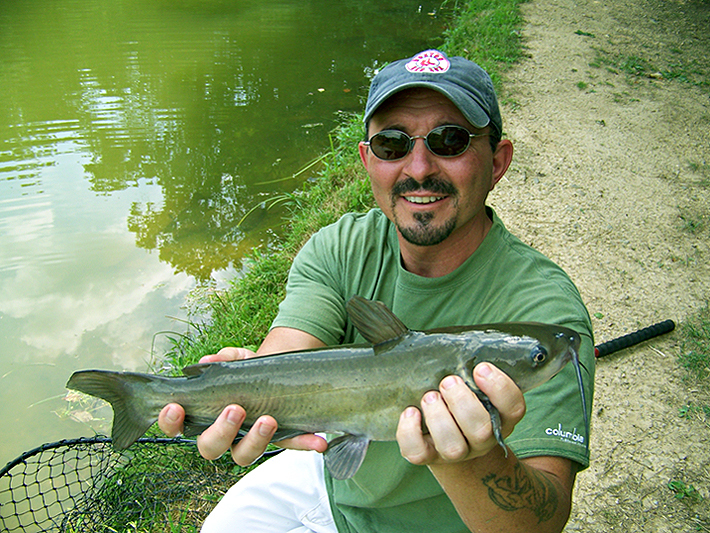 I then grabbed my rod and baited the smallest hook I had with a bread ball and casted. It did not take long before I landed my first goldfish. I’ve done some strange and out of the ordinary fishing before but this by far tops the cake, regardless it was still fun. Ended up catching quite a few gold fish and some bonus shiners with the rod. As planned I took home the two largest goldfish caught and added them as new residents to my tanks. Bill did pretty good himself and when we both pulled up our minnow traps they were full of mostly Rosie-reds and some small goldfish and shiners. Some of the Rosie-reds and small goldfish ended up being chow for my pet fish that night; they looked pretty fat and happy. The next day one of the new goldfish that I thought would be too big to be eaten disappeared. One of my exotic catfish (the largest in the tank) had a beach ball belly. I assumed he was the culprit of the disappearance. I could not get over how he was able to fit that giant goldfish in his mouth. Well it was back to the pond that same day to try and catch a bigger replacement goldfish. 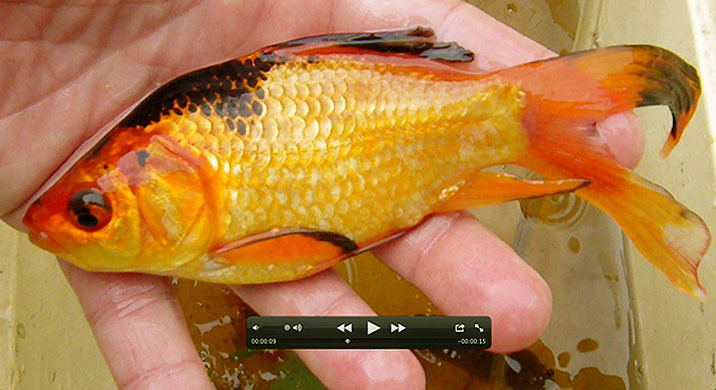 Fortunately I did, as well as all kinds of funky colored variations of goldfish. Including some crazy looking specimens with extra long fork tales. Probably some of the most unusual fishing I have ever done. Tight Lines! Bill and me have been changing things up a little this year and been doing a bit of carping recently. After fishing our new carp spot for the first time, we each caught 3-4 carp apiece and I landed a decent size carp that at fresh weight went 17 lbs 8 ozs. Bill after witnessing the capture was determined to get one of 15 lbs or better himself but after a handful or so of trips he made only had a bunch of small carp to show for it. I told him the fish are there and to just put his time in and he would eventually be rewarded. Our little spot though lately had only been producing a lot of small fish and then the bite died off all together. Saturday I had a bunch of household chores to catch up on and then dinner plans with some friends in the evening but after finishing up the chores earlier than expected left me with a 2-3 hour window of free time. 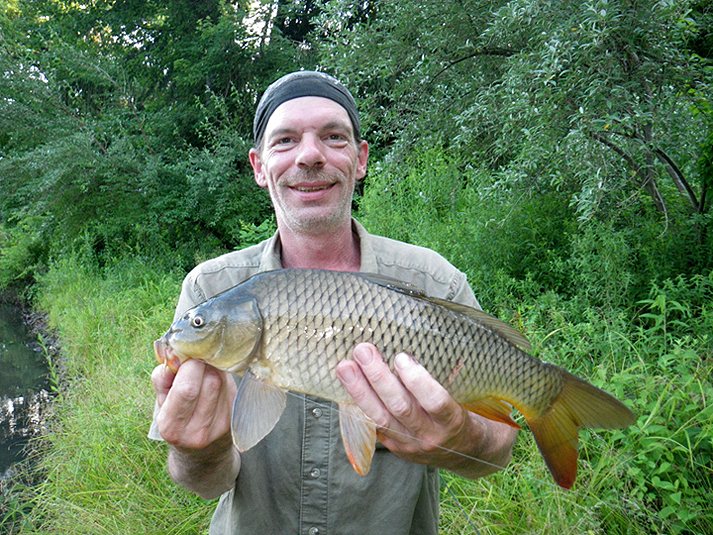 So I met up with Bill and we hit our carp spot and it was a dead bite. I had one strike and that was it and Bill was having the same luck as I was. I finally headed home to shower and head out to dinner. After I left Bill continued to fish and stayed. On my way to the restaurant I get a call from Bill and he tells me he finally landed a lunker carp. He kept the fish over night in his massive holding tank so he could have the fish weighed in at a official weigh station for a MA state award pin. The next day after the weigh in I helped Bill transport the giant cooler back to the pond. With the weight of the water and fish what a chore it was trekking through the woods. But that’s what friends are for and Bill recently did the same for me as well. It was well worth it to see that big fish swim off alive and well to be caught another day (maybe even bigger next time). It was nice to see his efforts rewarded. TIGHT LINES! Day two of our catfish trip. The plan was to fish the morning for another attempt at a big cat and then head home. The day before we noticed a small school of koi fish that I’m assuming were put in as ornamental fish. When the bite got real slow I occasionally took one of the rods and messed around briefly with the koi trying to get one to bite. But found it to be impossible. 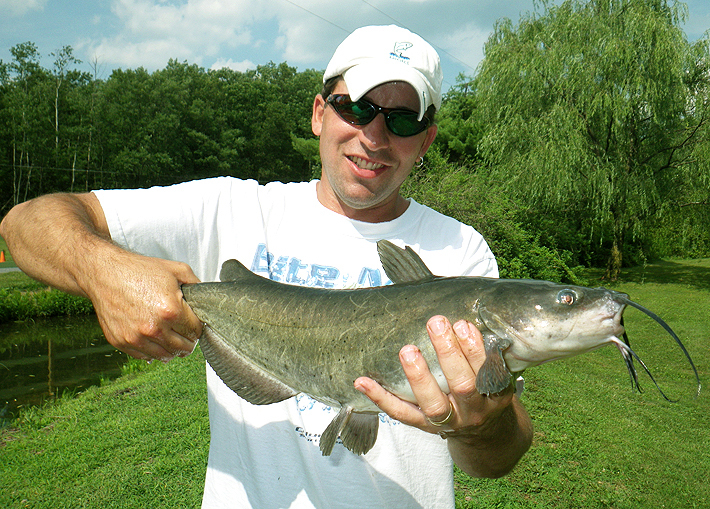 Anyway on our last morning we all caught more channel catfish but no monsters or flat heads, the bite was a little slower than the previous morning. Around the last hour before leaving I grabbed a can of sweet corn I had in the truck, left over from a previous carp fishing trip. 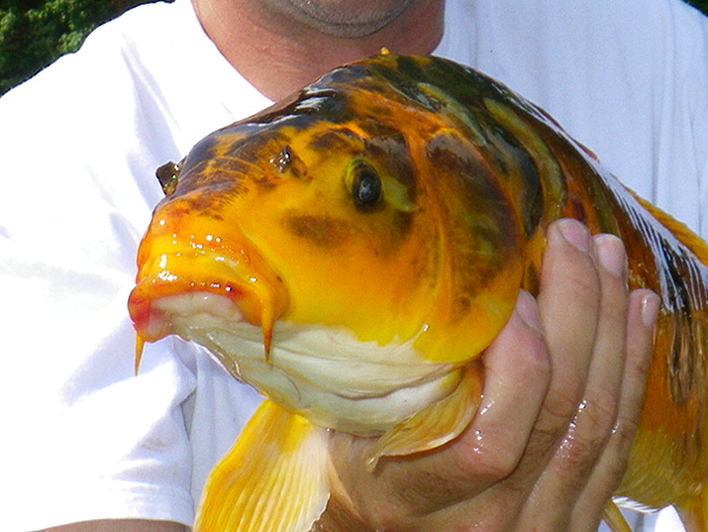 I figured since koi are the same exact fish as carp (only with a cooler paint job). I’d try the same method as I use on carp. I chummed some corn first before casting out my line. The corn got their attention and they certainly fed on it. But they clearly knew the difference between corn dropping naturally to the bottom and corn with a hook and line attached to it. I kept at it and eventually suckered one into biting. It took the bait while it was sinking to the bottom. Though I was mostly just messing around with them I was happy to catch one. TIGHT LINES! 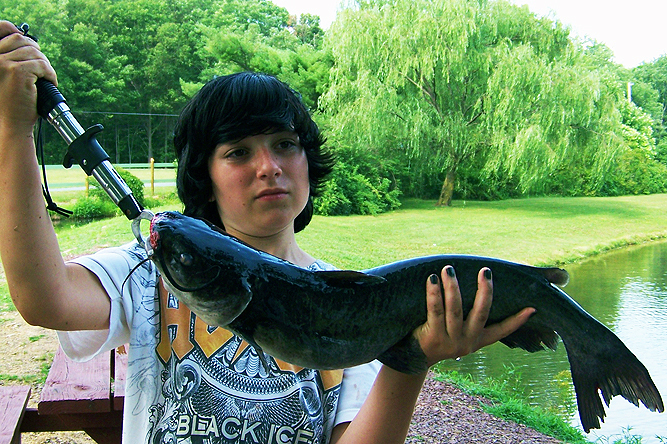 My friend Mike called me up one day and told me about a pond in PA that he read about online that had some big catfish in it and if I was interested in checking it out with him. I’ll fish for anything so the next thing I know me, Mike and his son are on a road trip. While traveling to our destination we saw a small herd of 5 bucks in velvet in someone’s backyard. Most of the bucks had nice racks in velvet but what I found peculiar was that there are no woods adjacent to this neighborhood. The nearest woods are about a 20-minute (human) walk away, crossing downtown through Main Street? No fences either, I hit the brakes when I saw them and pulled over to shoot some video and Mike snapped a few pictures, cool sight. Anyway the next morning (day 1) we started fishing and I managed to land the first fish of the trip. Mike and little Mike soon followed and caught some channel cats as well. 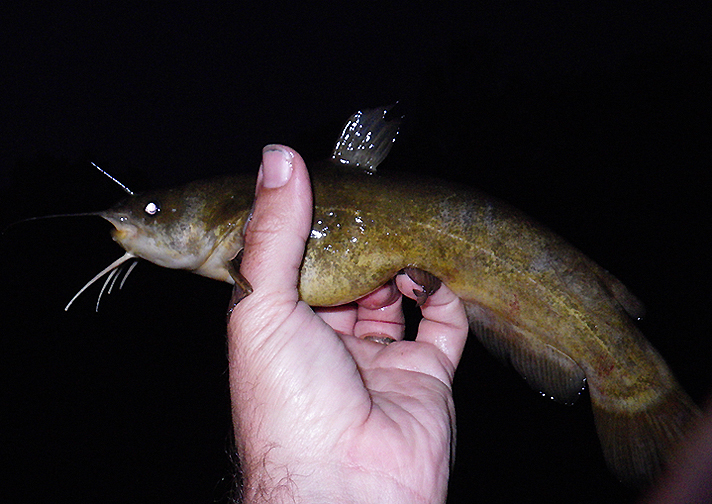 We each landed a bunch by being patient and every so often plucking out a cat. We fished chicken livers (yuck) off the bottom with slip sinkers. 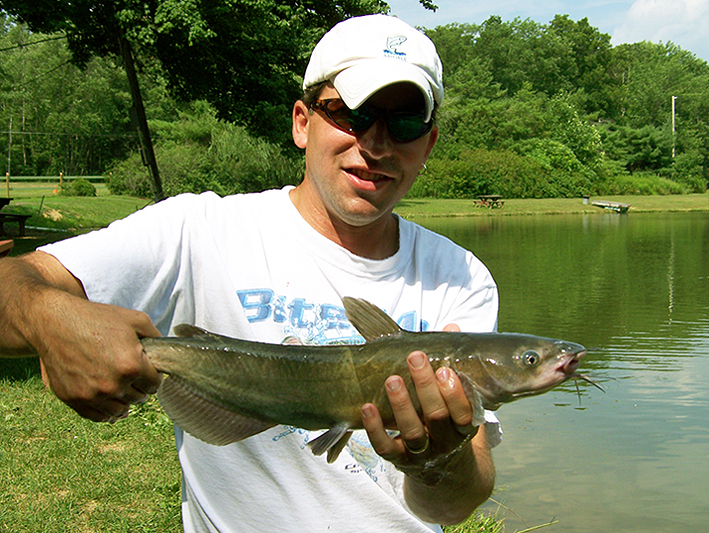 At one point we saw a massive flathead catfish appear near the surface out in the center of the pond. What a monster. Unfortunately this fish was beyond casting distance for my gear but man what a fish, I’d guess around 45 lbs. At least we all got to see a whopper. The action wasn’t fast and furious but it was consistent enough to keep us interested. We didn’t hook any of the monsters we hoped for but considering the heat wave we got I’d say we did all right. 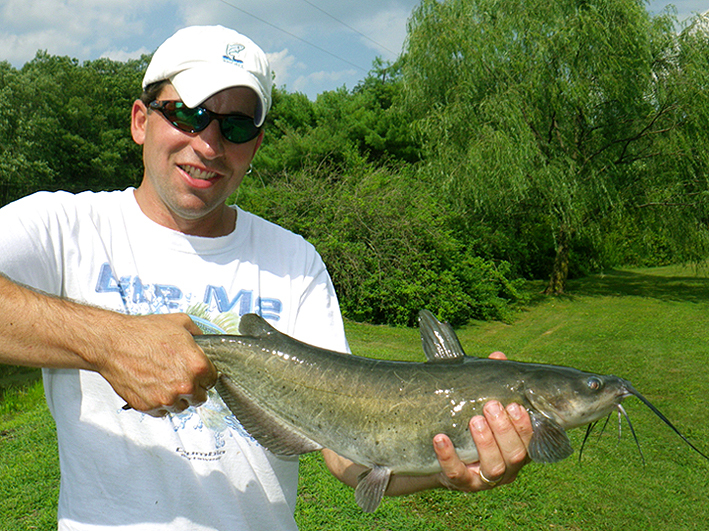 Not to mention we all got to catch our first channel cats. 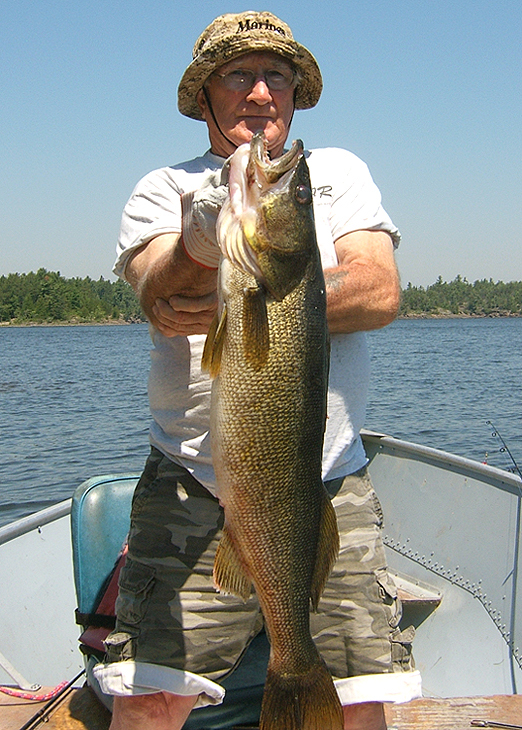 My friend sent me this picture of his uncle holding up this 34 inch, 15 pound 8 ounce Walleye. It ended up being a record for that area. The Pickerel River near the French River in Canada. One hell of a catch. To top it off before this fishing trip his uncle had not not picked up a fishing rod in 25 years. 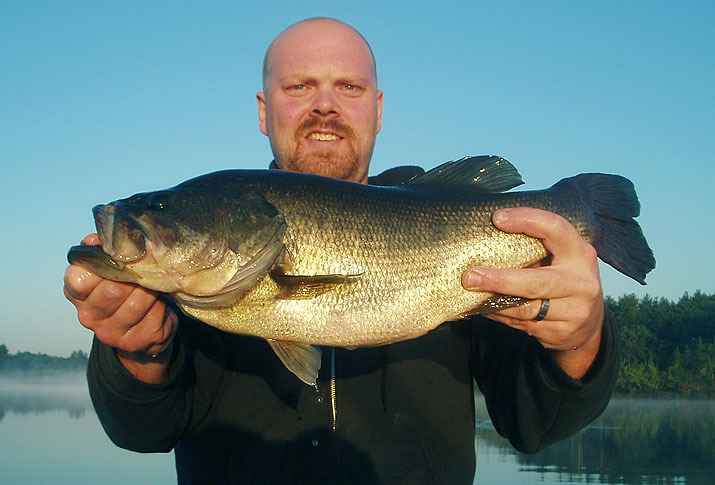 Steve sent me a quick report of his largest largemouth bass thus far this season. A 6 pound even bass. 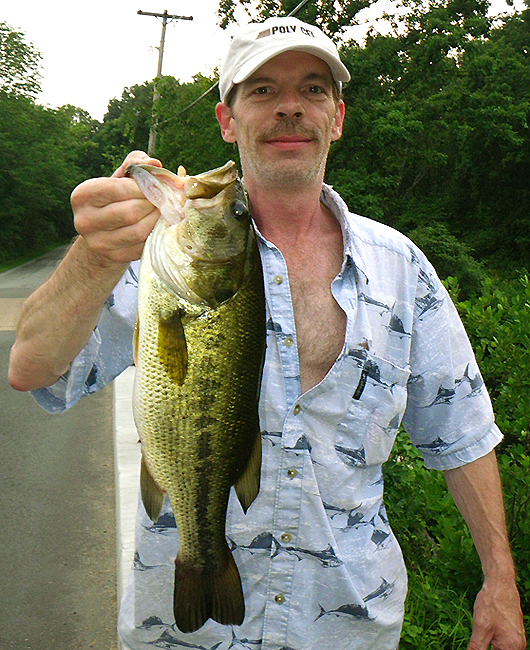 The largemouth taped out at 23 inches long and was released alive and well to fight another day. Steve wished he had caught it a couple months ago when it was full of eggs and weighed more. 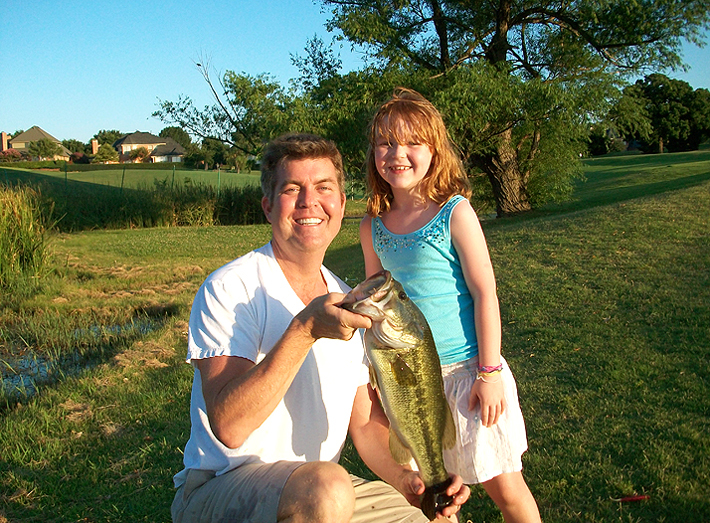 His little girl is also catching her own largemouth bass. 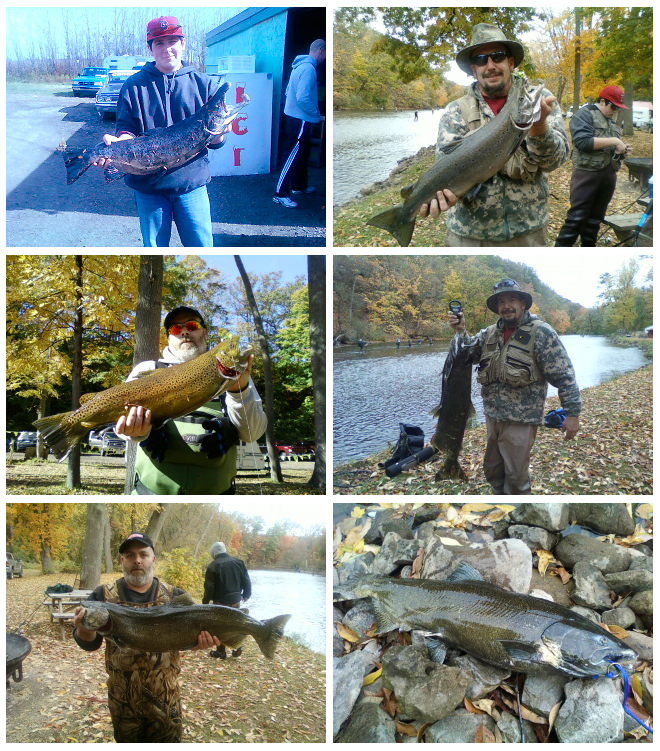 Bill recently did some river shore fishing the last couple of days and sent me a couple of pictures and a quick report. Each picture represents each days best fish. 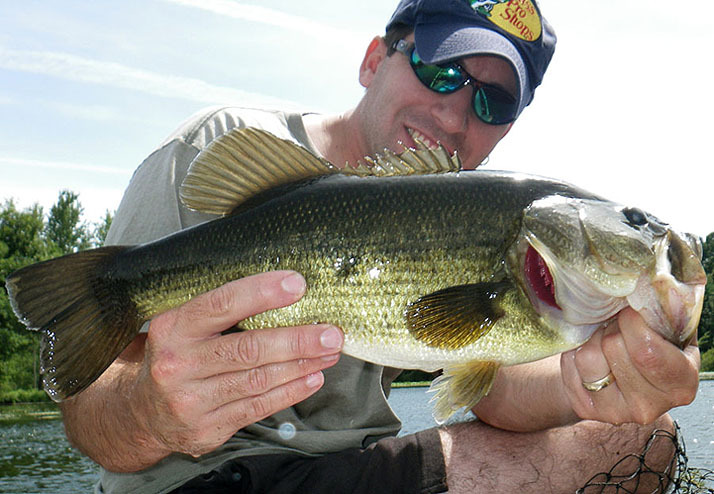 Fish were caught on texas rigged rubber worms. 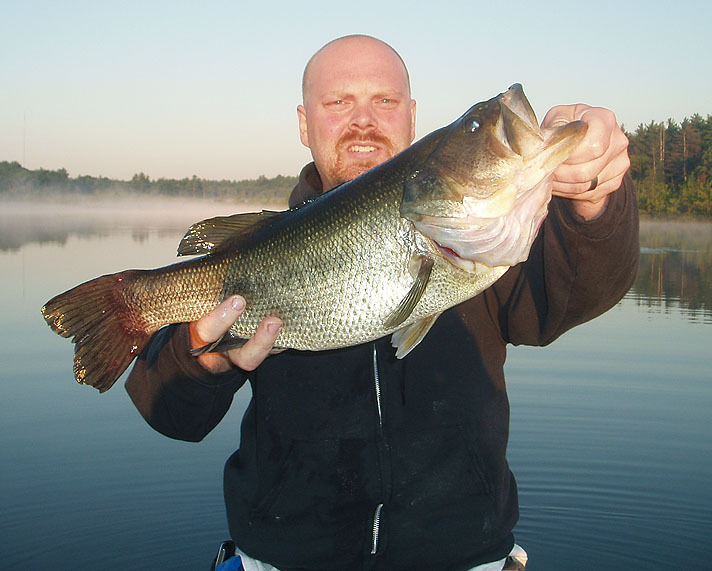 Bill estimates that one fish is around 3 pounds and the other around 4 pounds. 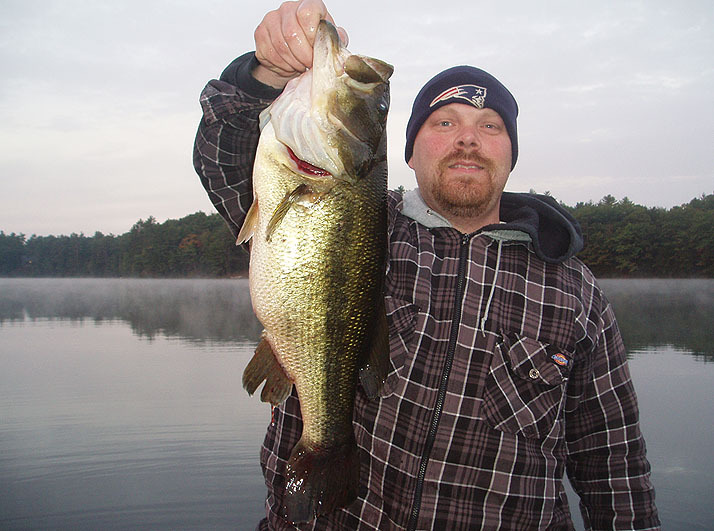 Neil from Texas wanted to know if there were any bass fishing options in MA, he asked since he will be moving out this way soon. 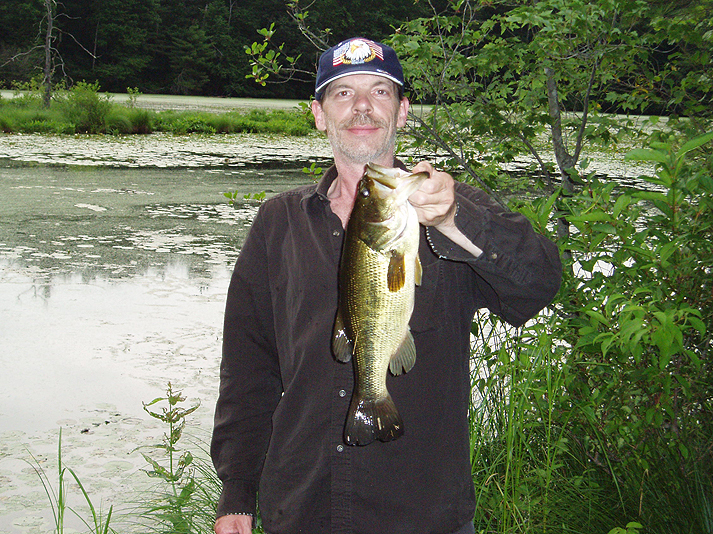 He was happy to here that our ponds, lakes and rivers all have largemouth bass in them and sent us a couple of pictures. 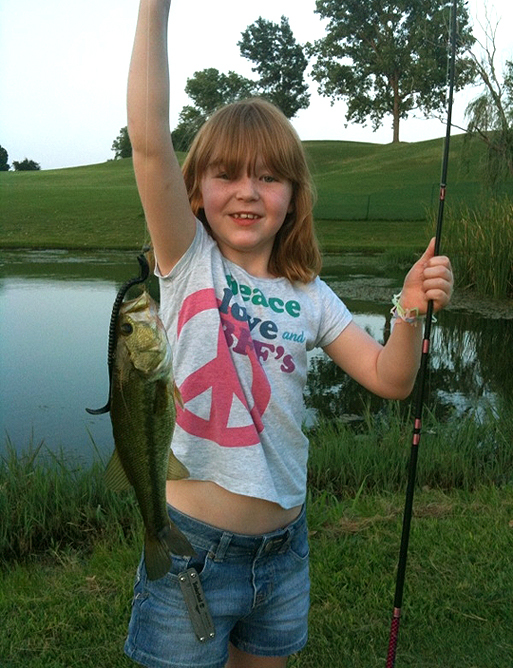 His girls 7 and 5 years of age fish their Golf Course pond a few times a week. 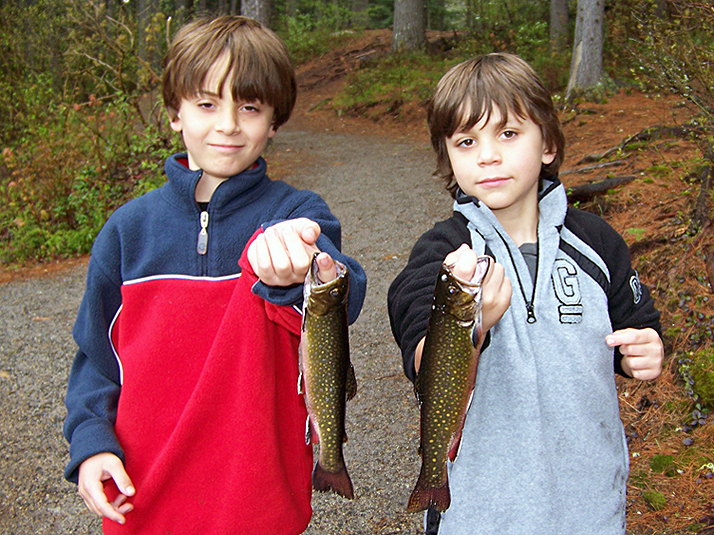 I took 2 of my 3 boys on a hopeful Trophy brook trout fishing trip. We were on a mission to put a wall hanger in the boat. 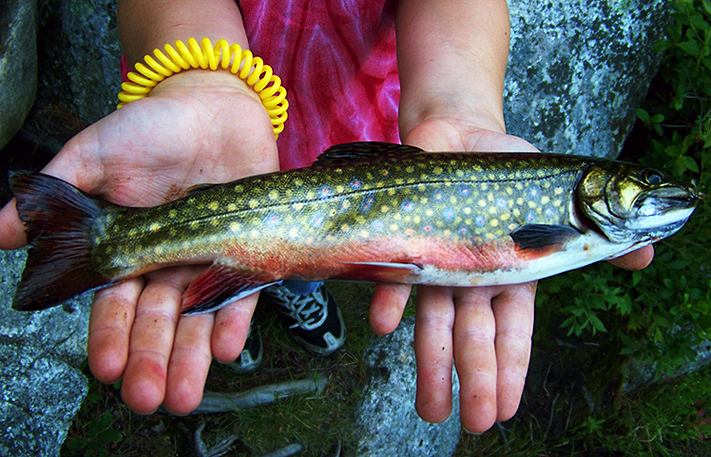 We headed up to NH for 3 days of brook trout fishing. 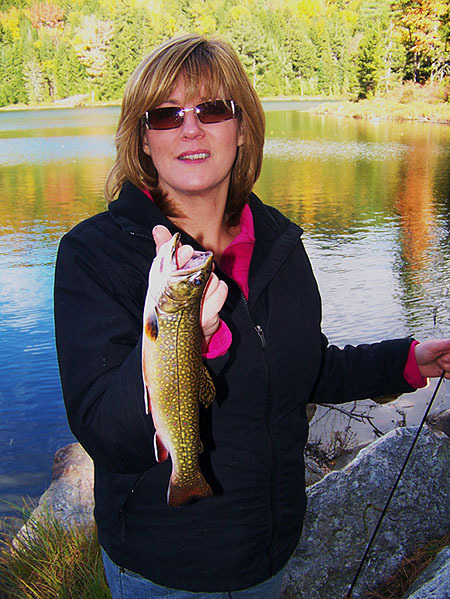 Our plan was to hit 2 lakes managed as trophy brook trout fisheries. The first night we did it on our own. We trolled on a fly rod only lake in my 12 ft canoe, with my oldest son Mike 14 years old this year, its a little easier he can lift and carry most of the gear. My son Skylar 9 years old is still getting the hang of the fly rod, so he gives it his all to keep up with us. On our first pass both of them hooked up, Skylars was on the small side, we knew because of the bend in Mikes rod was larger. We also knew because we landed both! 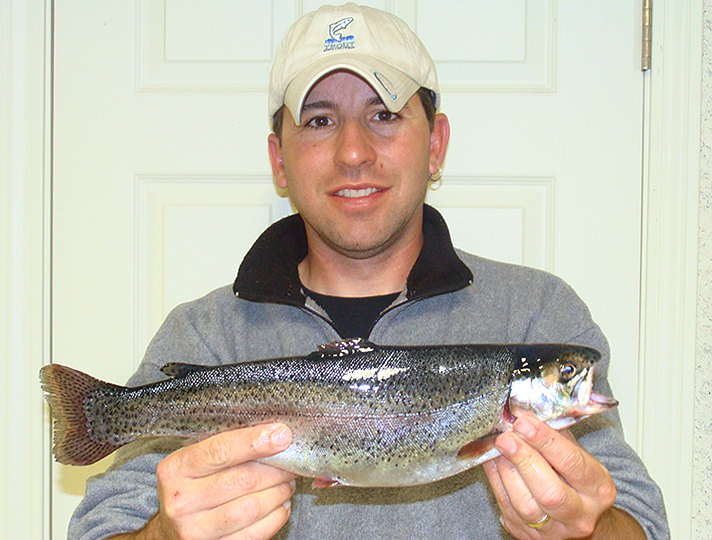 Mikes was 13.5" and a very colorful male, Skys about 9". On the very next pass we hooked up again, Mike was into another good one 15.5", a long lean Male with a bright orange belly. We ended up with 5 the first night. The next 2 days we fished with guide Richie Bernard of Fin Fighters. Richie is a great guide he really plays by the book. He knows a few tricks that helped educate me. 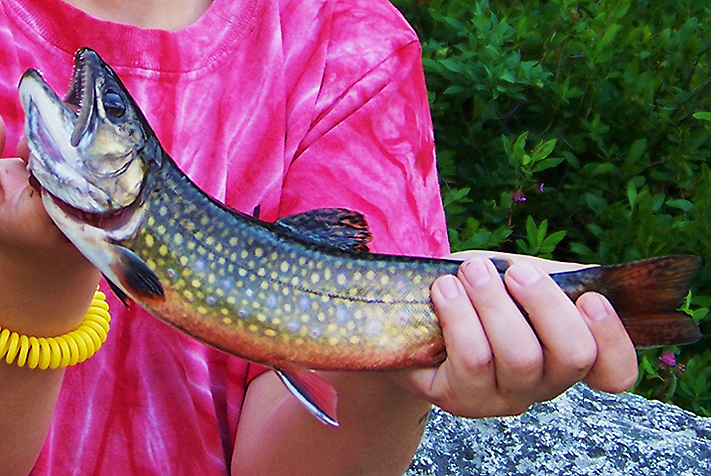 We caught plenty of brookies the next couple days. Richie puts on the best shore lunch. It really helped that we used a guide, its very, very tough to fish if you have a younger kid with you, between the line issues and tying on flies and guiding him while landing the catch...This time I got to fish. Skylar hooked up by far the most and lost 15 trout. He landed 6 over 2 days. 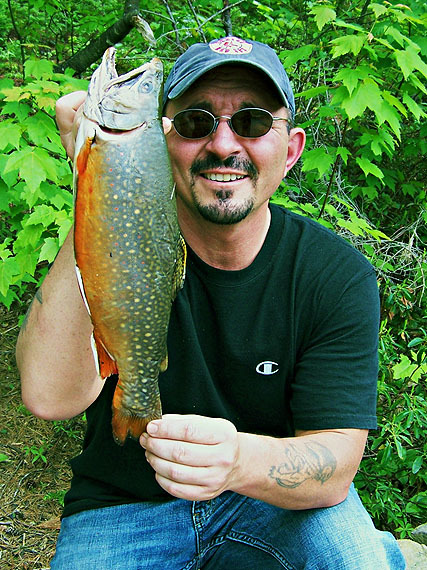 At one point he had what looked like a large brookie come off because of his inexperience with a fly rod. The highlights of the trip were seeing a Black bear and her cub on the mountainside and a beaver came out every night at 5:00 to build his dam. 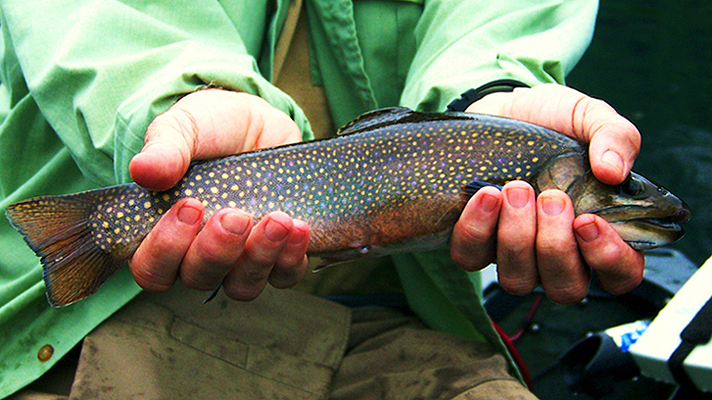 The top 3 brookies were all caught by Mike a 13.5", 14.5" and 15.5", between 1 lb 8 oz and 1 lb 12 oz. We never did get a wall hanger in the boat but the trip was a great bonding experience for me with my boys. 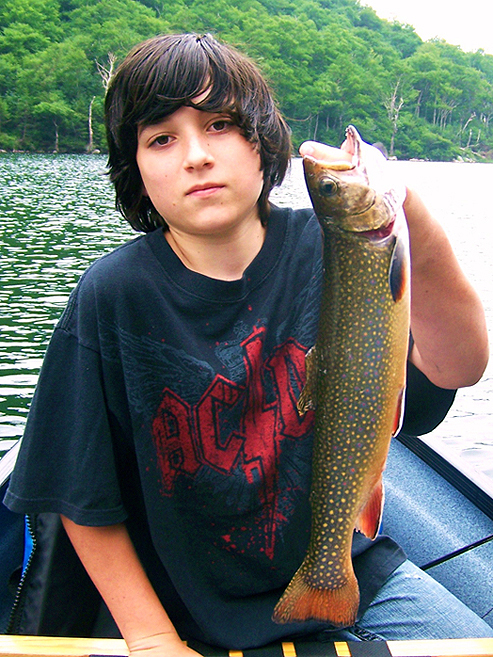 Take your kids fishing Mike Deloia! 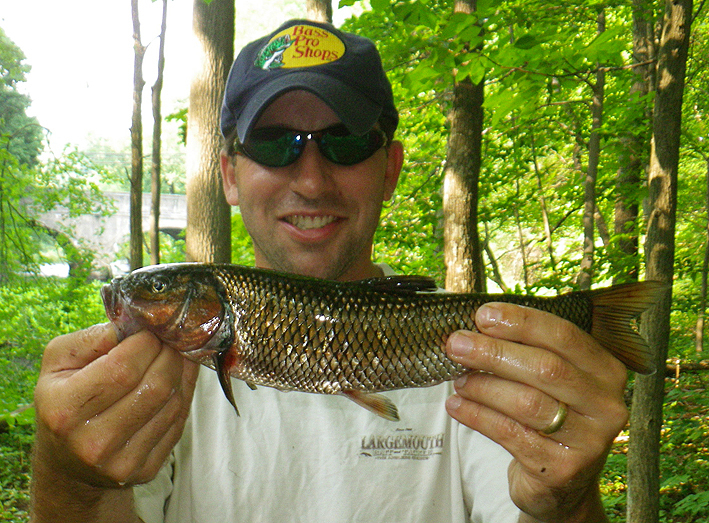 Being a multi-species angler at heart I get bored targeting the same type of fish species over and over again. Every year I try and target something different or try and improve on a species I have not had much opportunity to target or achieve the success I wanted. For me successes is landing something new that I have never caught before or improving on a species by catching a trophy specimen or something of respectable size, basically a new personal best. 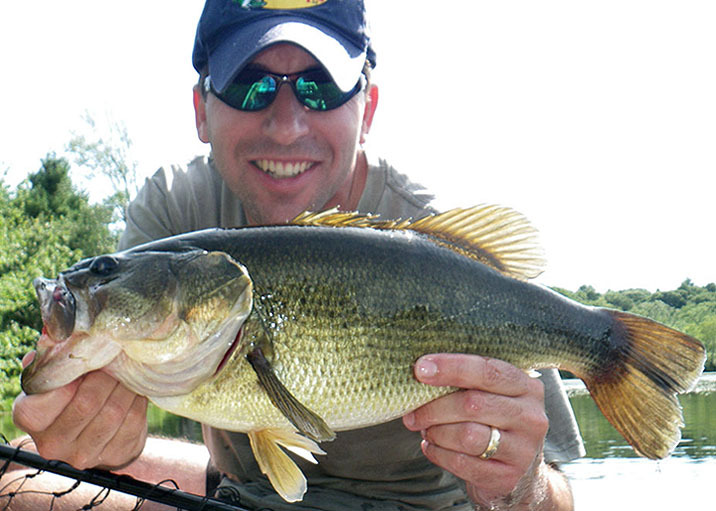 As an angler when I'm successful it’s very gratifying and even more so when I achieve that success in my local waters. 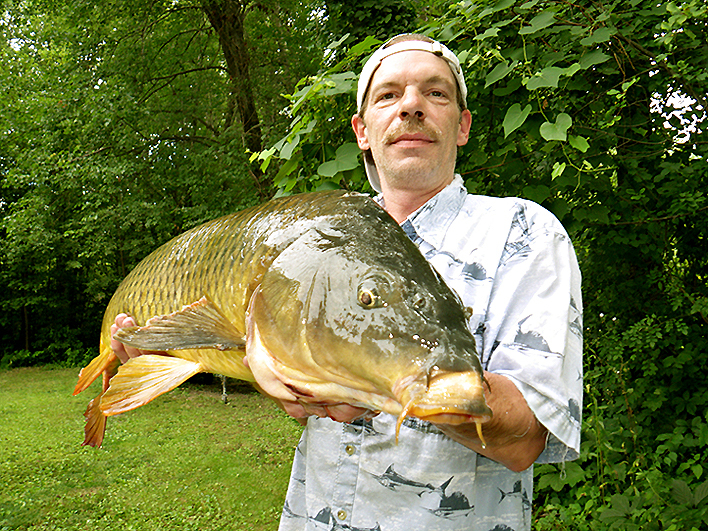 This year one of the fish I set my sights on was the much over looked Carp. 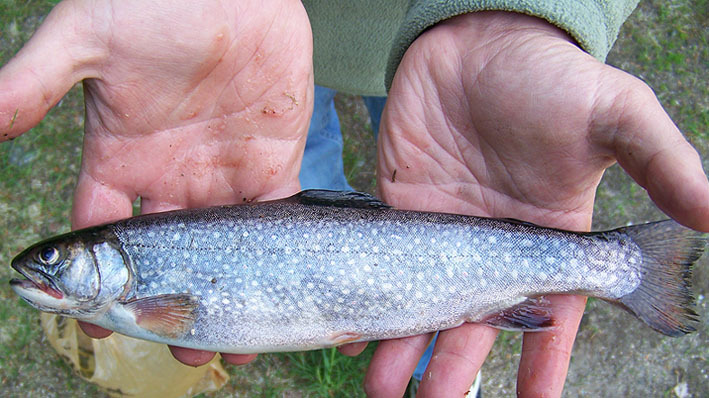 These fish are the fresh water kings in Europe. 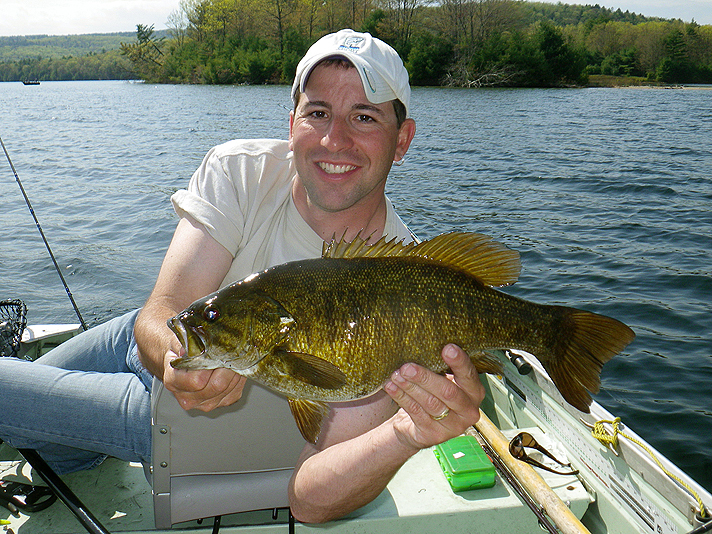 However when you compare the number of US anglers perusing fish like, largemouth bass and trout. 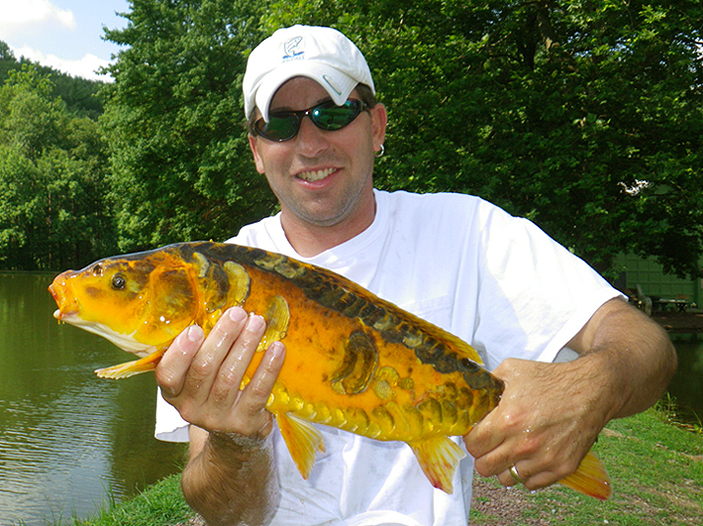 Carp anglers are in the minority (popularity is increasing every year). 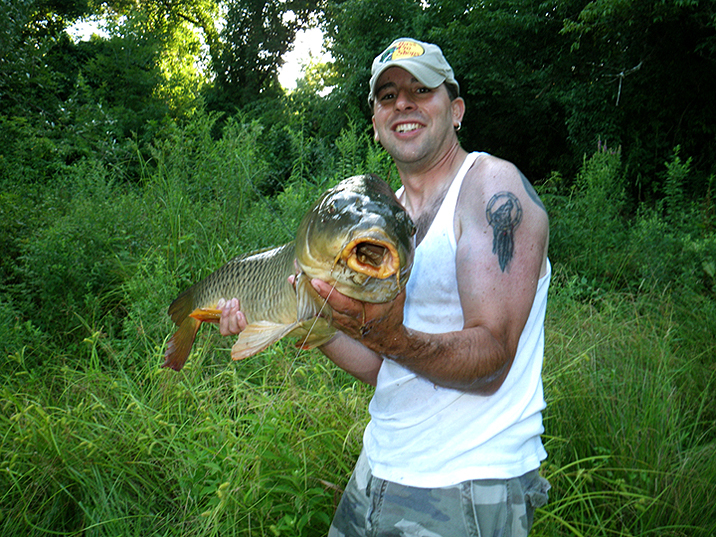 Some anglers even hang on to the old stigma, that carp are trash fish; luckily I see through the ignorance and have fun pursuing them anyway. 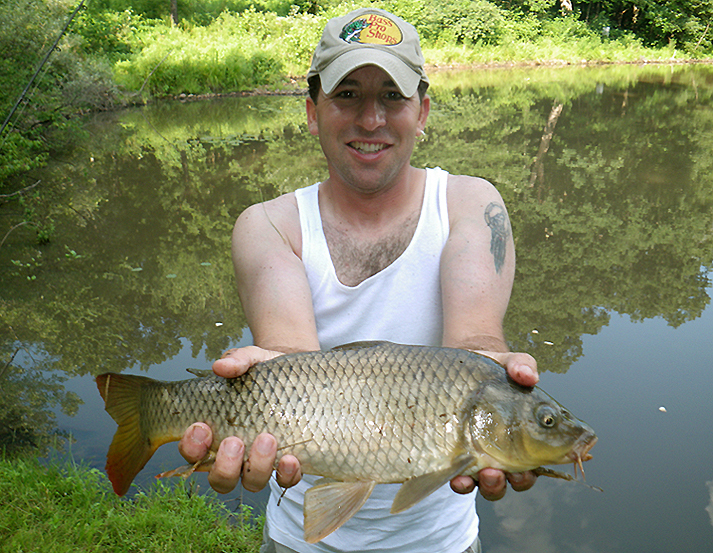 About 4 years ago before moving to a different part of the state I started messing around and fishing for Carp out of the Blackstone River. 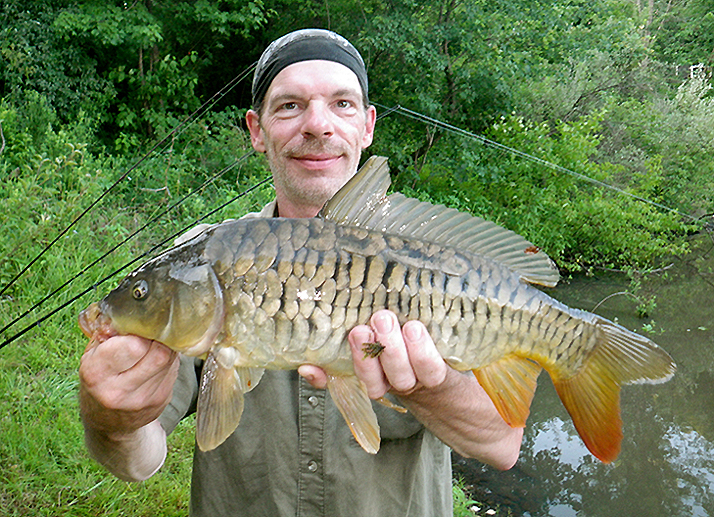 Most were mirror carp and also mixed in were occasional common carp. 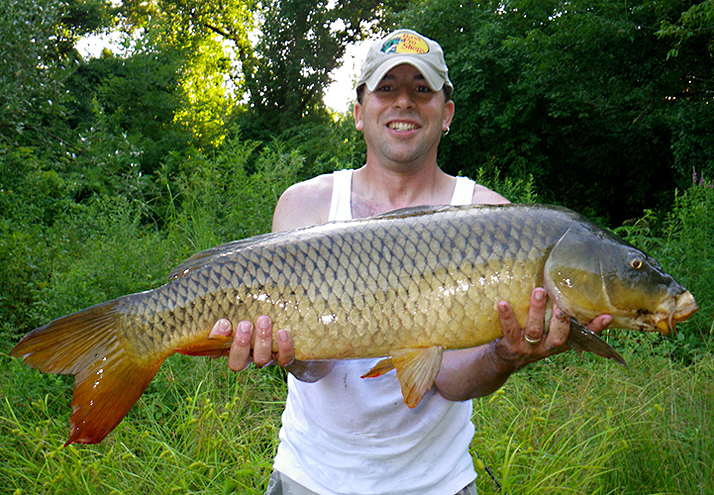 Not long after discovering the carp fishery the wife and me moved, cutting short my efforts for catching a large carp. Before moving I did mange to catch a good number of them but I never landed anything in the teens. Fish that I’d landed were always 10 lbs or under. Though I occasionally would see some massive size fish I could never hook any. Either they were onto me and were extremely skittish or the smaller carp and sunfish would get to the bait before the big carp could. 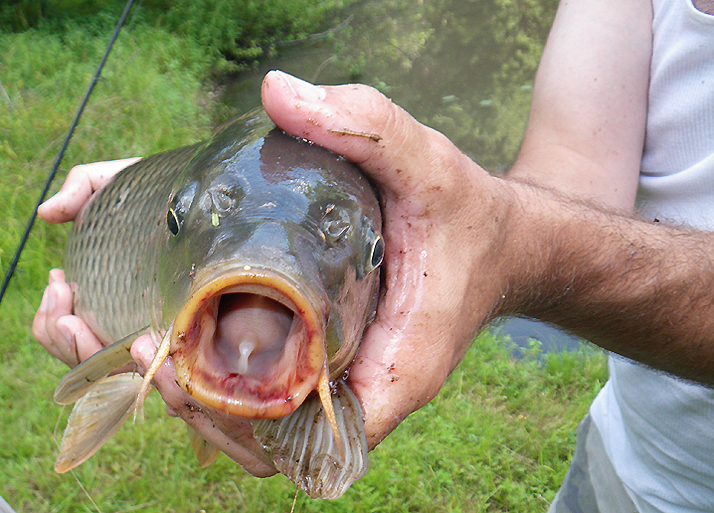 Carp are certainly not dumb fish. Since having caught carp before my goal for revisiting carp fishing was to catch one large enough to qualify for a MA state pin award. In order to do so I would have to catch one 15 lbs or better? I ended up achieving this but it didn’t come easy. My fishing buddy Bill was also up for a change of pace and wanted to try and target some carp as well. 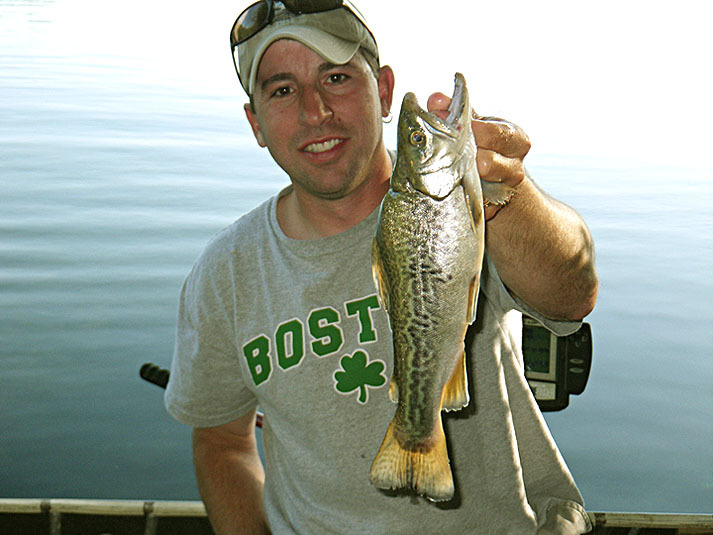 So we teamed up and on our first attempt we hit a section of the Assabet River and we were close but no cigar. 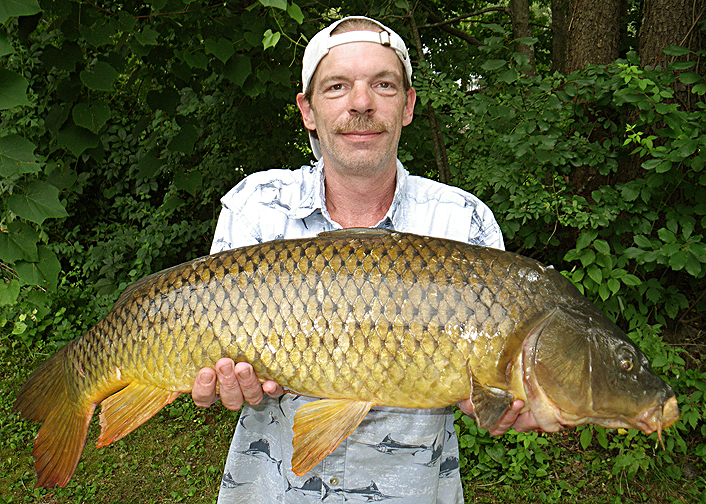 We hoped the carp would be there and they were. We could clearly see them swimming around in this one area. We brought corn and bread for bait. It seemed like we were going to sight fish for them and it was going to be easy but not the case. As we were rigging up a bunch of young small kids moved in and started throwing rocks and casting lures at them. Scaring allot of the fish away. 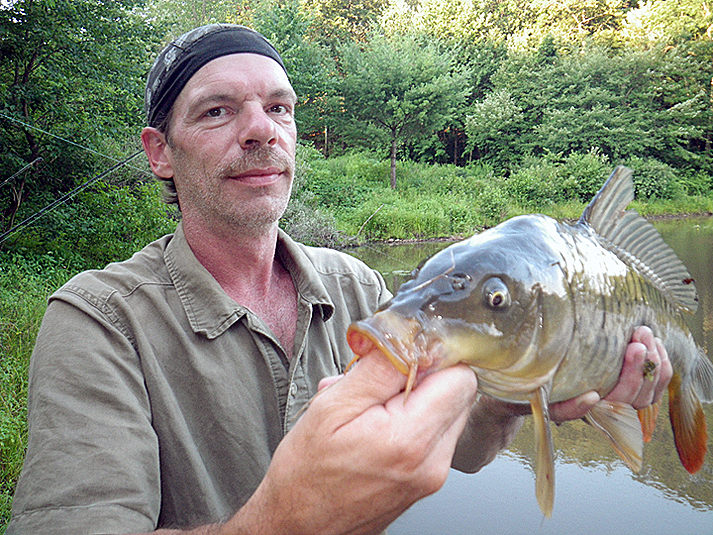 We gave it a shot anyway and it seemed every time a carp came in to investigate my offering the bluegills would eat all the bait before the carp even had a chance. The closest I got was one fish spitting out a bread ball before I could set the hook and another one looked like it was interested and then at the last minute turned away. Bill did a little better but not much, he borrowed a rod from someone and never checked the line. He had a monster carp take the bait of the bottom and run. 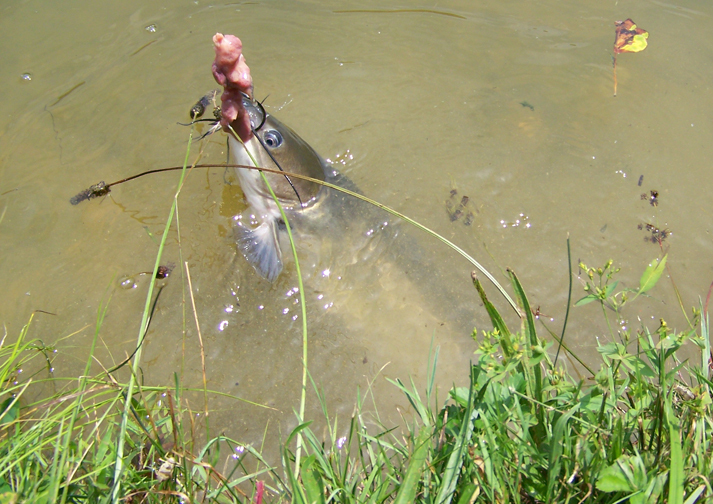 He fought it for a little bit, the massive fish even leaped for us in it’s attempt to flee. The fish ended up breaking Bill’s line and when he checked the line he discovered he lost his fish due to his line being all frayed up. That was it for action that evening. We made another attempt or two at the same spot but they were never around again. It was a here today, gone tomorrow deal. 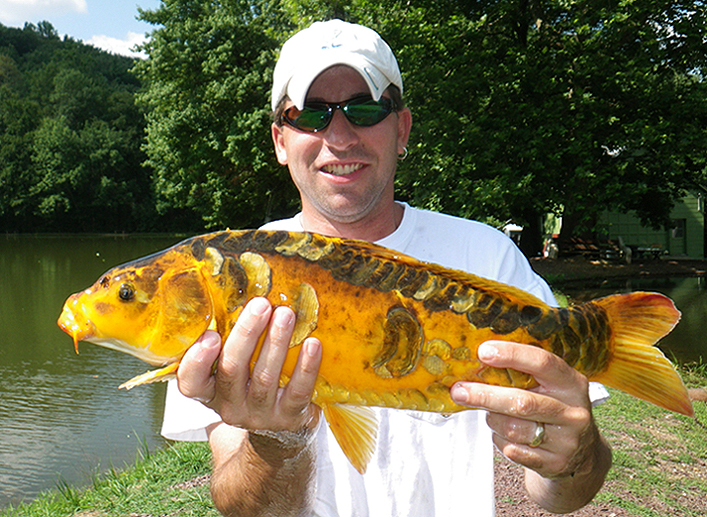 After a little research and connecting with another angler I even made a road trip to the Connecticut River, which is said to be one of the best spots in the state for carp. Met some cool anglers but none of us caught any. I only got one bite but did see some break water but hey that’s fishing sometimes. On another day Bill and me hooked up to go bass fishing. 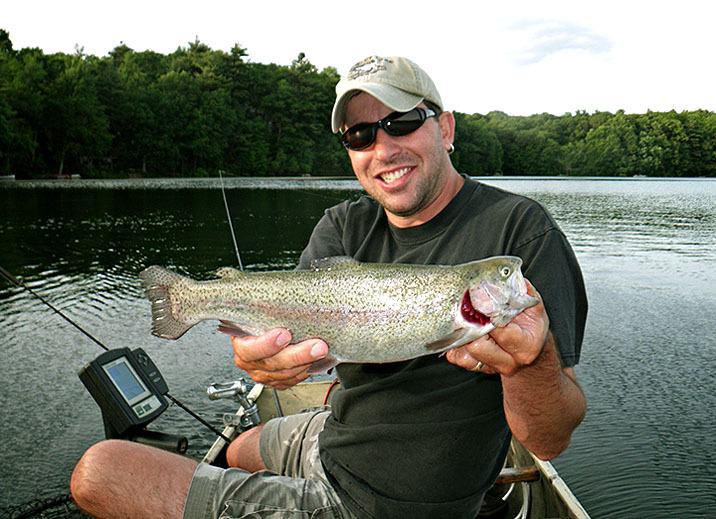 He suggested we fish a tributary pond off the Assabet River that has some largemouth bass but that might also have some carp too. Well we fished it and our bass trip turned into a carp trip. I caught 3 and Bill caught 3. All were small fish except for my 3rd, according to my digital scale a 17 lbs 8 ozs fish. When it hit I new I had a big fish on, she broke water and made a screaming run into the lily pads. In order to land the fish I had to take my sneakers off and empty my pockets and wade into that nasty, muddy brown water and pray I didn’t step on any broken glass, so I could untangle the line that was wrapped around the lily pads and I hoped she was still be attached to the other end of the line and luckily she was. She made one last run and then tired out and I was able to beach her on shore. The bait shops in the area ate the time were closed. So we put her in a big fish cooler, set up with plenty of pond water and an aerator and then transported her to a giant live well, so that we could keep her over night and get her officially weighed in the next day. The next day we did just that and brought her to a certified weigh station. She obviously more than qualified for a state pin. After the weigh in we brought her back to the pond and released her alive and well, to fight another day. To top it off later on that week me and Bill made yet another trip and I hooked another monster carp I brought to the net that we estimated around 15-16 lbs (a fat fish) but due to some unfortunate circumstances that one never got photographed or weighed but is alive and well in the pond. Mission accomplished. TIGHT LINES! Check out the new video I put together of Bill and I trying to capture Common Carp big enough to win a Massachusetts Bronze Pin Award. 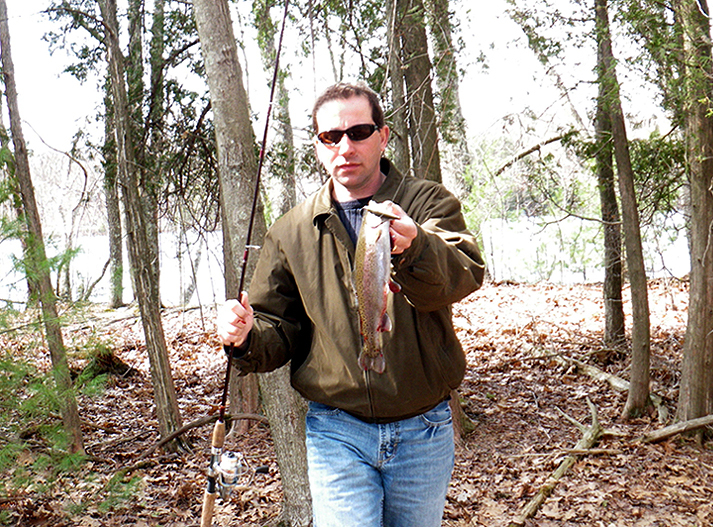 Shore fished a spring fed pond that holds trout all year. Nothing serious just messing around while in the area for a couple of hours. 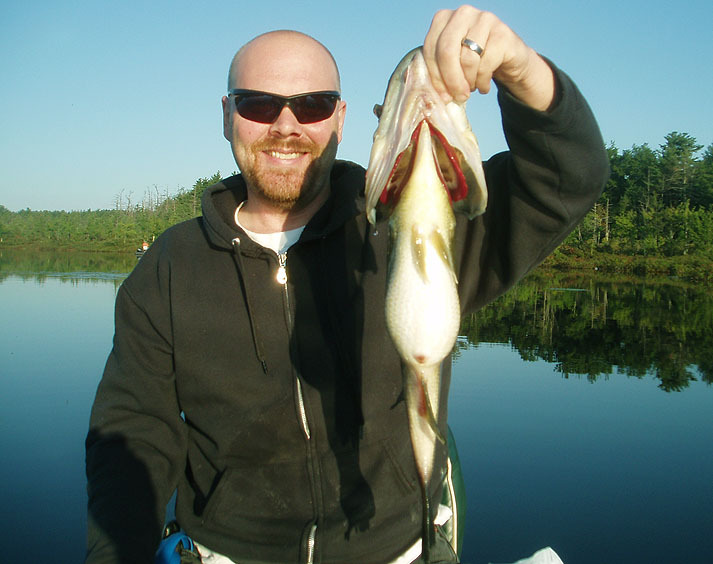 I caught largemouth bass, small pickerel, bluegills and a few rainbow trout. 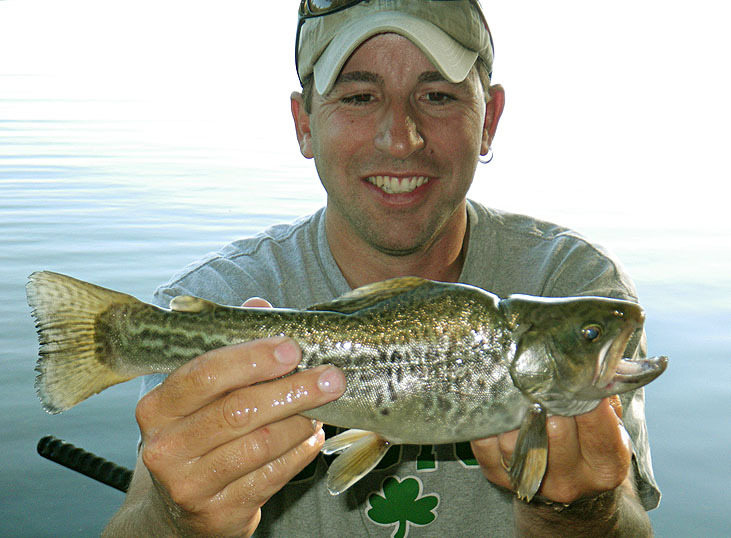 I was primarily switching back and fourth between the trout and the largemouth. For trout I was tossing out fly’s and spinners on my trout rods. 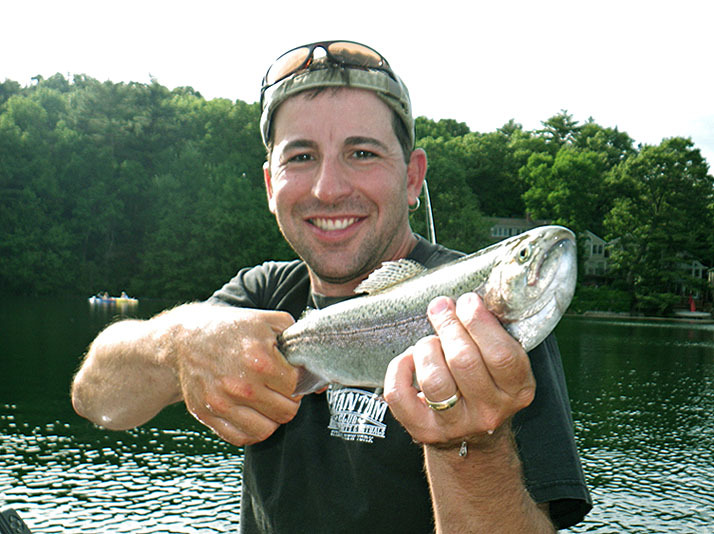 On my bass rod I was tossing out a rubber worm and twitching it off the bottom, to my surprise I landed a nice 14-inch rainbow trout. Not what I was expecting but a pleasant surprise and the best fish of the afternoon. TIGHT LINES! 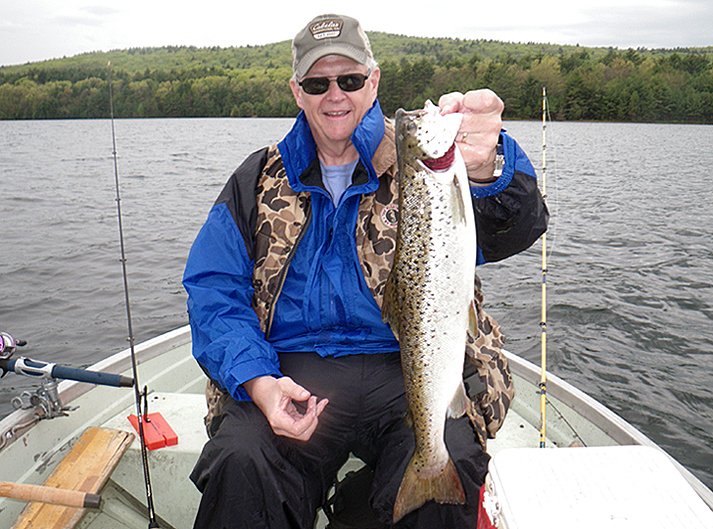 Last Sunday I headed out and fished the Quabbin from early afternoon up to closing time. 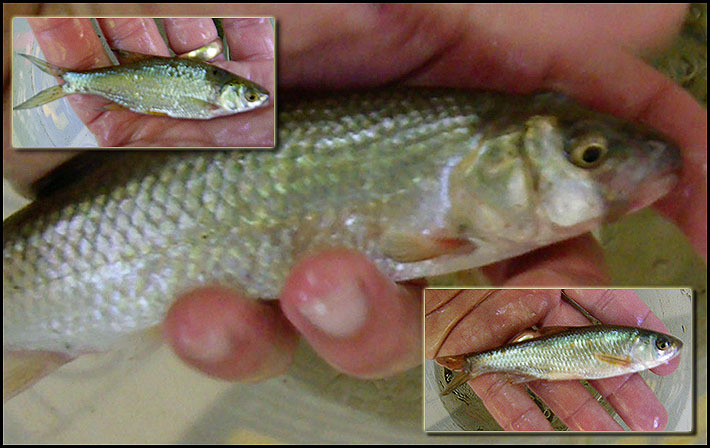 I brought with me some large live dace I had caught 2 days ago from a creek behind my home. The plan was to troll this bait deep for laker's. I knew with the large size bait I was using it would be hit or miss. I figured I’d catch a monster fish or nothing but what happened is far from what I expected. Running live 10-inch bait down about 60 feet I got hit twice but no hook set. About an hour before closing time my rod got slammed and it was completely bent over in the rod holder. I grabbed it and set the hook. I knew instantly I had a big one on and I took my time playing it. I was alone trying to fight the fish, control my boat, keep from tangling on my 2nd line, keep from drifting into a restricted non-fishing area and self net. After a bit of a tug of war battle I finally get the laker up and it’s a whopper. One I’m estimating around 9-10 lbs. I struggle to get its head in the net and before I can even lift the net. 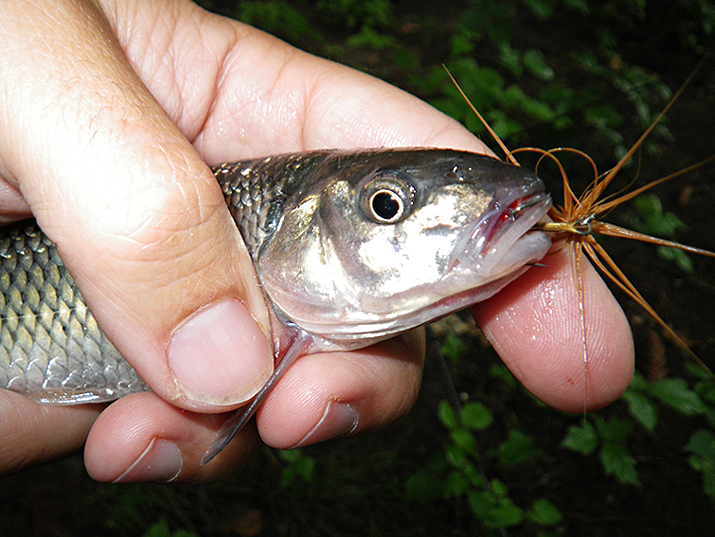 The treble hook that was embedded in the fish’s mouth was now also caught in the mesh of the net. The laker starts thrashing and manages to unhook itself. I painfully watch this trophy pin fish as it swims straight down into the deep clear water. Though I was disappointed and disgusted I looked forward to another chance. The following Saturday I go back for that second chance. 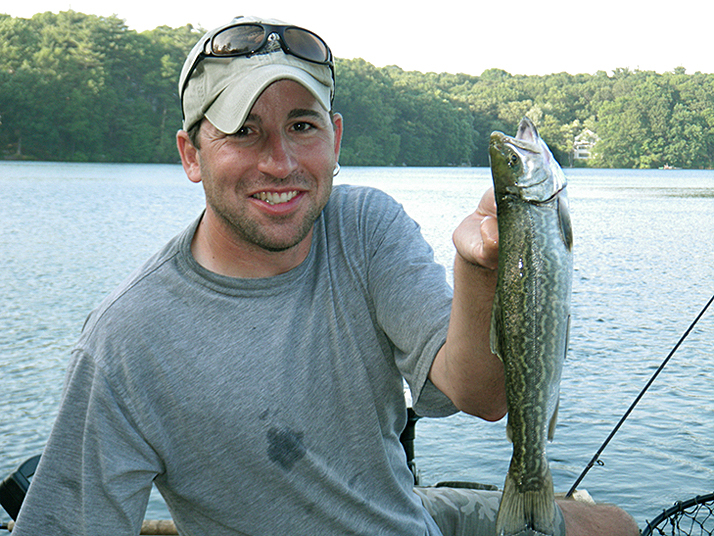 I brought some more large fallfish I collected during the week, so I could repeat the same tactics. I also brought Bill along. After a very long morning Bill and me had nothing to show for it. We got so bored catching nothing that we even took a break from trolling and fished some rock ledges for small rock bass and little smallmouth bass; at least they got rid of the skunk for us. After messing around we get back to trolling and then we see another boat land it’s third laker, while we struggle to hook up with our first. Aggravated, I decide to switch tactics and forget about the live bait. I drop a rapala on the downrigger about 80 feet over 100 feet. 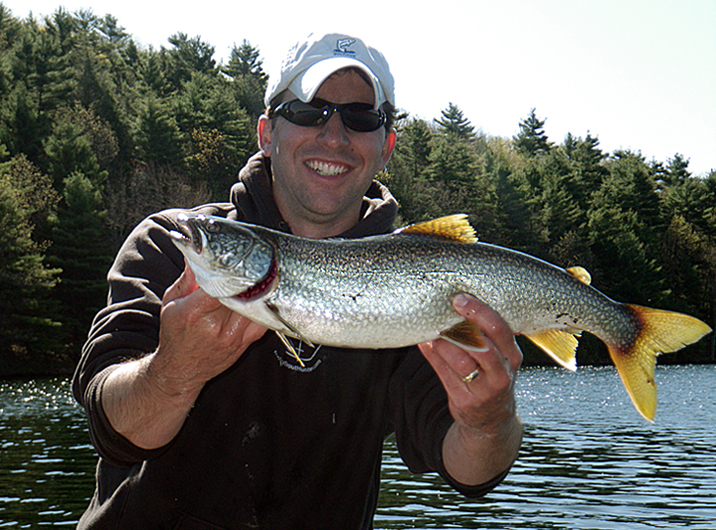 Not long after doing so the rod finally pops and a nice healthy looking lake trout is in the net. 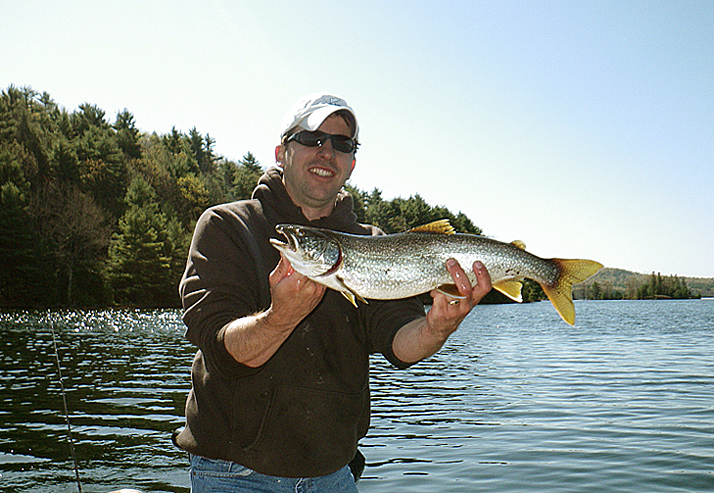 Unfortunately it's size was a far cry from the one that got away last week but a lake trout non-the less. Tight Lines! Decided to meet up with Bill for some shore fishing. The plan was to hit some creeks and try and collect some fallfish/dace in the afternoon and then hit another spot in the evening for some lunker largemouth bass, using our freshly caught dace as bait to try and tempt some hogs into hitting. The plan came together pretty nicely; we caught a good number of dace and some good size ones that were large enough to prevent most of the little rat bass from stealing our bait. Collecting the bait was almost as much fun as bass fishing. 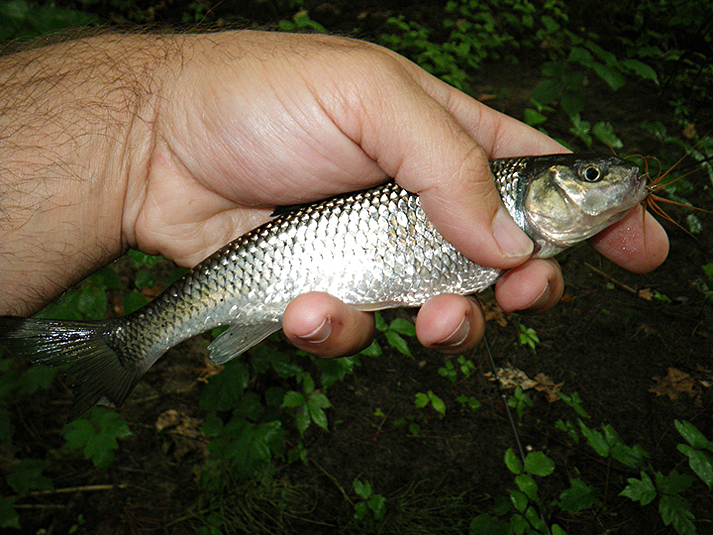 I got a nice little surprise when I landed a 14-inch dace, a monster size for this species and my personal best one. 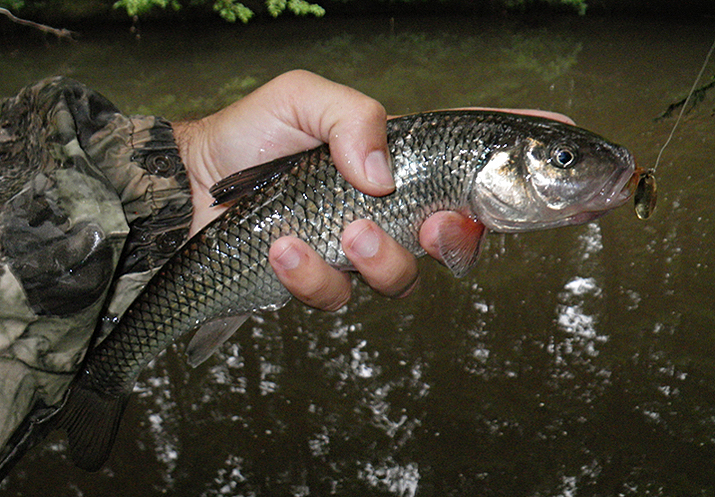 The average dace we usually catch run around 4-10 inches. 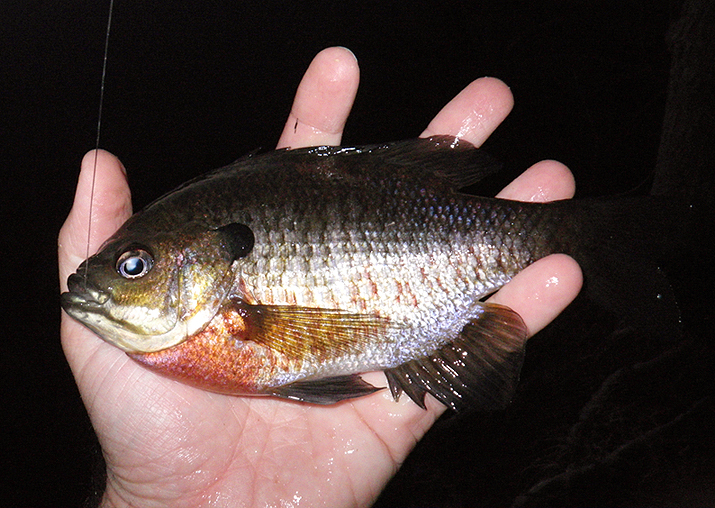 The 14-inch was a beautiful specimen with bright red gill plates. 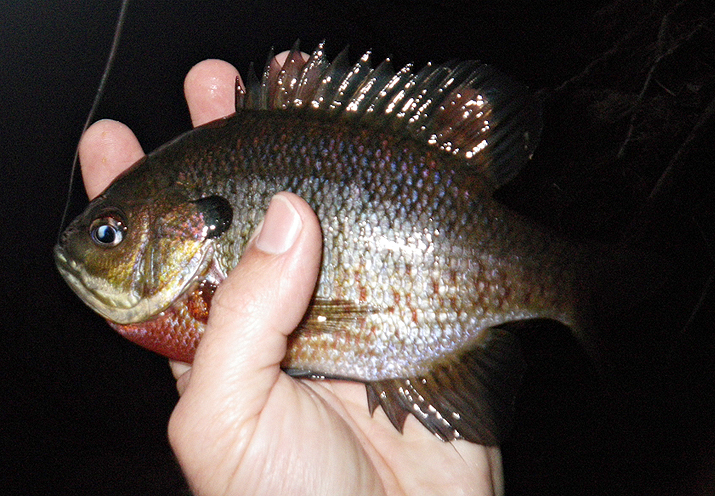 In the mix was also some sunfish. 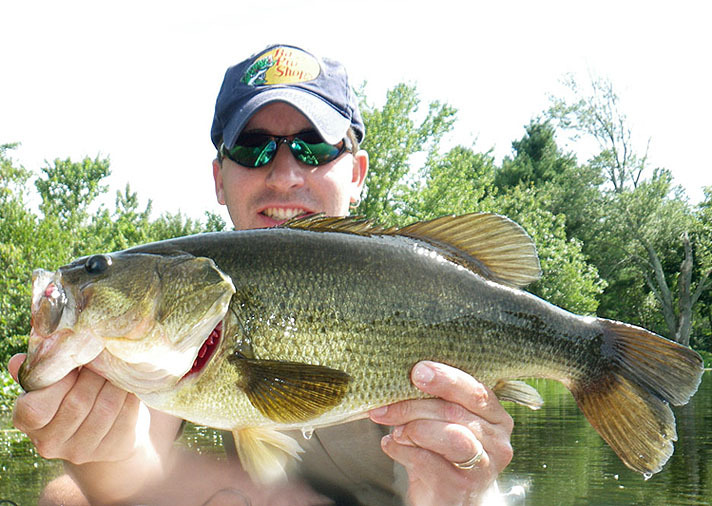 After filling up the bucket with enough monster size live bait, we took our dace and hit the Assabet River to target lunker largemouth. 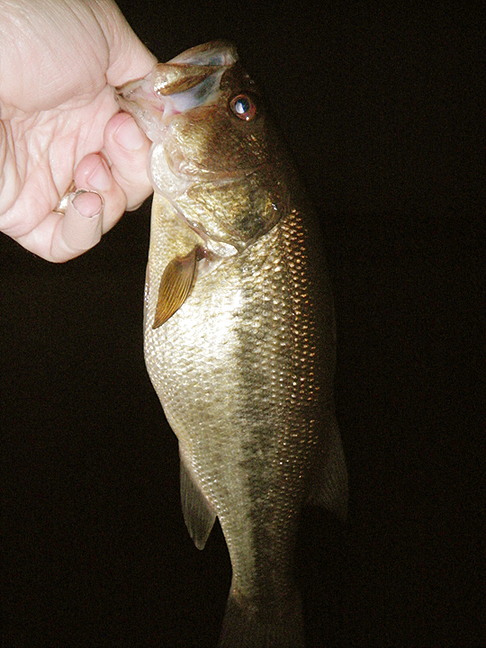 I ended up getting one pretty quick off the bat, a bass around 2 lbs 8 ozs. Then it slowed down. 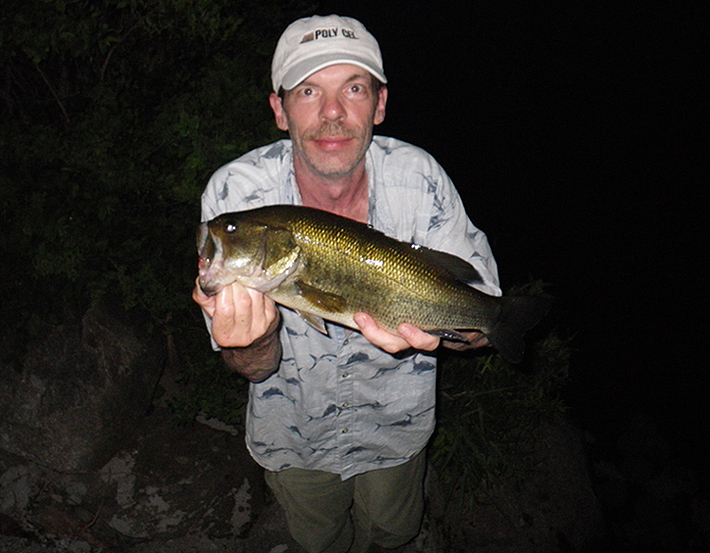 I managed a couple of small rat bass on my second rod on plastic worms. Bill ended up with a couple of bass; both were in the 4 lb class and caught on live dace. So the plan did work but we had hoped for more and larger lunkers but there is always next time. When it got dark the bite was dead but rather than leave we switched tactics and species. 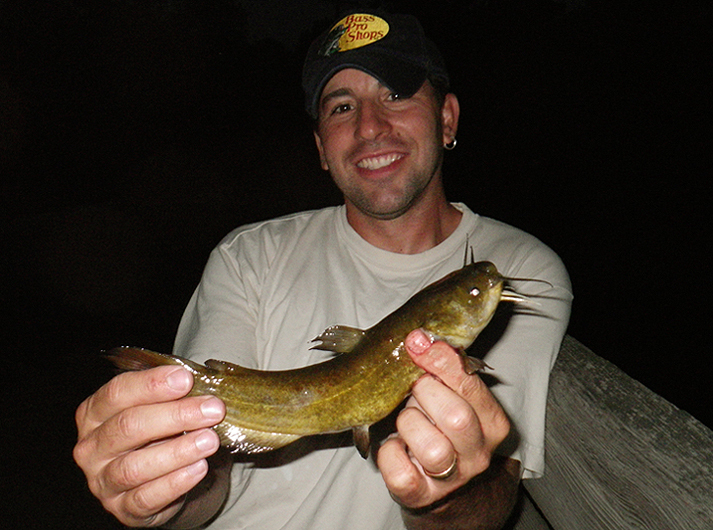 We chopped up some dace, to bottom fish with and try our luck for some bullhead catfish. The bite was on and we both caught our share of cats. The catfish bite was not the only bite that was on, so was the mosquito bite. They were relentless and the mosquito repellant spray didn’t seem to be working. After catching a bunch of cats we called it quits, to seek shelter at home from the mosquitoes and grab a bite ourselves. All and all not a bad day. 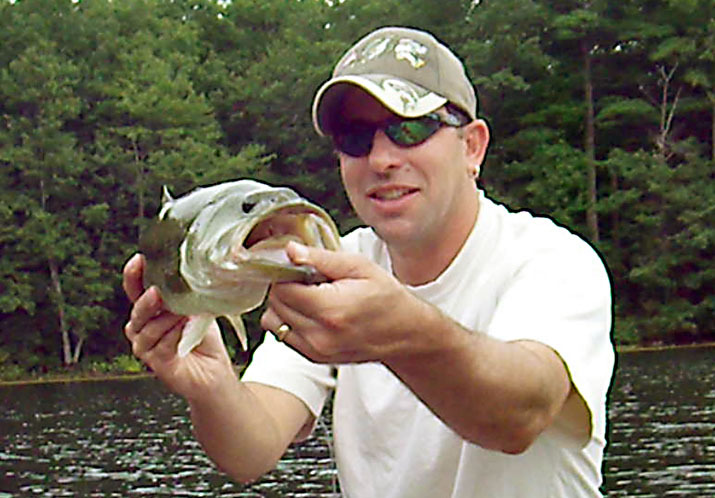 Hooked up with Bert and we decided to hit the Assabet River for some largemouth and pickerel and hoping for some large fish. Unfortunately we didn't start fishing until late morning. It was extremely hot and the fishing was extremely slow. Bert didn't connect with any fish. 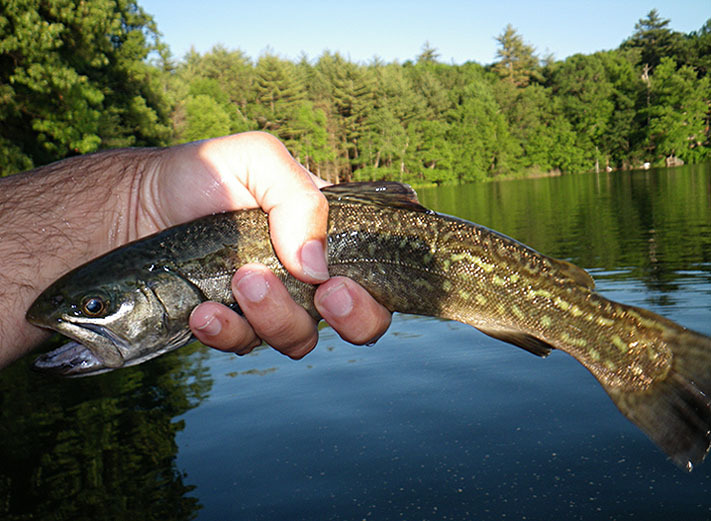 I landed two small rat bass and a decent size pickerel around three and a half pounds. The heat was insane and not much action, so we split early. I should have gone with another option that I was considering but I suppose it could have been worse. TIGHT LINES! I only had a few hours to fish and needed to stay local. In fact I stayed so local, I never even got in my truck. Behind my house is some town conservation land with a river that runs through it. About 3-4 years ago on my first backyard trip exploring and bow hunting the property I ran into this river. It was only a 10-15 minute walk from my house. Since that day I wondered if there was anything in it worth casting a line at. I planned on eventually fishing it and checking it out. Most of the river is pretty transparent and shallow and narrow, however there are some wider sections, with some deeper pools. But I just assumed there probably was not much in it. About every winter I usually squeeze a trip behind the house for a little bow hunting and every year when I run across the river I'm reminded of another fishing season of mine that has passed and overlooked this river again. There have been a few rare times I thought of it but quickly passed it up for more fruitful water. But finally I decided to grab a rod and load a back pack with the needed gear for the day and give it a shot. As I found myself walking through the back yard and into the woods I started to hope that this backyard exploration would not be a waste of time. 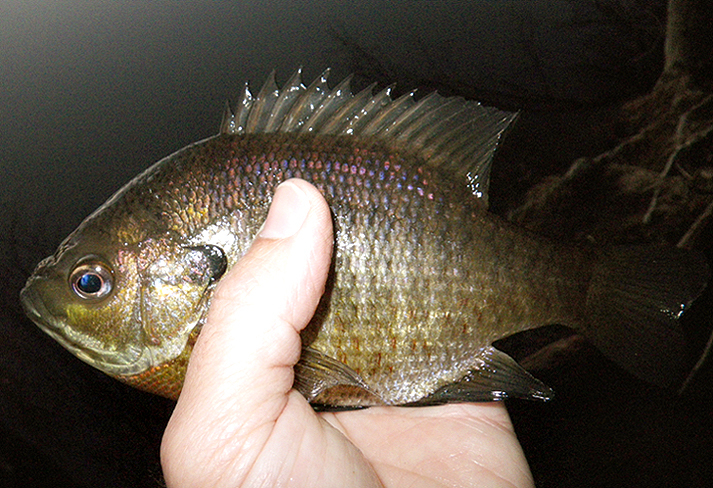 The river is not stocked and I doubted there would be much for any warm water fish like bass and sunfish. However I thought there might be a good chance at finding two species that I had in mind. Such as carp but I never hooked or seen one. The other fish I had hoped to find and catch was there. In fact this species was very plentiful and struck my lure in every pool I casted into. 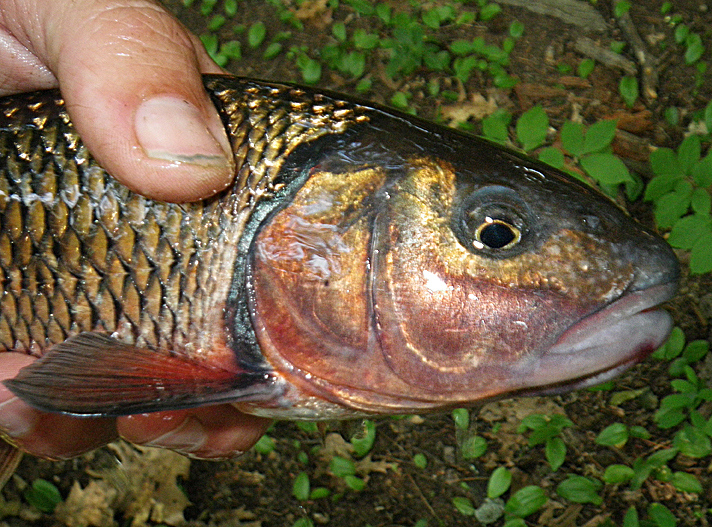 The species I'm referring to is the Fall fish. 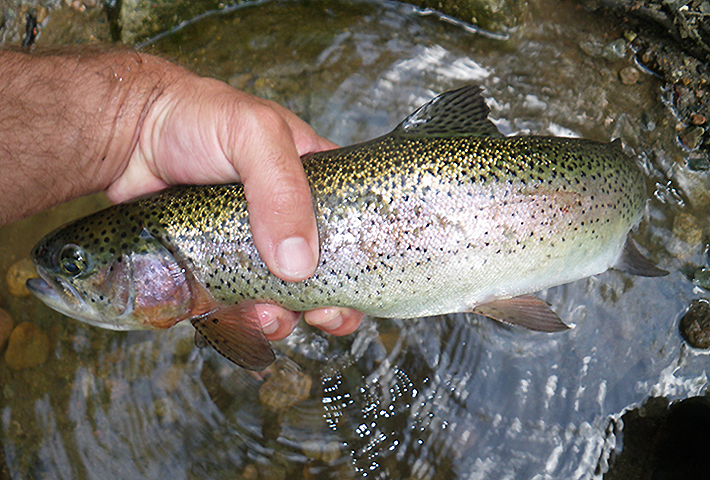 Allot of anglers have not heard of them but those who fish rivers often enough incidentally and occasionally catch them while trout fishing. 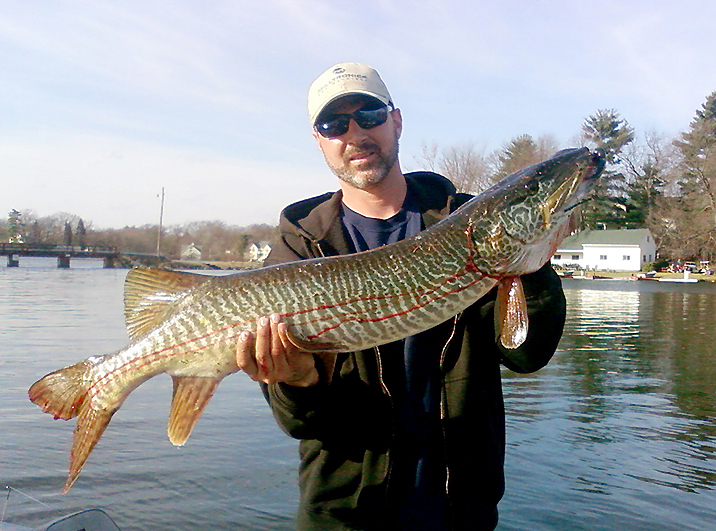 On this day they ranged anywhere is size from 5 inches all the way up to a 13-14 inch specimen. Most averaged 9 inches. 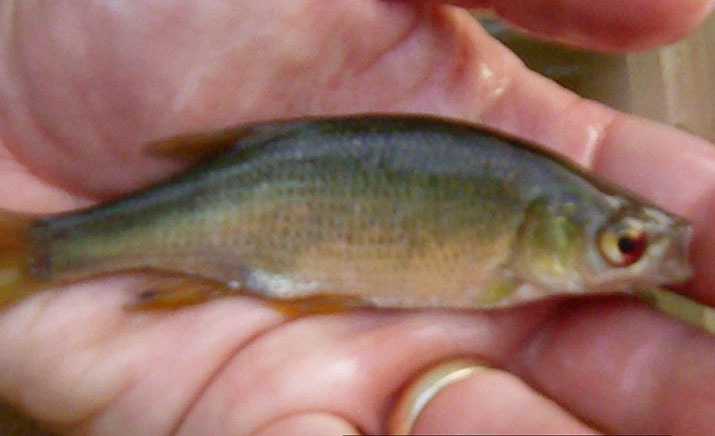 Another common name used for this fish is dace. They are not shy at striking your lure and I lost count of how many I caught. What got me excited about this backyard fishery is that it's so close from my home and it's something a little different to target than the usual stuff. But more importantly I found a source of some monster live bait. 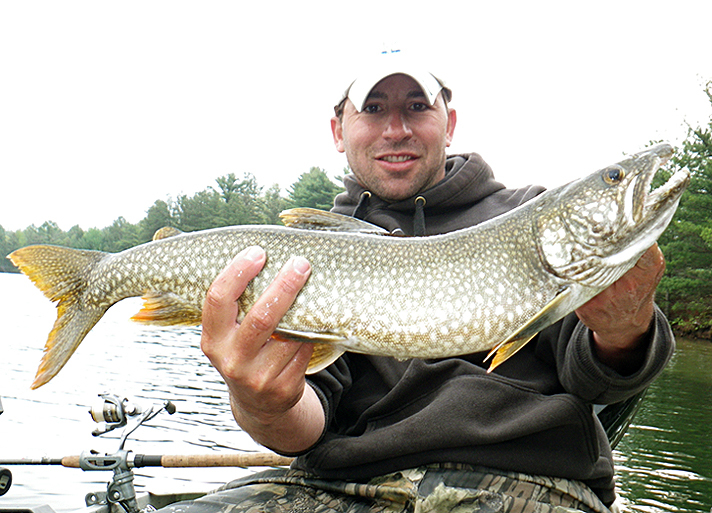 Fall fish are like candy to large pike and largemouth. Though I fish artificial's most of the time, I'm not opposed to live bait or bumping up the odds a bit with some mega size live bait. 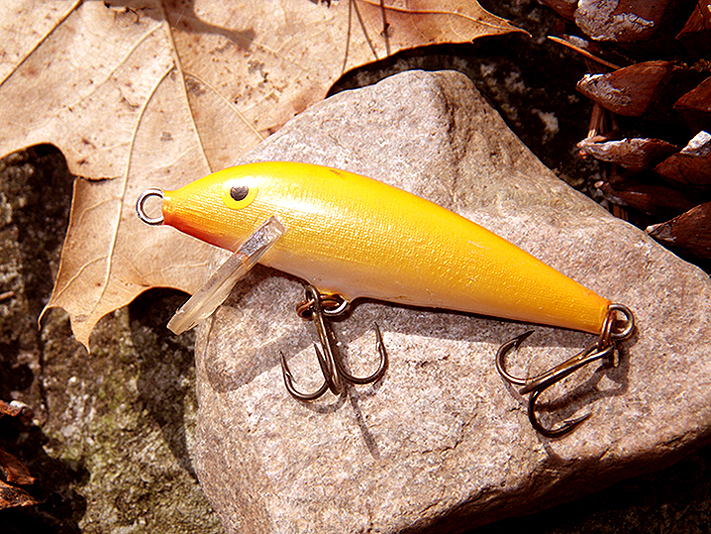 Going to try some fall fish as live bait for pike and bass. 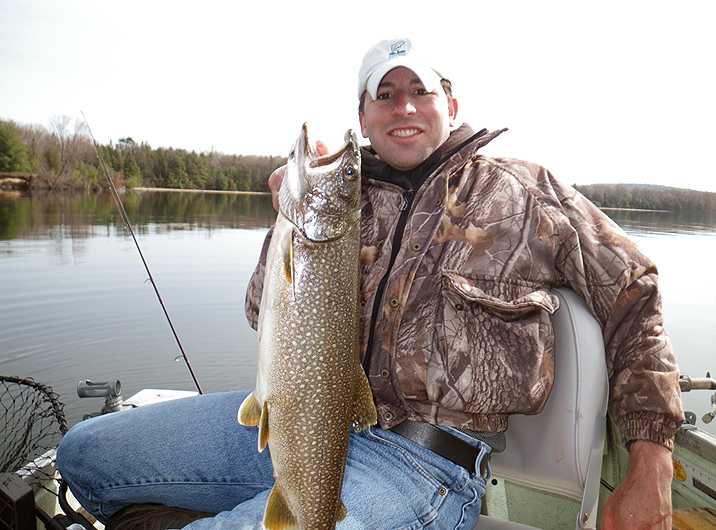 Maybe even for smallmouth and lake trout over the summer. 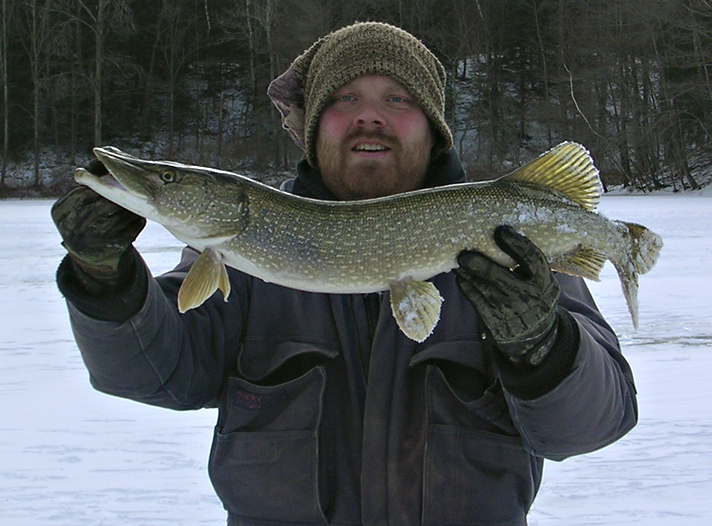 I also plan on collecting some later on in the late fall, for the up coming ice fishing season. It's going to get interesting, stay tuned. Tight Lines all! Had the afternoon free and decided to go at it again with the trout. 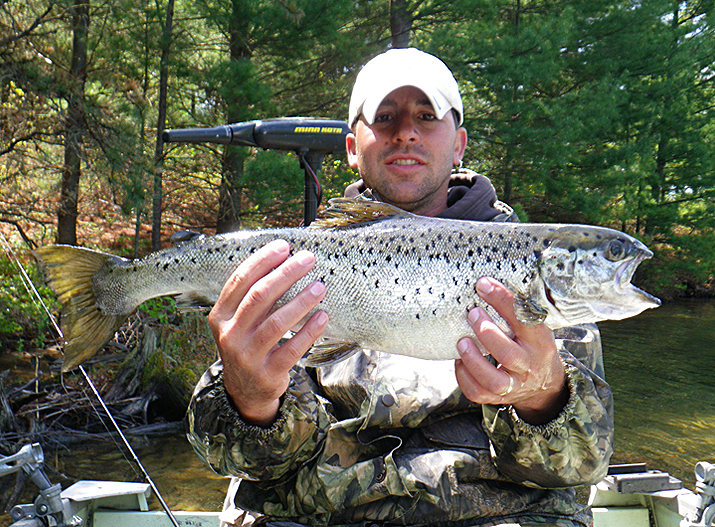 After boating a 3 lb and 4 lb 4 oz trout on previous trips. I thought to myself let’s see if there are anymore big ones and headed to the usual spot I’ve been fishing the last few or so excursions. The fishing was decent but I didn’t land any large fish this time or get the numbers I had gotten on other recent trips but that’s fishing. I picked up about 5-6 rainbows and a couple of tigers. 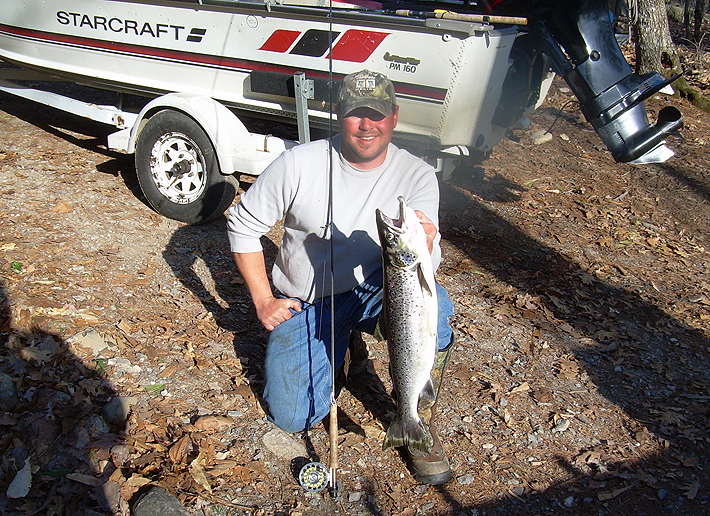 Most fish were caught on the fly rod and a couple were caught on the lead-core rod. I kept a few of the hatchery put and take trout for dinner tonight and the wife did a hell of a job cooking them up and it made for a nice treat with a cold one. I think I've had my fill with the hatchery trout though. At least for a little while and need to move on and fish for something else next weekend. Tight Lines All! My good friend Ray joined me for an early morning excursion I wasn't even sure if he would be joining me until I heard a knock on the door at 5:30 AM in the morning. Which is a story within itself, one I wont get into but all I can say is unbelievable. Anyway Ray was ready and 5 minutes after the knock so was I. 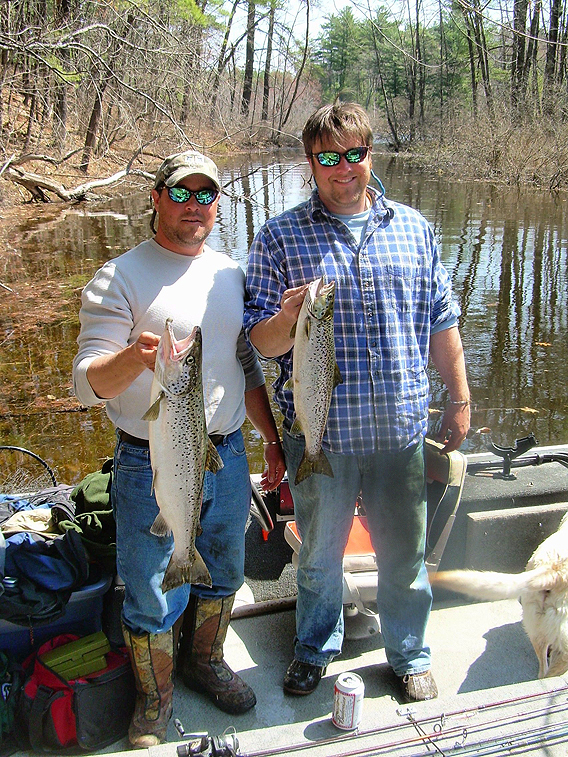 We debated hitting The Quabbin or doing a canoe trip to some smaller trout water. After telling him a few stories and the numbers the wife and me had been getting into and since it was a bit of a late start for the Quabbin. 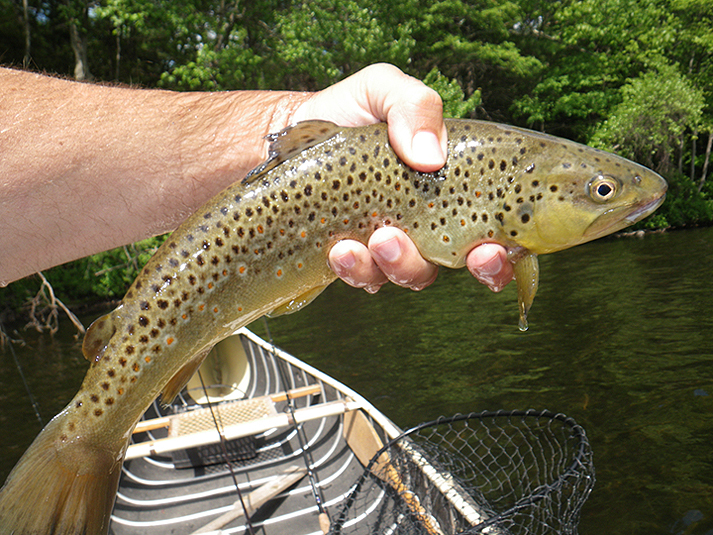 It was decided to take the canoe and we were off to fish a favorite trout pond of mine. Surprisingly the early morning trout bite was not what we thought it would be. We had to work for them and picked at them sporadically, all rainbows. 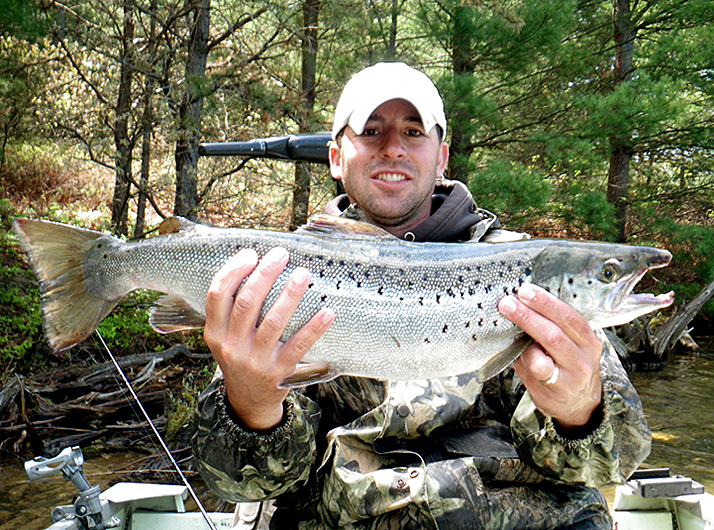 Late in the morning Ray hooked up with his personal largest trout to date in MA. After a long careful battle and struggle on 4 lb test, I slipped his fish head first into the net. 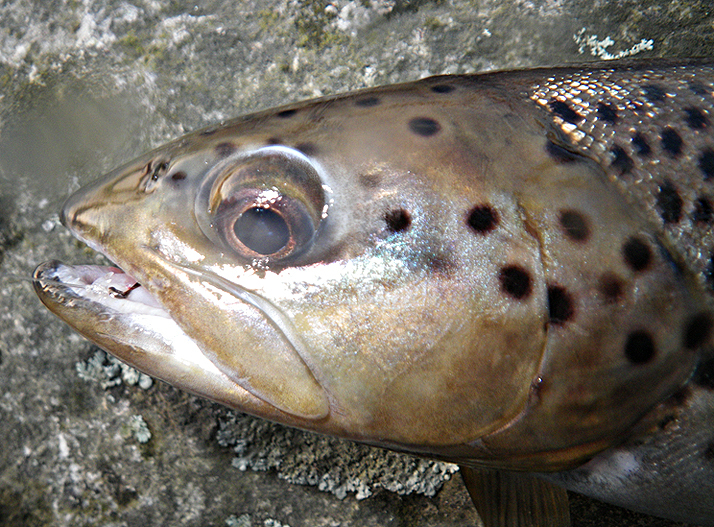 A beautiful spotted brown trout. I weighed her quickly to get a fresh weight on my digital scale and she went 4 lbs 4 ozs. His fish qualified as a trophy for a state bronze pin award but unfortunately by the time we got off the water all the local bait shops were all closed for a official weigh. Regardless still one hell of a brown. Oddly enough mid to late afternoon the bite got really good and we landed rainbow after rainbow loosing count of how many we landed total. Ray also had a monster on that he originally thought was his lure stuck on the bottom until the fish made such a powerful and fast run. His drag was screaming and then just like that snap, his line broke when the fish made another powerful run. We checked the end of his line, which was pretty frayed up. We debated on what it could have been but whatever it was it was huge and Ray said the feel of the fish dwarfed the big brown he took earlier. Those are the breaks sometimes (no pun intended). In the mix were also a couple of (emerald green looking) tigers that I landed at the end of the trip, which capped off the day. Another enjoyable trip on the water. Tight Lines All! Decided to go back to the same spot as last time, in hopes of more tigers and larger fish. Just as I was ready to leave and head out my wife changed her mind and decided at the last minute to join me. After a short delay in getting her a fishing license and getting some gear rigged up for her we were off. She must have been the good luck charm I needed because we immediately got into fish and they were plentiful. 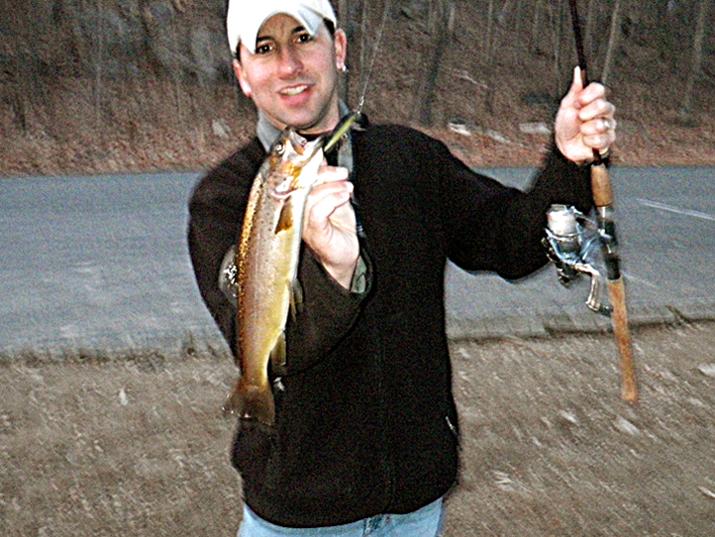 My 3rd or 4th fish in I hooked a big one on the fly rod and it took sometime to bring in but it ended up being a brown trout over 3 pounds. 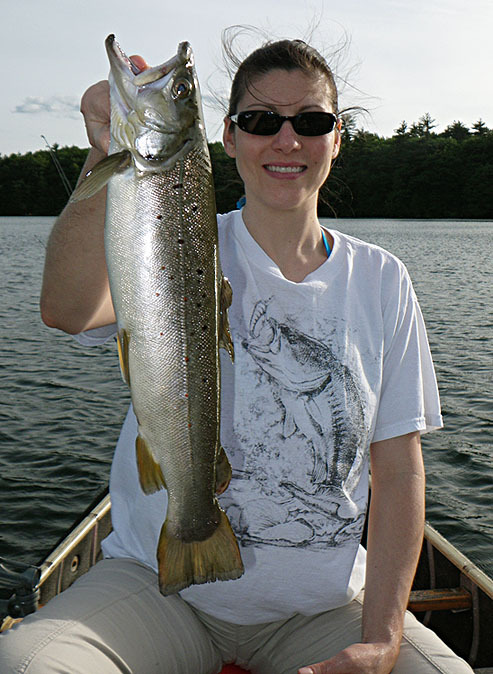 My wife was also getting into them pretty hard with a lead core line set up I gave her to use and not long after me she hooked into her own brown, one that went over 2 lbs. I also got into a couple more tigers and somewhere after number 15 we both lost count of how many rainbow trout we landed. 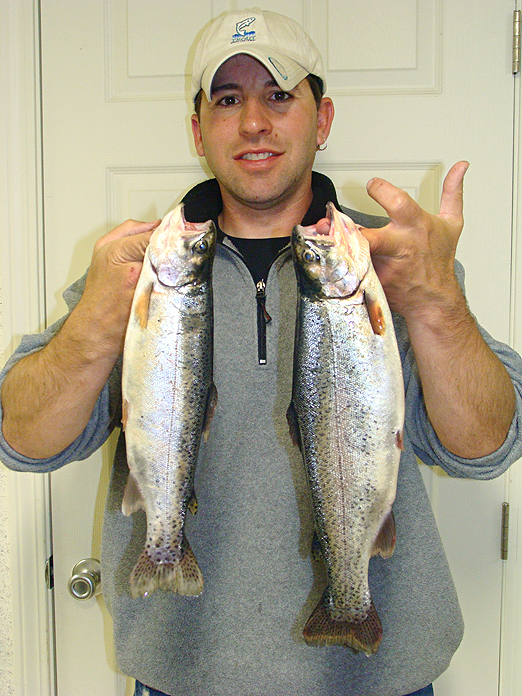 Some of the rainbows were pretty plump and sizeable too but most were the 12”-13” cookie cutter size. Some fun quality time with my wife on a beautiful sunny day, cant ask for more. It was a good day. Tight Lines All! 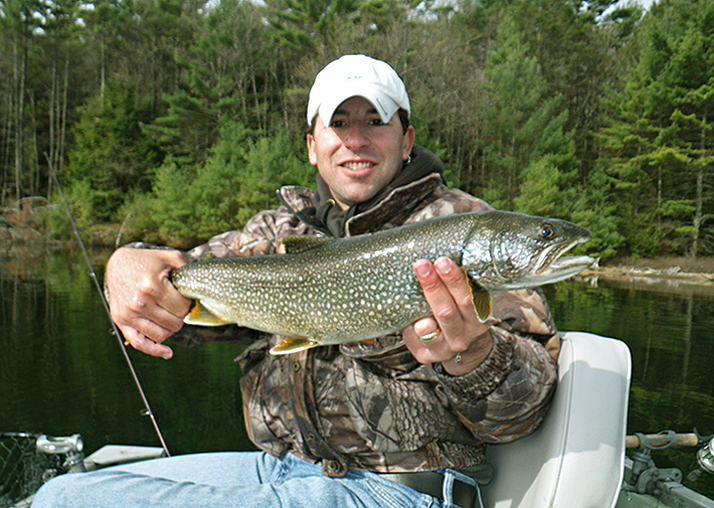 Here's a report from Mike: I wanted to troll Echo lake in NH, every year a monster brook trout is caught on this body of water. I got up nice and early with everything packed the night before. We drove over an hour from my camp to get there. We started to unload all my gear!!!! I noticed I never packed the trolling motor for my canoe???? I was out of my mind. I thought to my self, do I drive back to camp grab the motor and lose 2 hours or stay and paddle into the wind and troll with it using bait!!! I stayed and did a wind troll!!!! It actually worked pretty well... We hooked up and landed 5 brookies between 9-11" I was pretty happy with that but after 3 hours of fighting the wind..We were ready to get back to camp. 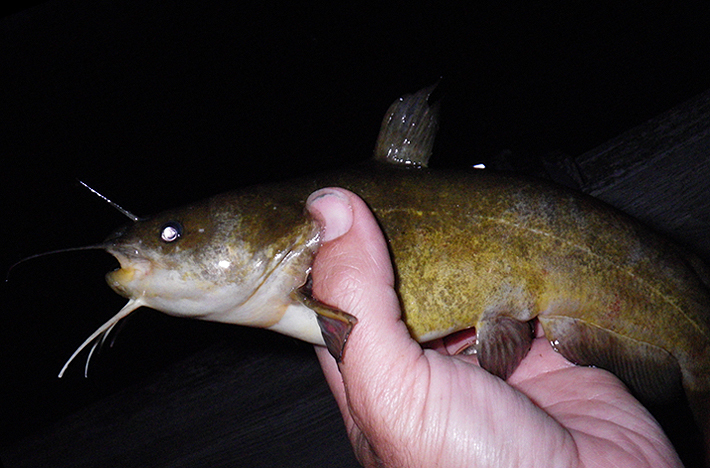 We tried again that night this time with a trolling motor. We landed 3 more. And 5 more at a hike in pond so a grand total of 13 brookies!!! No trophys but real nice trout. 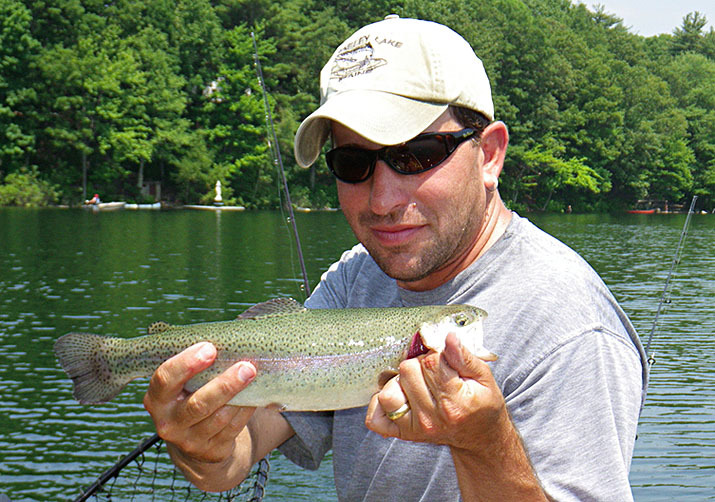 We did land a couple nice rainbows on our lake at camp. One was 16" just under 2lbs. 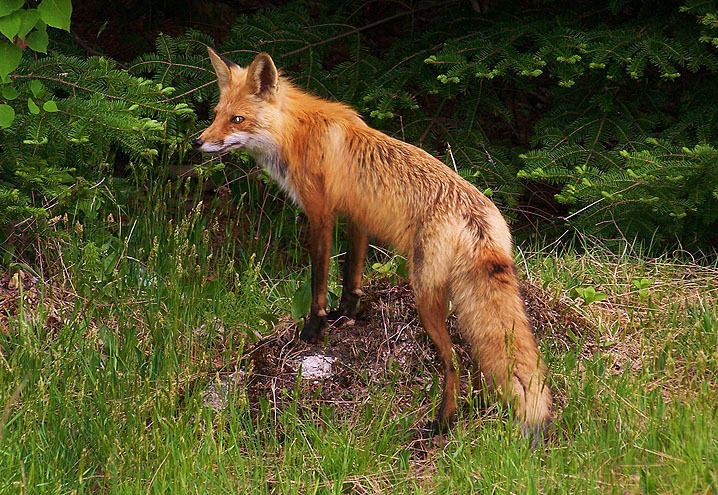 We also got a great photo of a Fox on the way to the lake. Headed out for a few hours in the evening. I was on the hunt for Tiger Trout. 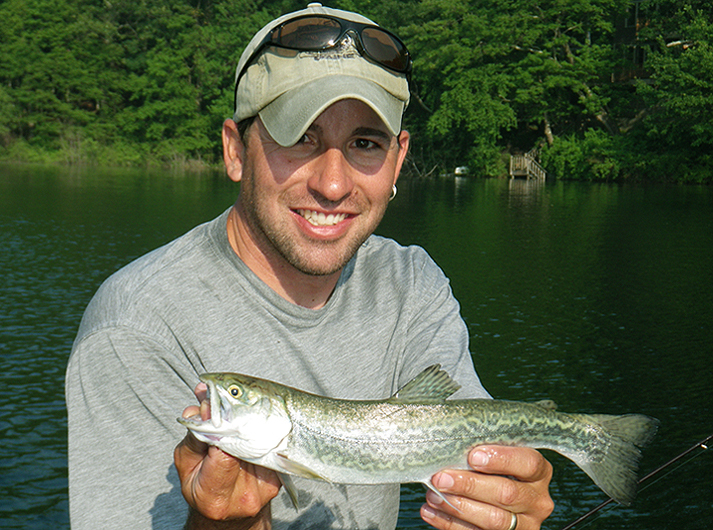 I had heard about a spot that got stocked with them and also got a mix of other trout, with a small number of them going 18” or over thrown in. 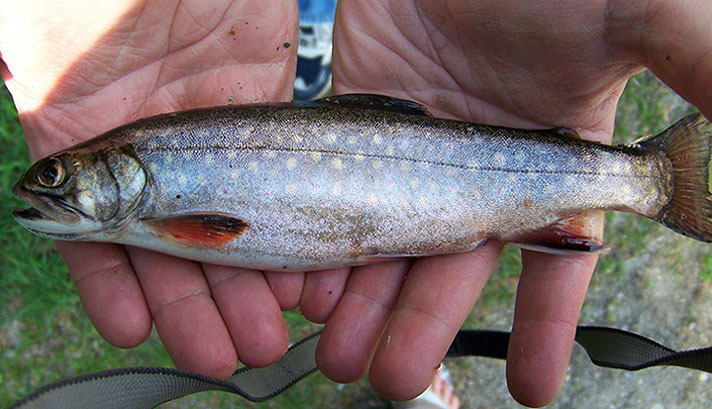 Also while I was launching my canoe I spoke to one gentlemen who was shore fishing and happen to show me a photo of a brookie he had caught a week prior that went over 3 lbs. So while launching I was feeling very optimistic. But what I really hoped for were tigers, I had tried for them one other time this year at comet pond but came away with a bunch of browns under my belt instead. 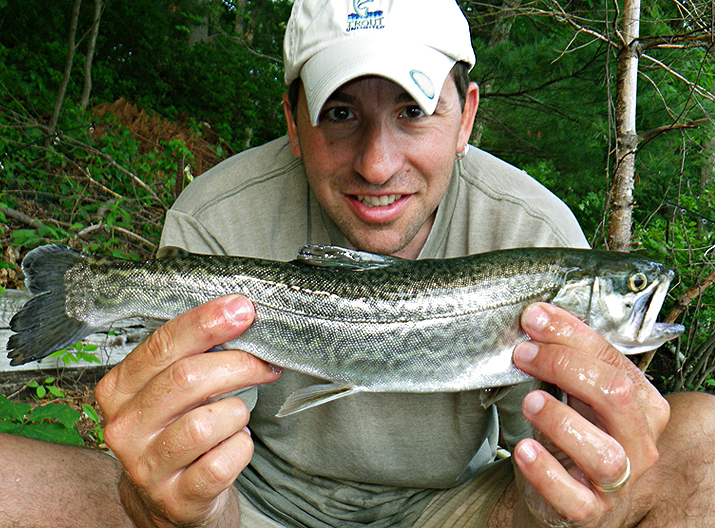 Out of all the stocked varieties of trout (rainbow, brown, brook & tiger) the tiger in my opinion is the hardest fighting. 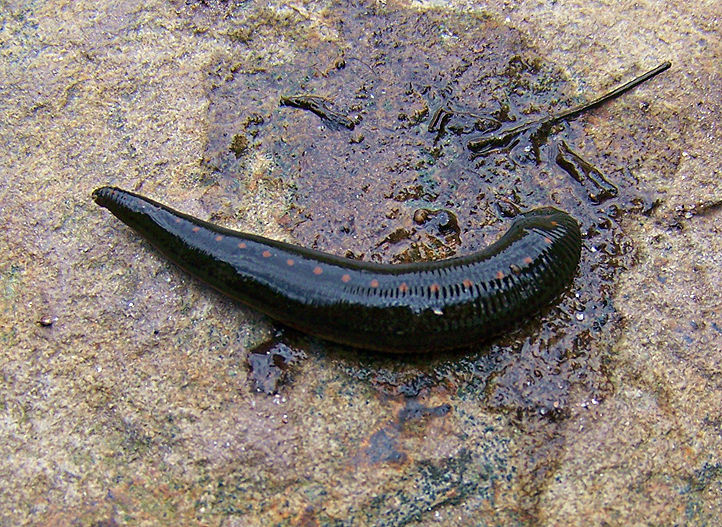 Biologists attribute their vigor and fighting ability due to being sterile and therefore all their energy goes toward feeding and not breeding. 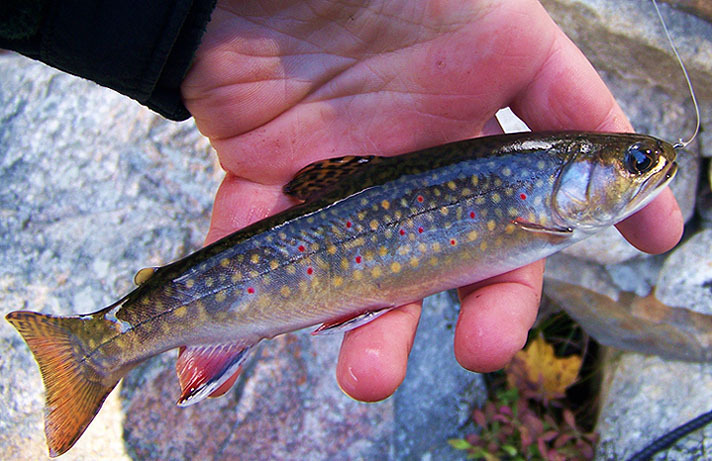 Tiger’s in Massachusetts are the result of the Sandwich hatchery, where browns are crossed with brook trout, creating these beautiful hybrids. 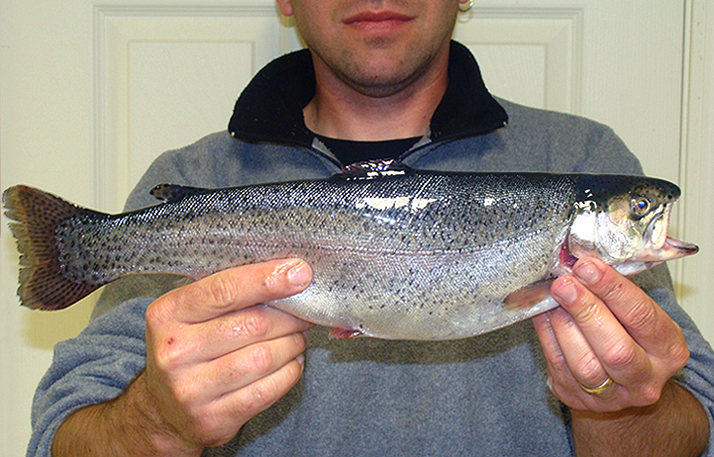 Though hatchery reared they are not necessarily Franken fish either, as some trout purists call them. 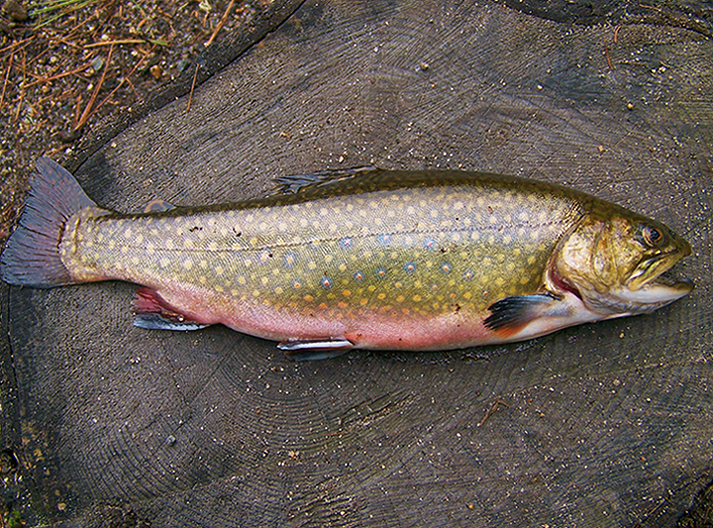 This hybrid cross does occasionally happen in the wild were both brown and brook trout co-exist and successfully spawn. It’s extremely rare but it does happen. 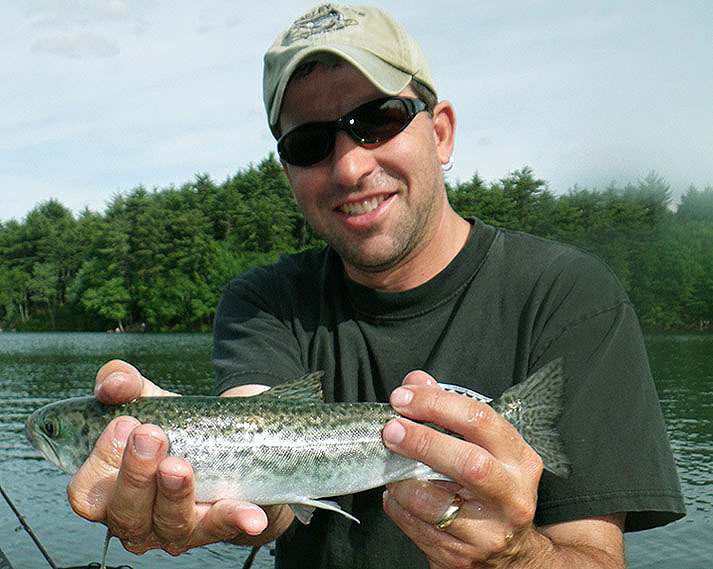 Out of the 4 varieties of trout stocked in MA the tiger is the least stocked in numbers, making them the most difficult of the 4 to catch. So I finally get out on the water and begin my search. I locate one area were the fish are down about 20 feet or so using sinking line on my 5 wt fly rod I get into a few pretty quickly. However they were all rainbows, I like them too but not what I was after. I ended up breaking a cardinal rule and left fish to find fish. But it paid off I found a pod of tigers in another spot about 10-15 feet of water and bagged 3 of them before calling it a day. I lost a few in the process including one fish that came un-buttoned that felt like a real large one. 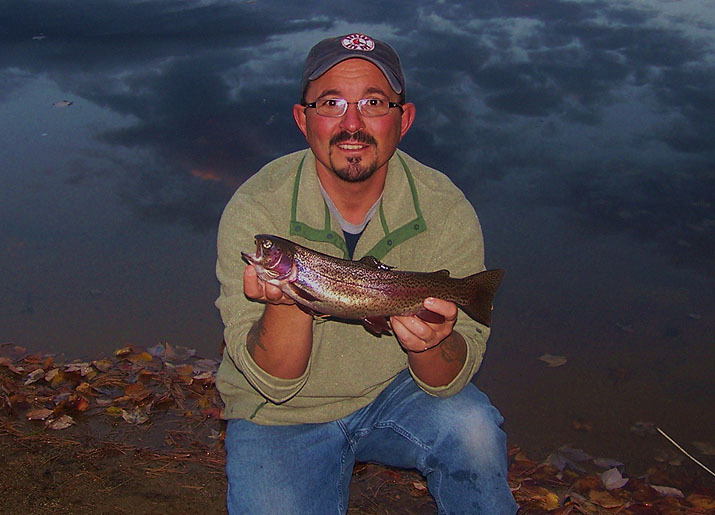 All fish were caught on the fly rod. I also had a dozen or so follows on my spinning rod casting out rapala’s but no matter what I did they just wouldn't commit. All and all a short and fun evening and I finally got my tigers this season. Tight Lines All! Did not have much time this past weekend to wet a line. Most of my time was allocated to yard work but I did slip away Sunday afternoon. 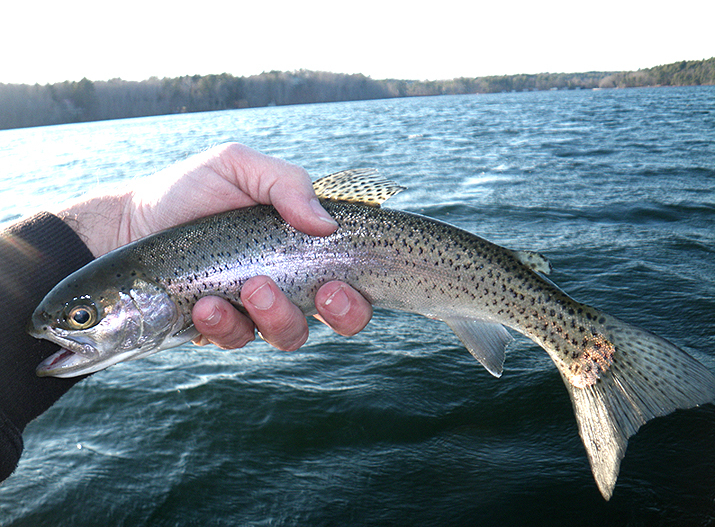 I hit comet pond for a quick trip and hoped I'd get into some Tiger Trout the state stocked about 2 weeks ago or so. While launching my canoe one guy I talked to ending his day landed a tiger and two rainbows. Which made me feel a bit optimistic but things were really slow. I covered a bunch of water and not even a hit. 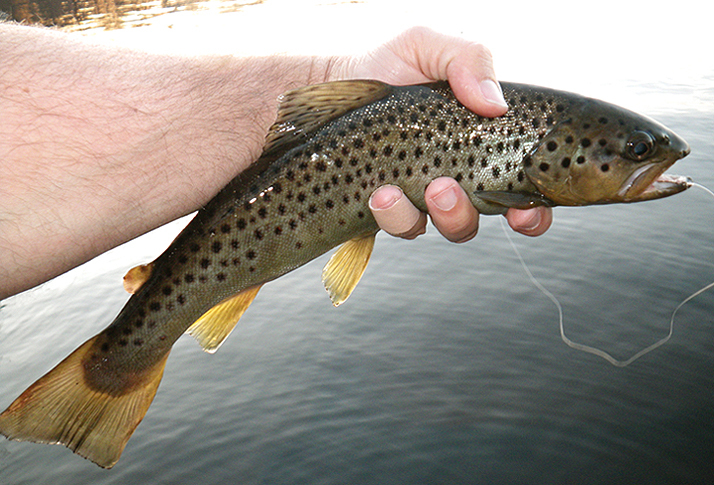 I finally landed a trout trolling with my fly rod but it wasn't a tiger it was a brown. 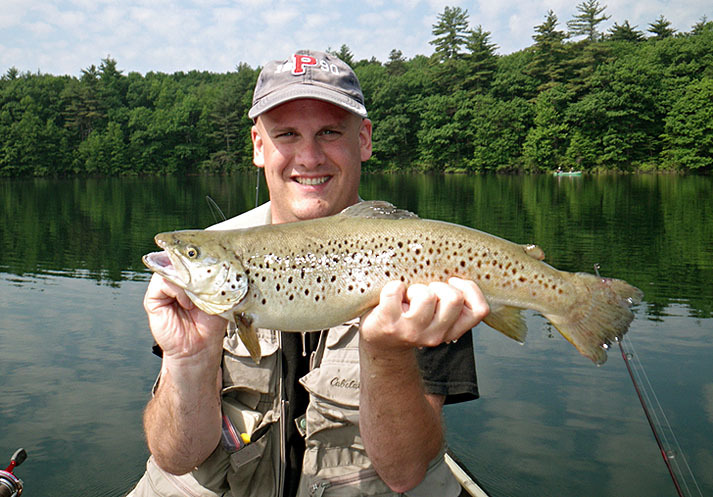 After going so long without a hit I no longer cared about what kind of trout it was. 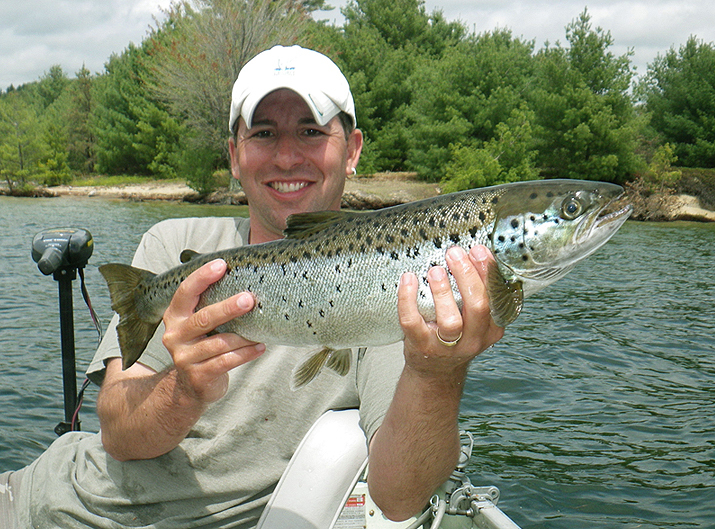 I then anchored down and stationed myself and started casting a rappala rainbow trout pattern countdown and had another brown trout follow the bait all the way to the canoe. 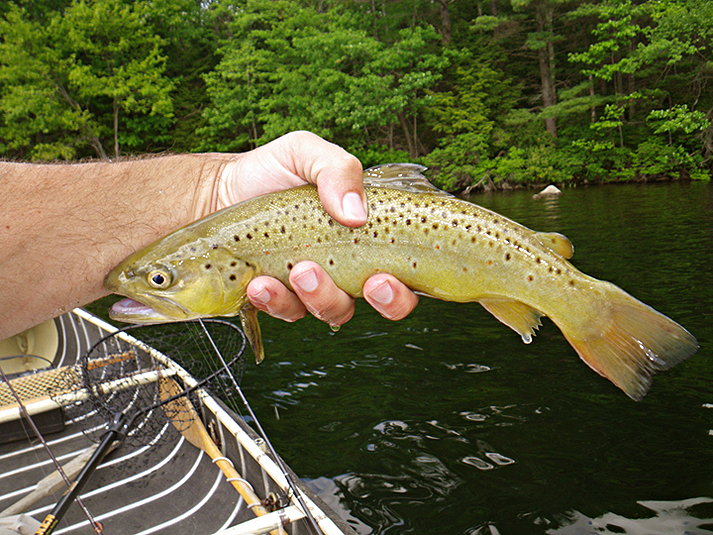 To make a long story short I landed 5 brown trout all in one small little area but had at least 15 follow the bait to the canoe and not commit, I would have killed for some fish sent to rub on the lure. Not what I was after but a fun little trip. Tight Lines All! 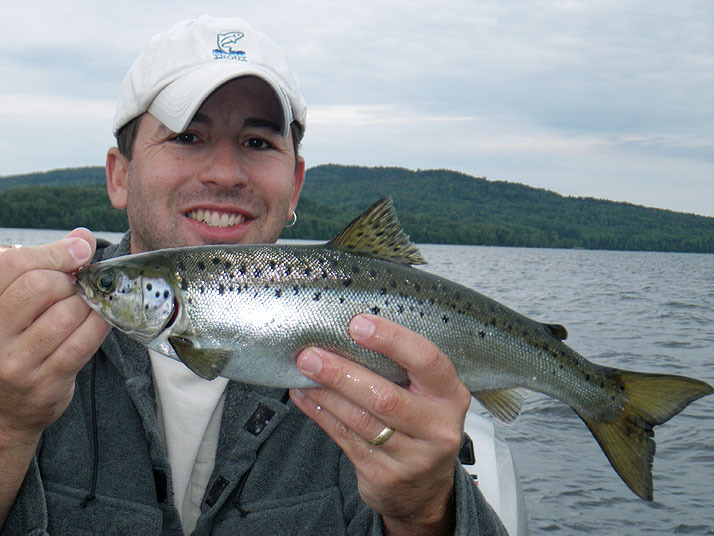 Here's a report from Mike: I have been fishing the remote hike in ponds and lakes in NH for 6 years now. I always seem to have pretty good sucess. 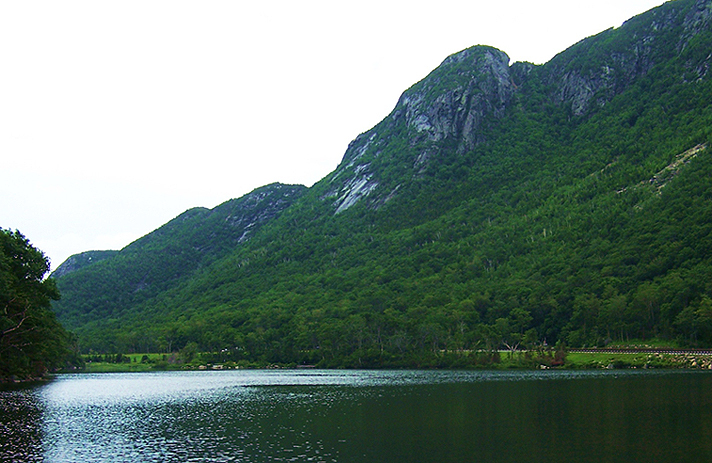 My 3 boys and I have caught hundreds of Brook trout from these Glacier lakes and ponds. 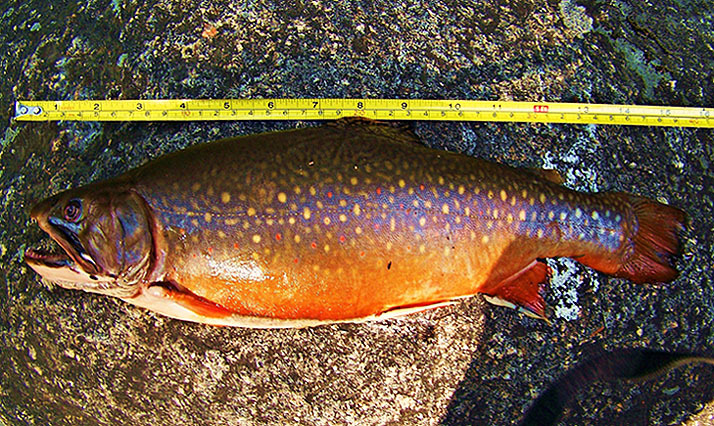 I know some very large Brookies roam these waters. I have seen photos and heard stories. We have caught some nice size ones over the years. Just not a true trophy, this has eluded us. I had planned on taking My son Skylar trout fishing and hiking just as a fun day, the fishing was going to be practice and a couple for lunch. We got on the water early and hiked to the back end of the pond. Its only 12 acres and 40 ft deep, it has some nice hold over trout. 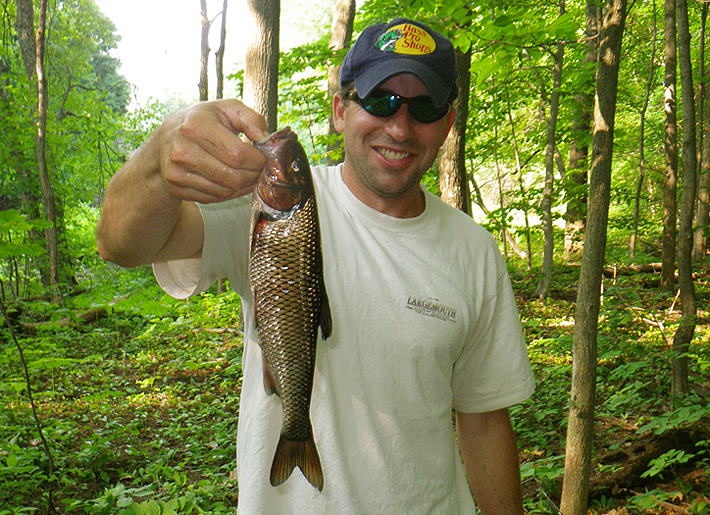 Skylar landed a nice 12 inch Brookie to start with, on my first cast I felt a good tug on my hand tied fly. 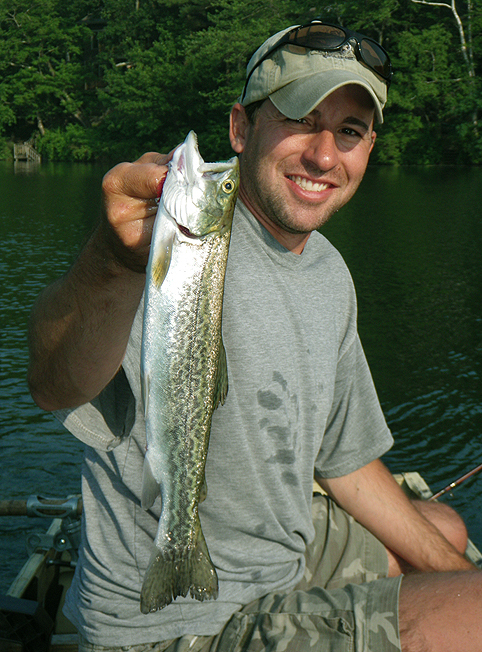 I knew it was a good sized trout but when it peeled line off my reel I knew it was a trophy. It surfaced just in front of us. I saw the huge mouth!!! I thought it was even larger than it was....we landed it with the net. The line broke just as it made a surge, lucky it was in the net. The measuring tape read 16.5 inches and the scale read 2lbs 4 ozs!!!! 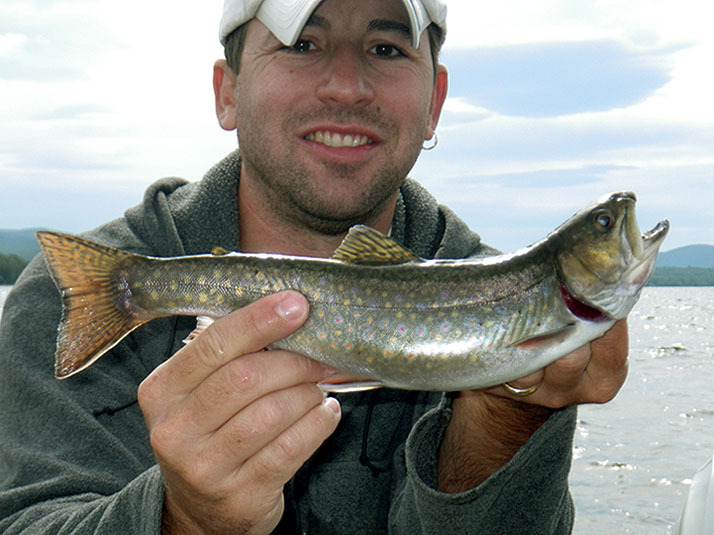 This was a true trophy a "Glacier Lake Monster" Brook trout. 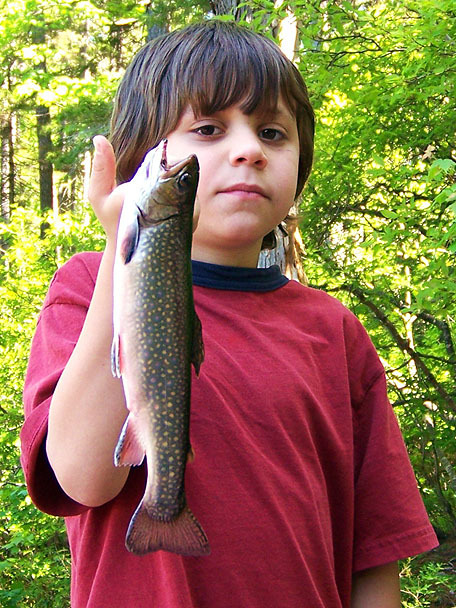 Up until this Brook trout the largest remote pond one we caught was Skylars, it was 14 inches 1 lb 8 ozs. 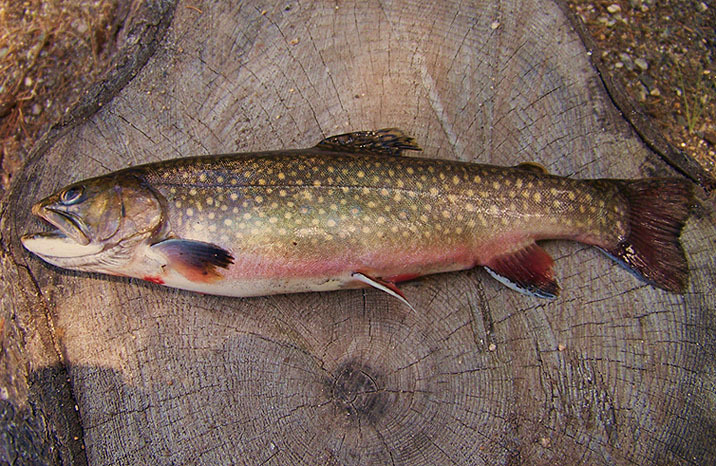 We ended up catching a total of 8 brook trout, from 9-12 inches. Along with this colorful trophy. This one will hang on the wall at Camp Deloia...Finally!!!!!! 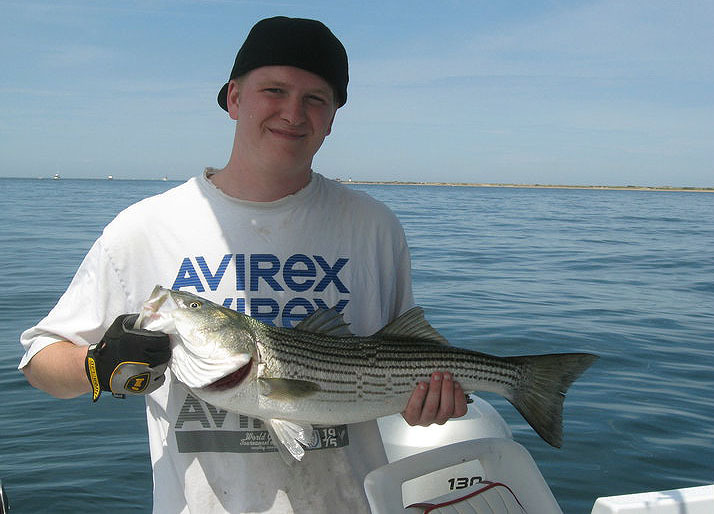 We also had a game warden check us out, he was very nice because I was with my son. 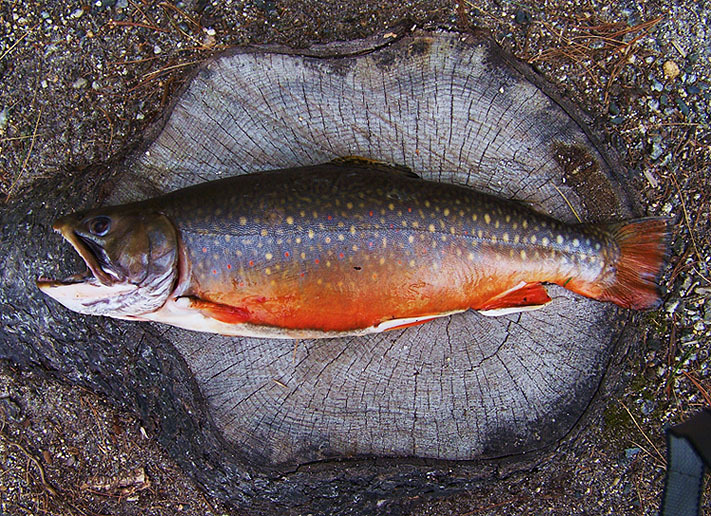 We always use the same stump to photograph our brook trout so its funny to see the size comparison. Its great to know you may have landed the largest fish on a certain body of water...This Brookie was the Alpha Male of this water!!! 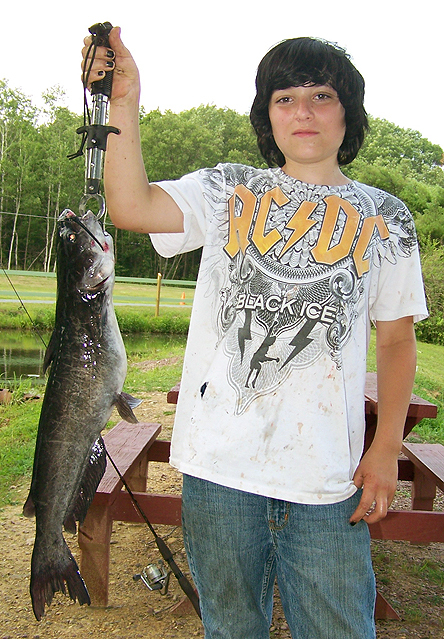 Take a kid fishing- Mike Deloia! 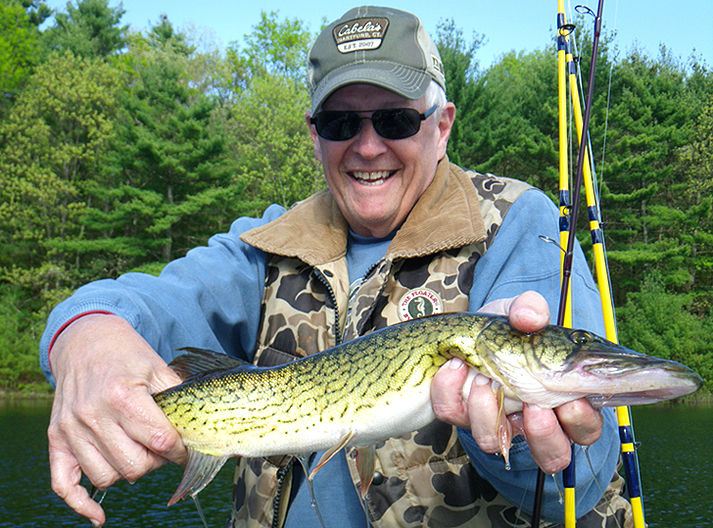 Another trip to the Quabbin, this time I took my friend Dale out again. I had hoped the salmon were still in the general area that they were in yesterday but that was not the case. 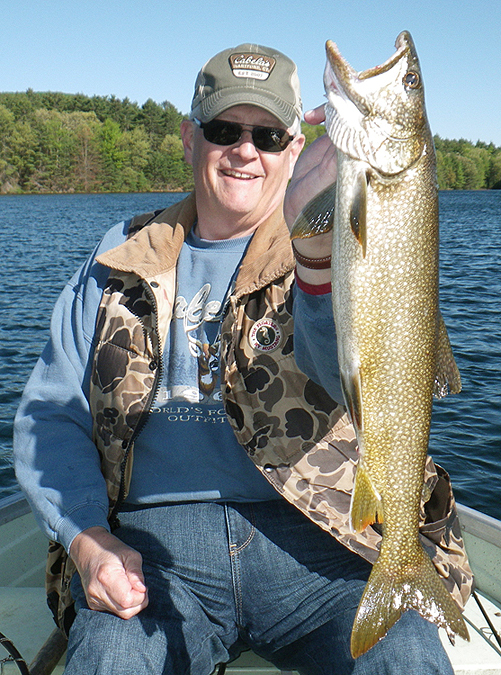 Though we did not get into the numbers I got the previous day, I did help put Dale on his biggest and first ever MA lake trout. I knew Dale wanted one and he got it. After it's capture the laker still remained strong and healthy and after some minor convincing Dale released the laker to fight another day. The wind picked up pretty bad and to escape it we tucked into a shallow cove that had very little wind and played around with the warm water fish. 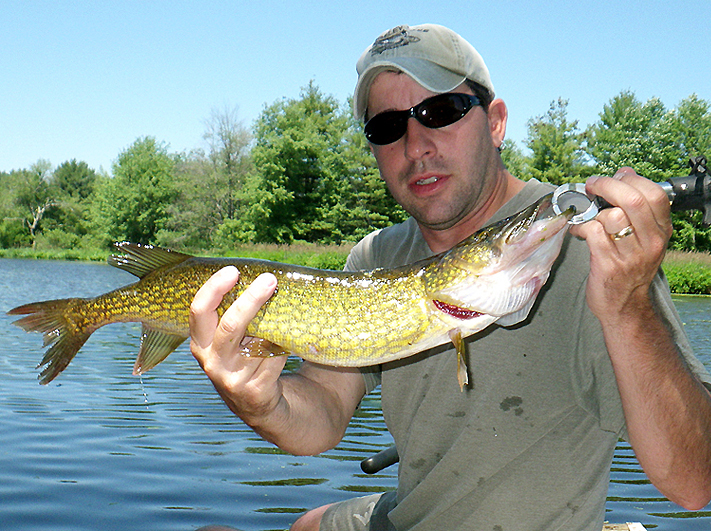 Other fish caught that day included: yellow perch, largemouth, smallmouth and pickerel. TIGHT LINES! After taking out some of my friend’s back to back and playing guide, I needed a break. 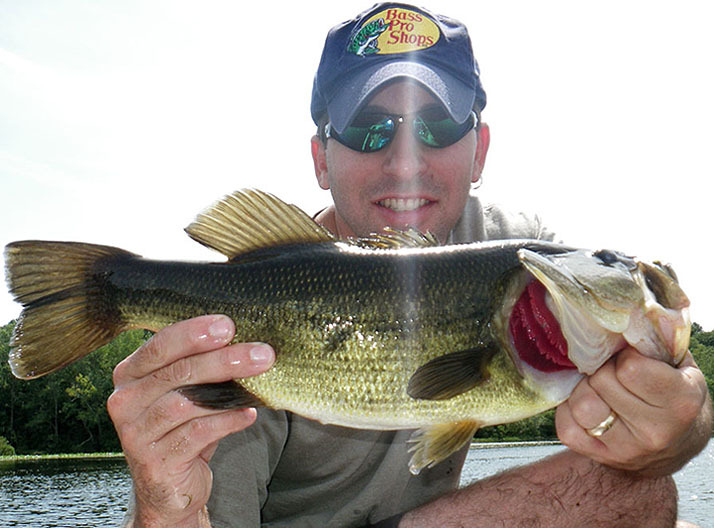 Though most of the time I like fishing with friends I wanted a day with no pressure of trying to put anyone on fish. 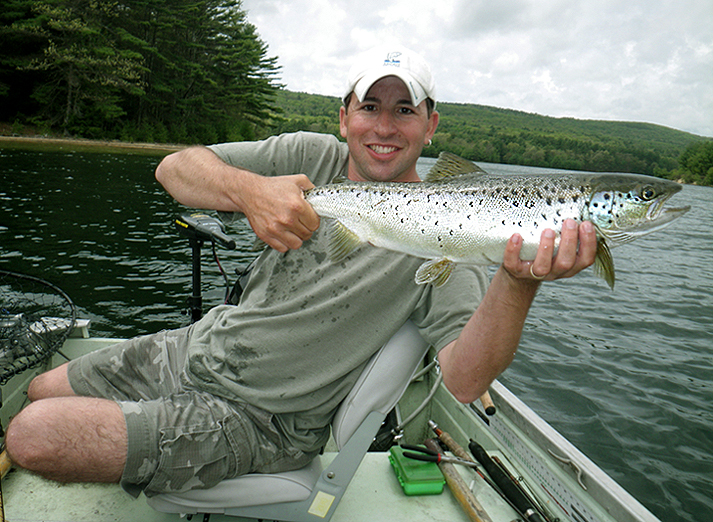 So I headed out on a solo mission and ended up having so far my best day at the Quabbin. Early morning I got into a couple of beautiful lakers, bottom bouncing live bait. The first one was released unharmed, the other the hook had popped a gill and was a bleeder, and so he was kept for table fair. 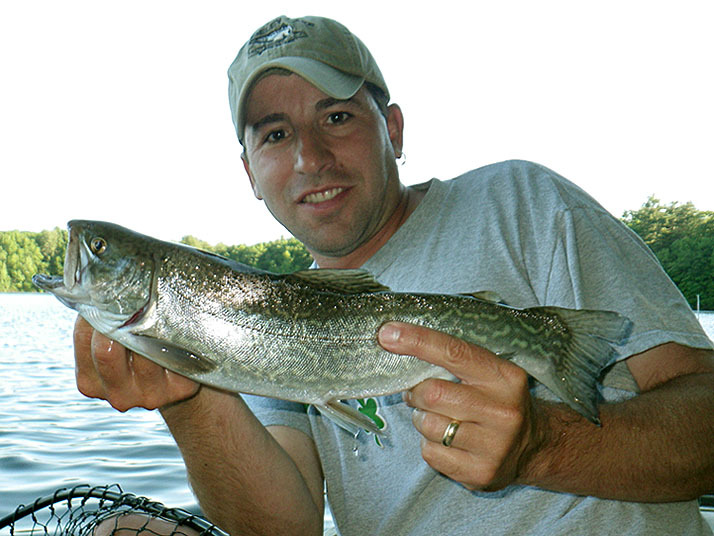 These lake trout are a blast, they’re also wild and allot larger than your typical 1 lb hatchery planted trout. 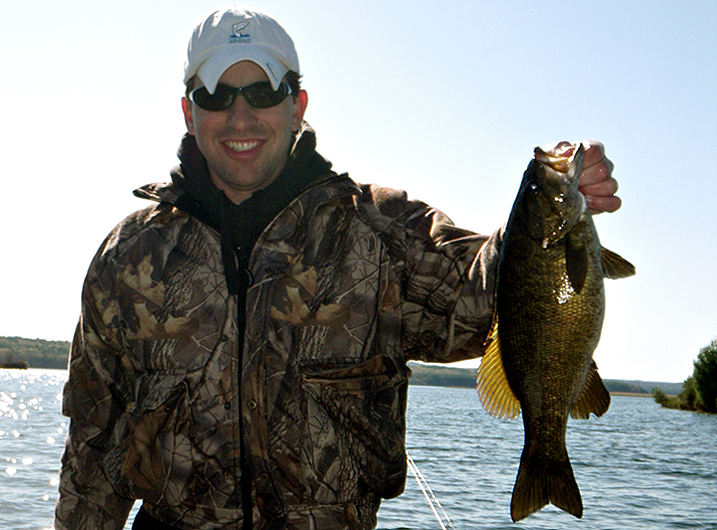 I also fooled around briefly with the smallmouth and caught a couple of hefty fish with a jig. 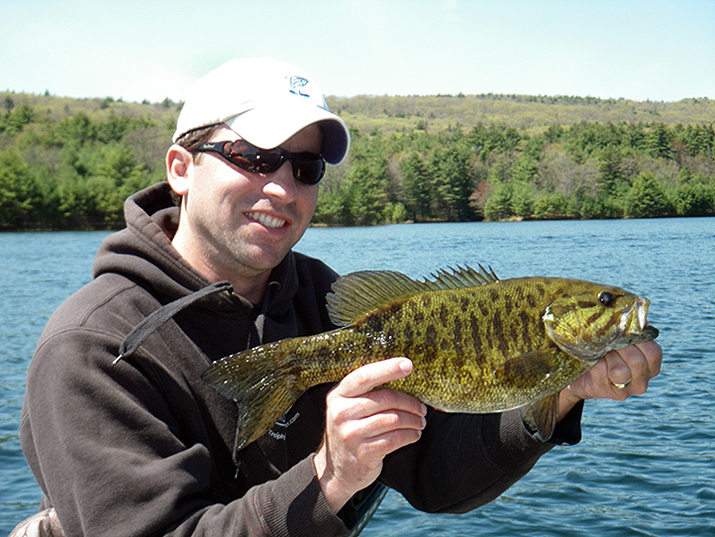 With the smallies and lakers under my belt I only had one species left for the day to complete the Quabbin big three. Something I had not done yet. 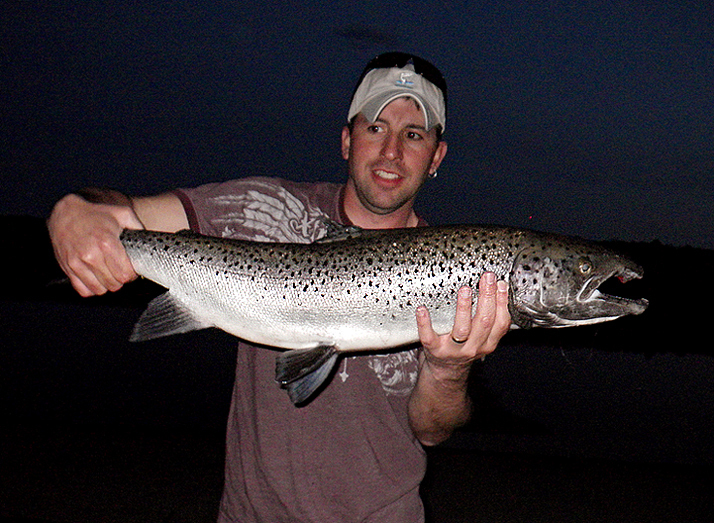 So I switched gears and targeted landlocked salmon, which paid off. 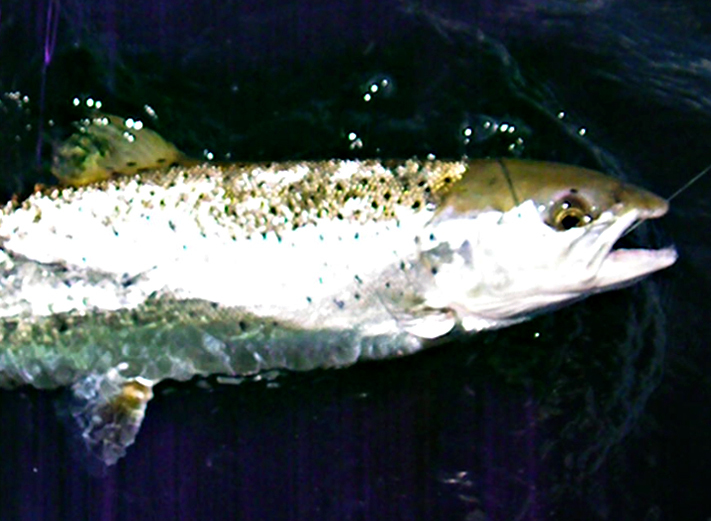 While trolling with my baits just under the surface I found some salmon and then continuously worked the school. When the bite stopped I would troll in the general area, find them again and work them again. 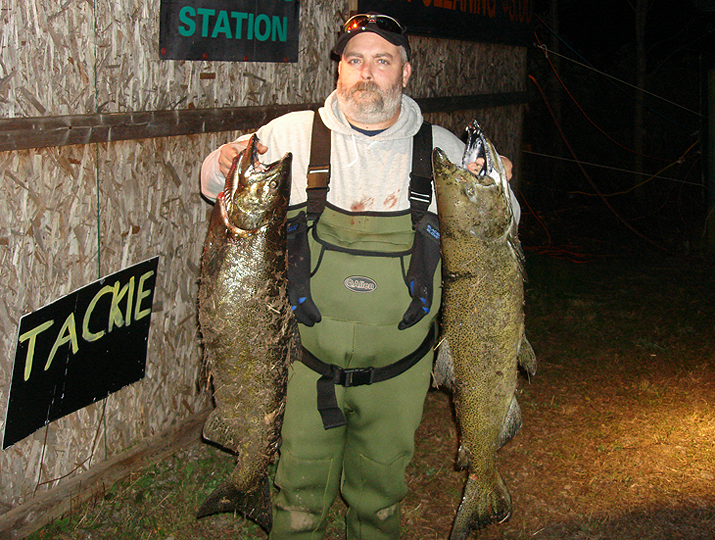 I landed 6-7 salmon and also had a few come unbuttoned. Some were caught trolling and a few caught casting rappalas into the active school. They seemed to hit anything that resembled smelt (their primary forage). 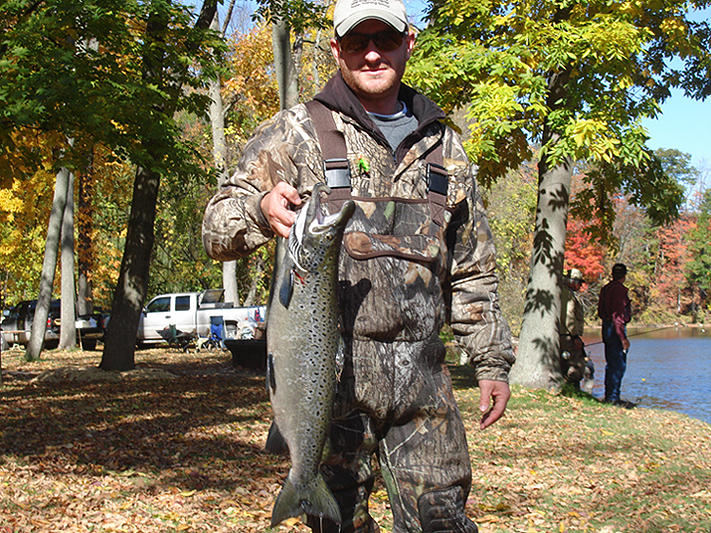 The first salmon landed was the best fish of the day, 6 lbs on the button (fresh weight). At the end of the day I brought it to a bait shop to qualify it for a state pin (MA awards program). After blood and slime loss and drying under the sun for a bit in the boat it lost a couple of ounces and was certified at 5 lbs 14 ozs. This big land-lock had a crooked kype. I also kept a hen that I dropped on it’s head by accident and decided since I was already bringing a couple home, I mine as well go ahead and keep this one as well, versus releasing a half dead fish. All other fish caught were returned alive and well and ready to fight another day. The hen also qualified for a state pin, it had a deformed head, which was a bit too rounded. 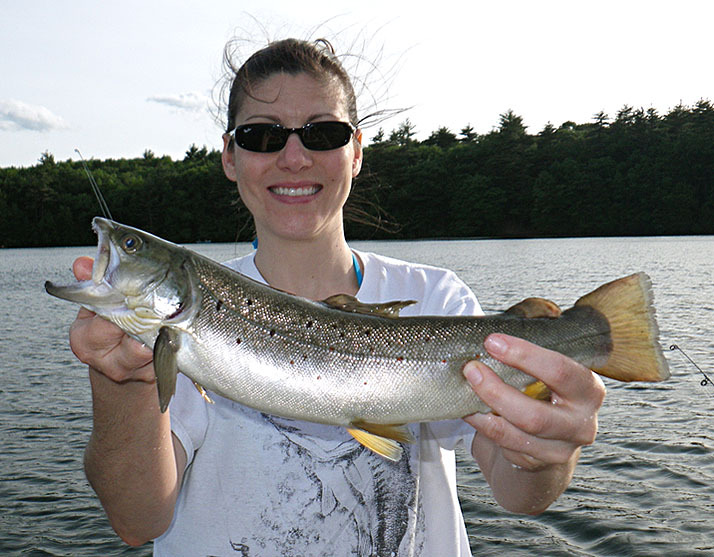 Though the Quabbin does have wild salmon that are born and bred in the lake and it’s tribs., the state also does do some supplemental stocking of smolts. Judging by deformities of the 2 kept fish I believe that the school I found today are products of a past hatchery smolt stocking. Regardless of whether they’re smolt stocked or fully wild I can never get over how incredible they fight and in my opinion the hardest fighting of the big three with smallmouth a close second. 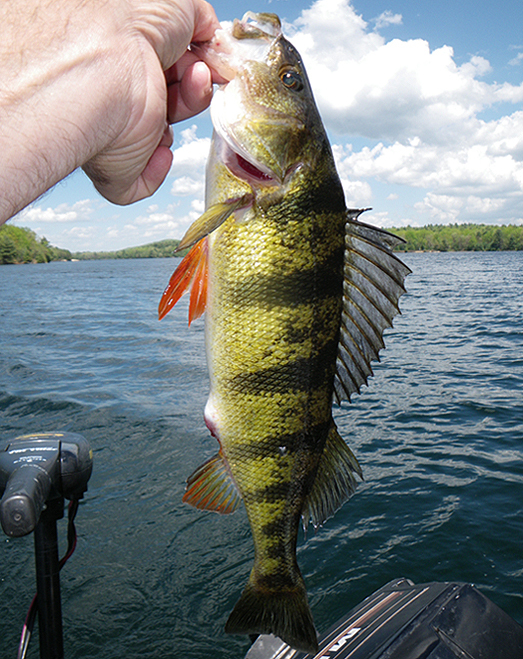 Also while searching for the salmon some incidental yellow perch were caught, further adding to the multi-species day. What a blast on the water today. Now get out and go have your own fun and report back. Tight Lines! P.S. 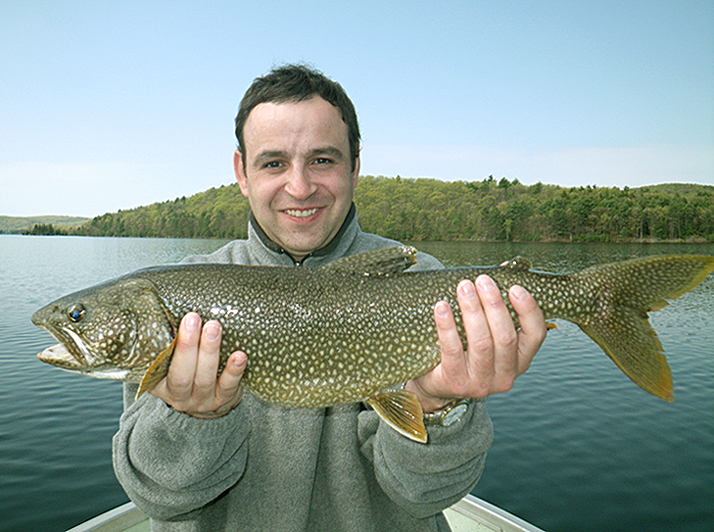 currently in production are 3 new separate Quabbin video's (lake trout, landlocked salmon and smallmouth bass). Look for those soon to come, so check back often. Also if anyone wants to send a video link and or pictures/report, feel free to email me them and I will include you in the next round of updates. 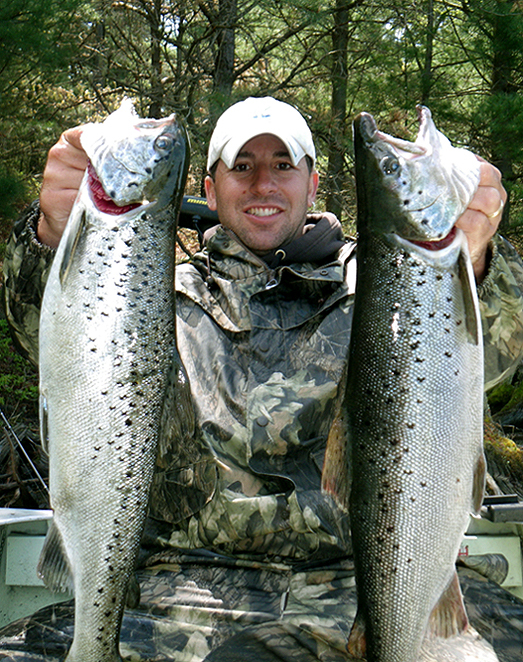 Below a new video I put together of some of the landlocked salmon that friends and me caught over the spring. Some good fish again this year. Also look for more video's to come, that will correspond to my journal entries below. Back to the Quabbin and this time I took my friend Dave with me. 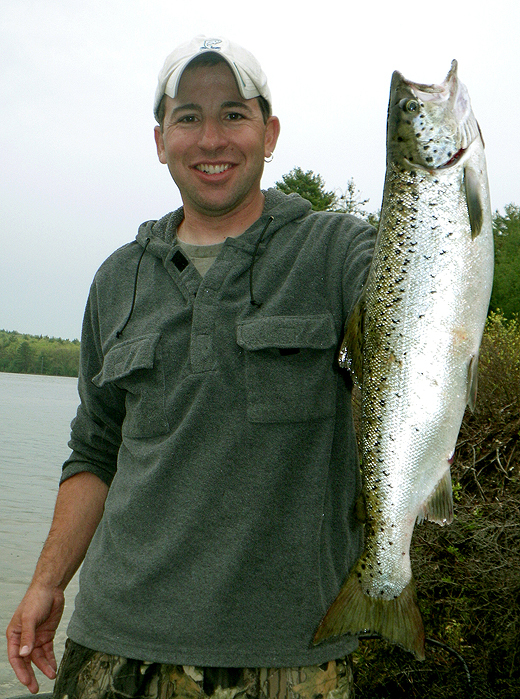 Though we did not crush them today I was happy to help put Dave on his very first landlock salmon. 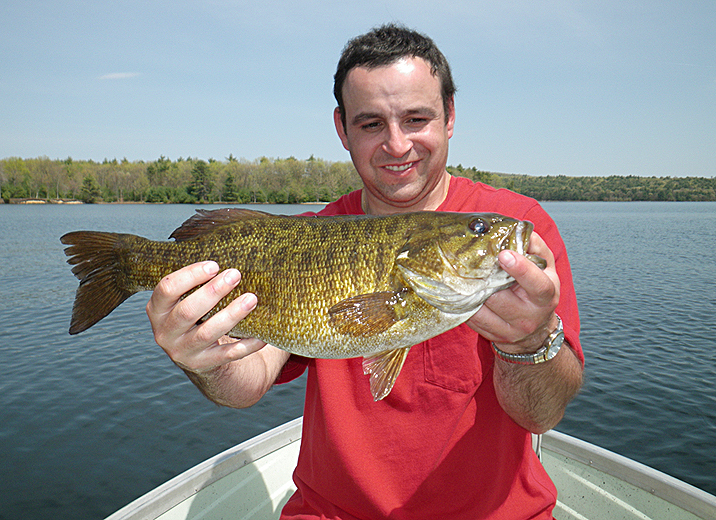 We both also got some quality sized smallmouth bass. 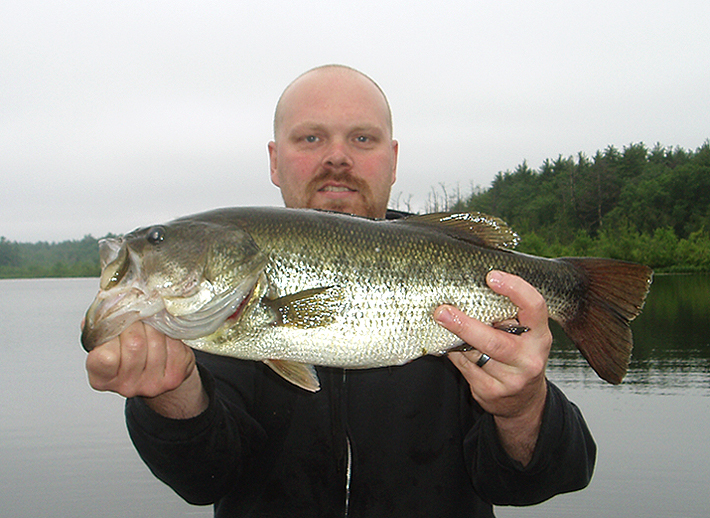 I also got my first Quabbin largemouth (I guess they do exist here), in the 2 lb range. It was fun hanging out with Dave and swapping stories. The day ended with a thunder storm that rolled in. The heavy rain and wind gusts were nothing I had seen before at the Q and made things plain miserable. There were Literally white caps in the marina. The wind was so bad it took both of us in the water to pull and guide the boat onto the trailer. Dave was a trooper and I'm glad he came otherwise loading and packing up in those conditions alone would have been a nightmare. We both got soaked to the bone. That's fishing sometimes. Tight Lines! I love vacation, back to the Quabbin again. This time I took my friend Dale with me. 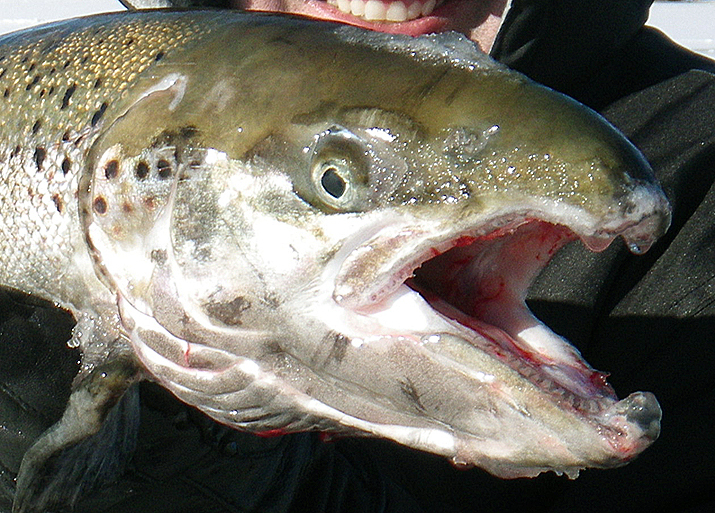 We finally found some salmon and both landed our first landlocks of this season. Dale got his first and not long after I got mine, a pin size fish of 4 lbs 5 ozs. We also had a few fish come unbuttoned. Then all of a sudden the salmon suddenly seemed to disappear but we kept searching. 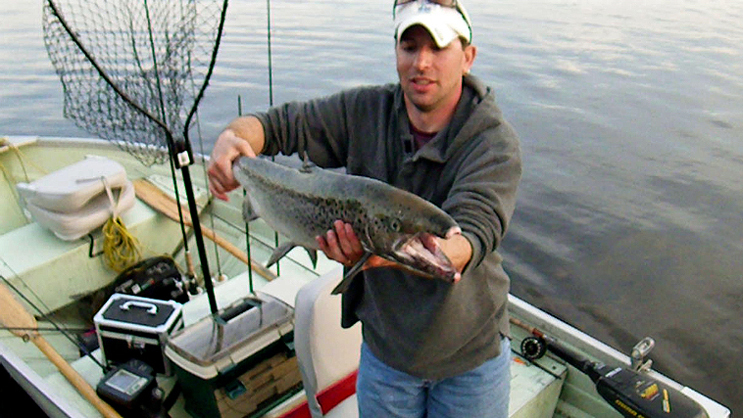 After a little time and not too far from were we had hooked our previous fish, I was on again and brought a 5 lb beauty of a salmon to the net (another pin size fish). Just as we found them again and were about to slay them. A boat disrupts us and pulls right up next to us and it's a game warden. Asking to see our licenses, my boat registration and life jackets in the boat. To make a long story short the only time so far this season I forgot my wallet and life jacket in the truck was of course today (Murphy's law right). I ended up back at the marina pulling those items out of the truck to show the warden. When it was all said and done. I had my Q trip cut short and got slapped with a fine. Not exactly how I wanted to end the day. Being forgetful can be expensive :-) TIGHT LINES ALL! 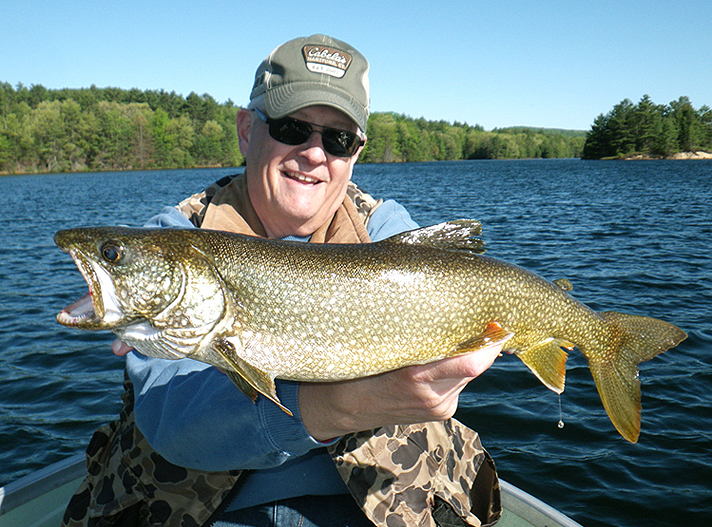 Headed to the Quabbin and was hoping to see a big fish taken today. 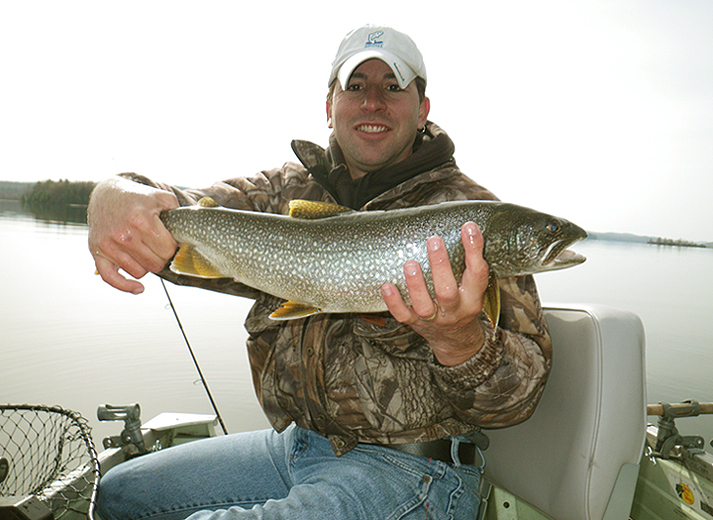 I took Bert out with me this time and got him into his first lake trout. So far this season it's the best laker caught out of my boat. 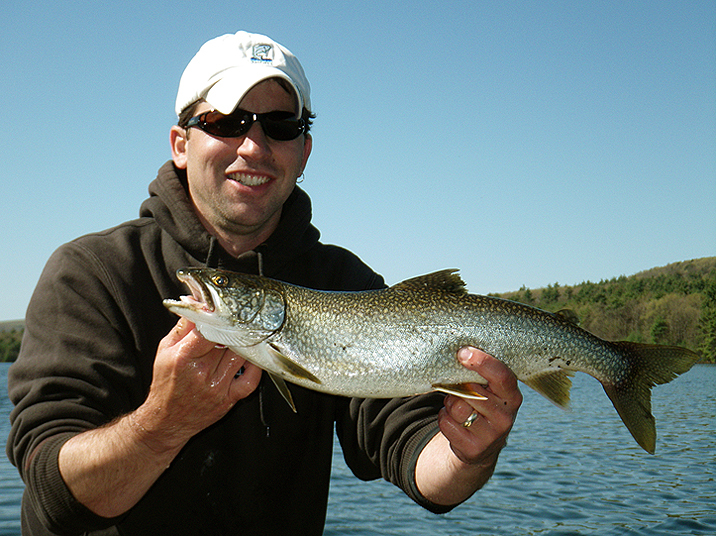 We had hoped we would get into a few more lake trout but though we didn't the monster smallmouth bass that we were catching more than made up for it. 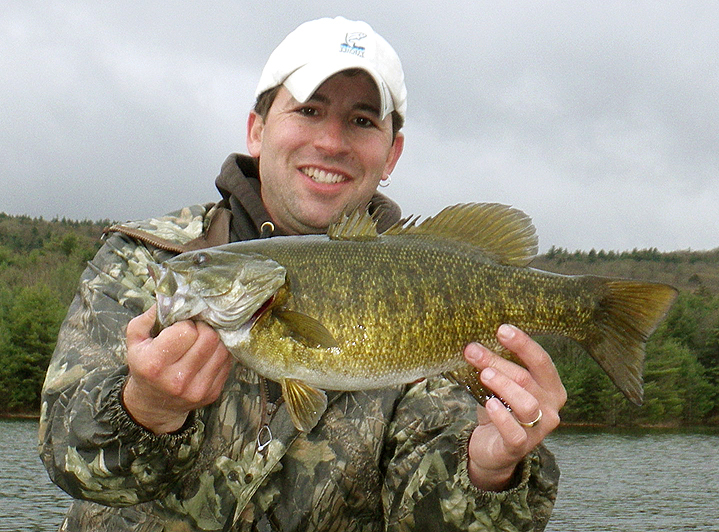 The best two smallies were 4 pounders. The highlight of the day was how excited Bert was over his fish. 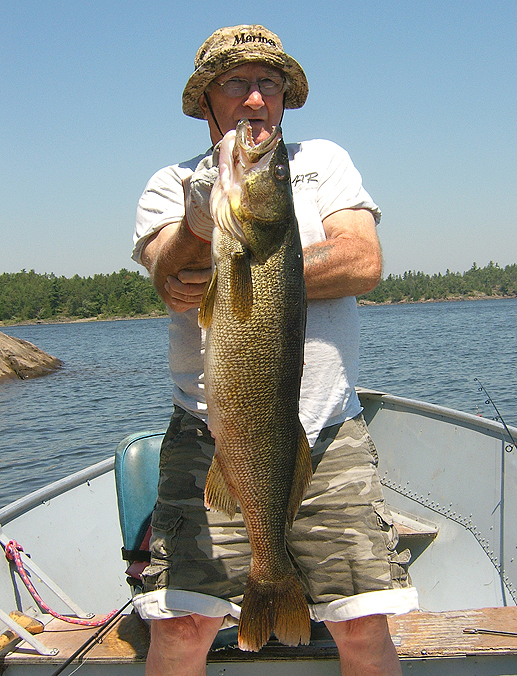 It's his largest freshwater fish ever. 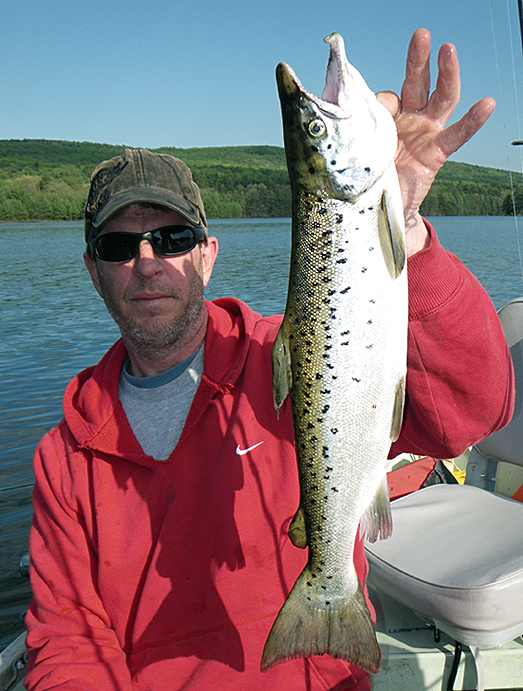 Bert's used to catching small hatchery trout, so to him this laker was a monster trout and something different to add to his fishing resume. TGHT LINES! Headed back to the Quabbin again but only for the afternoon and this time my friend Dave joined me. We were looking for salmon without venturing to far out from the gate and could not find them but we did find some smallmouth. 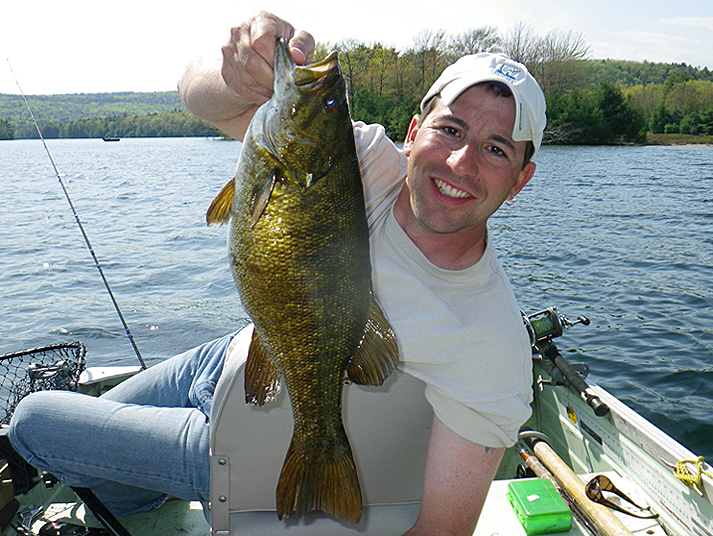 The biggest fish of the day ended up also being my personal best smallmouth, beating out a previous best caught not so long ago by one ounce. 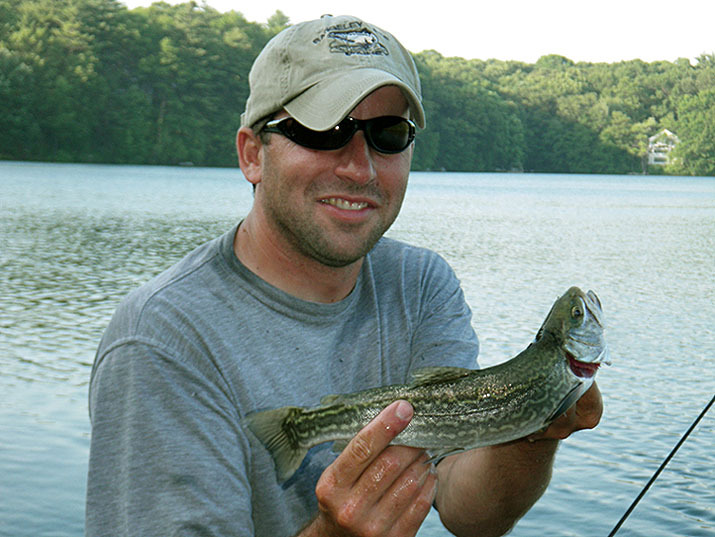 Off on vacation this week and look forward to putting some real time into the Quabbin and some fish in the boat. Tight Lines! Me and Bill returned back to the Quabbin. We concentrated in one core area. 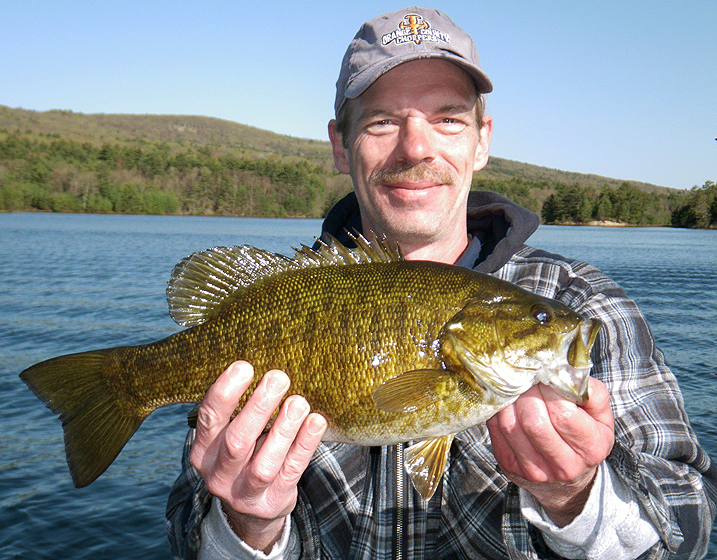 Bill did not have any luck the last time he was out with me but this time he landed 2-3 smallmouth, including his personal best smallmouth, a 3 lb 12 oz fish and the fattest football shaped smallie I've seen so far come out of the res. 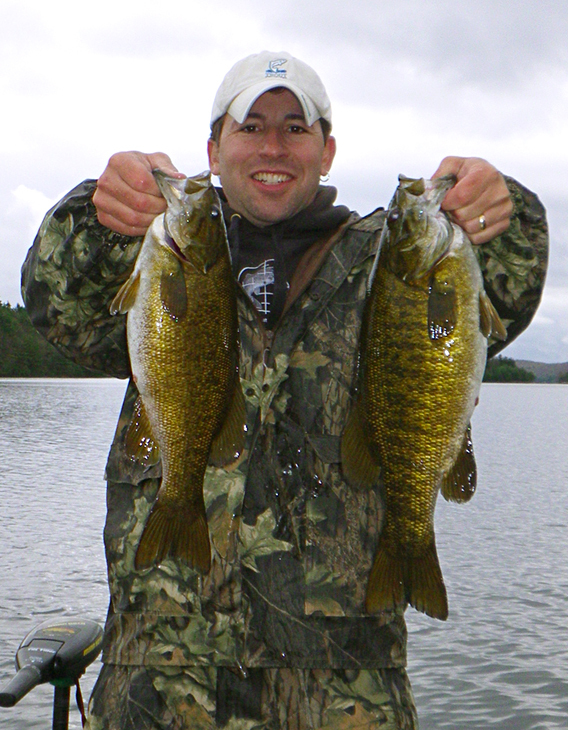 I got into a few smallmouth myself including one real pretty one with beautiful vertical bar markings on the sides, that went 4 lbs and I also got a couple of more lake trout. The lakers went 4-5 lbs and were also real pretty with their yellow vermiculation markings and spots covering their green bodies. Their forked tails and white edged fins certainly add to their beauty and character. 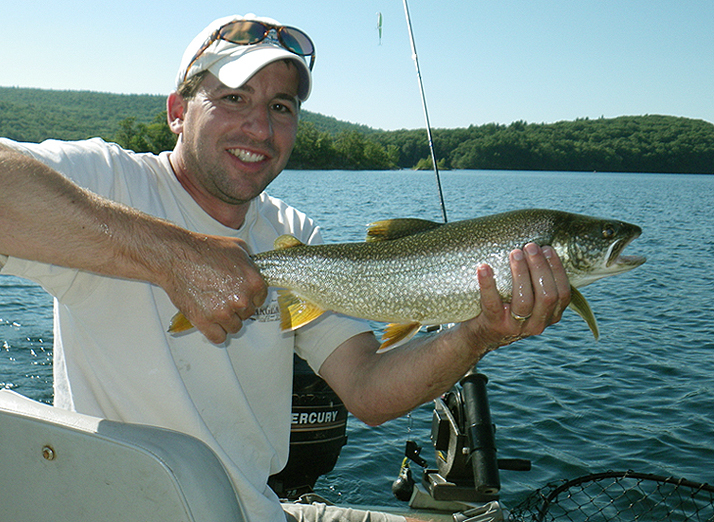 The lake trout I have been hooking up with seem to not live up to their reputation and actually fight well, minus the leaps. I was actually pleasantly surprised with their fighting ability and have been enjoying targeting and catching them. 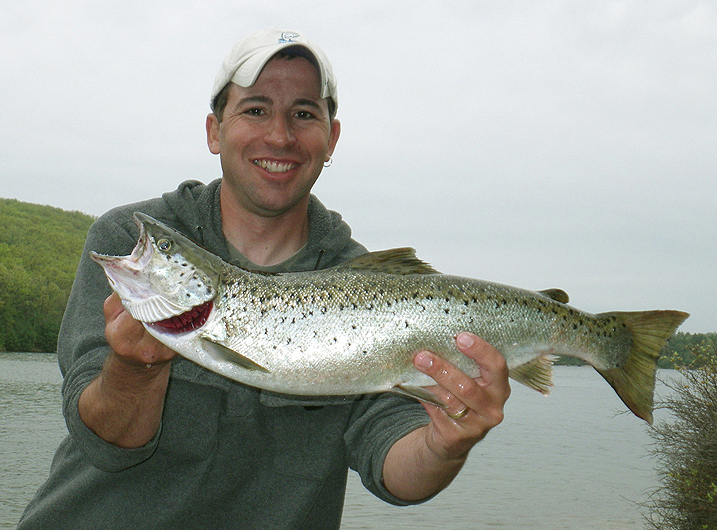 Next trip hoping to find some landlocked salmon to add to the mix. Tight Lines! 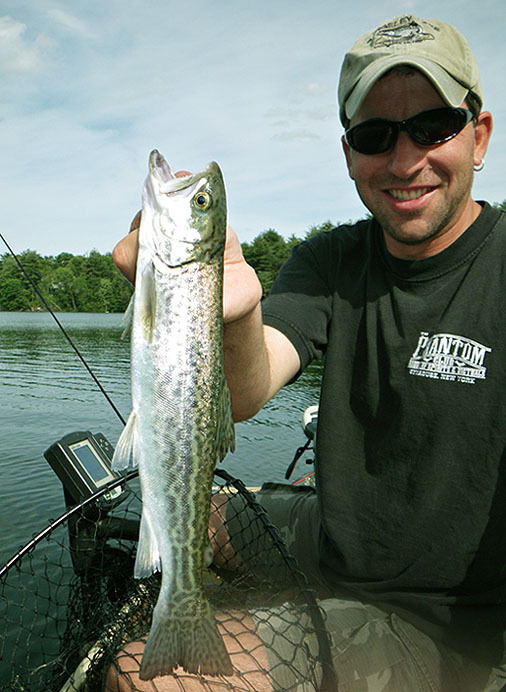 Last year during the spring at the Quabbin I was successful at targeting landlocked salmon and smallmouth bass and I planned on targeting the lake trout over the summer too but then the unexpected closure of the Quabbin happened, due to the zebra mussel scare and I never really got my chance at the laker's. Nor did I catch one incidentally last year. 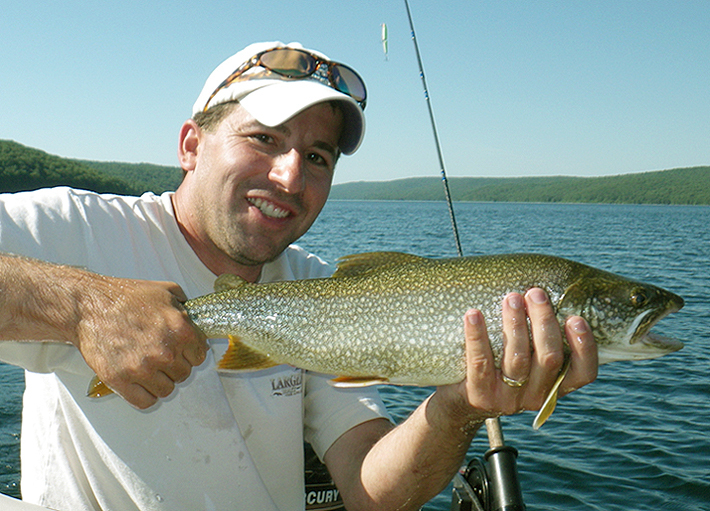 In fact though I have caught plenty of lake trout, including some monsters. I have never caught one out of my home state. So this year I wanted to target them early and focus on them by fishing a bit deeper. That was one of my fishing goals for the season and I was happy to achieved it today. 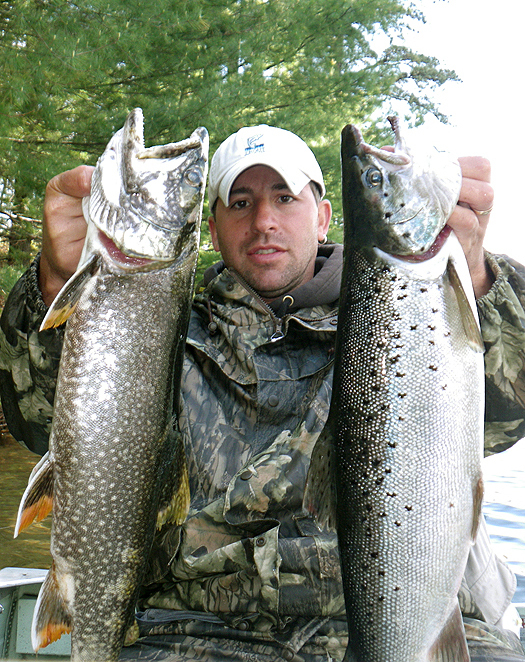 I got into two beautiful lake trout that were caught over 13 feet of water adjacent to a 40 foot drop and bottom bouncing the baits. 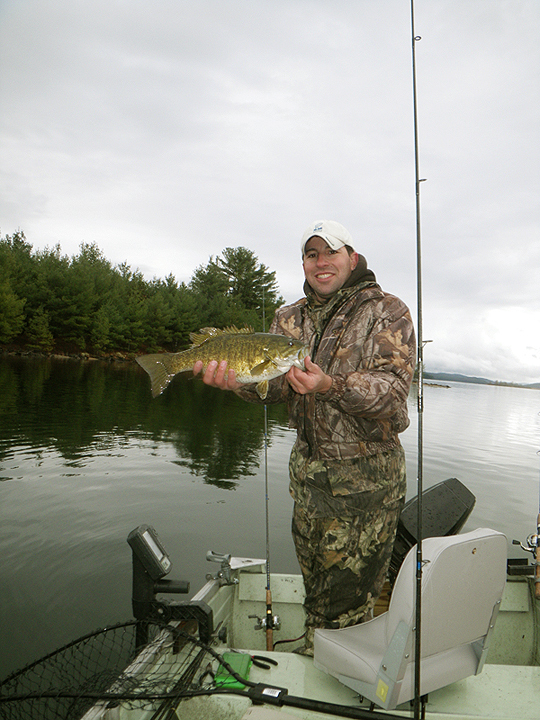 I was pretty pumped and in addition to the trout I also got into a few plump smallmouth between 3.5 lbs and 4 lbs. In addition to the fish, the sightings of bald eagles, loons, mergansers, along with the gorgeous back drop of a wilderness setting just made the trip that much more grand. When it comes to MA fishing waters this reservoir in my opinion is the crown jewel of the state. I can't wait to return. Tight lines! Well as excited as I was for the opening day of the Quabbin reservoir, it faded pretty quick when I woke up to pouring rain, cold temps and wind. Not exactly the most comfortable weather conditions. After a phone call and talking it over with Bill, we decided to call the morning a wash-out and go back to bed and reconnect after awakening for a afternoon trip. Which we did and when we finally got to the Quabbin, the rain had stopped. To our surprise the parking lot was jam packed with empty boat trailers. I guess there were much braver souls willing to deal with the nasty conditions of the early morning. Well for us a late start was better than no start. Due to the wind and having a small boat we didn’t head out to far from the gate. 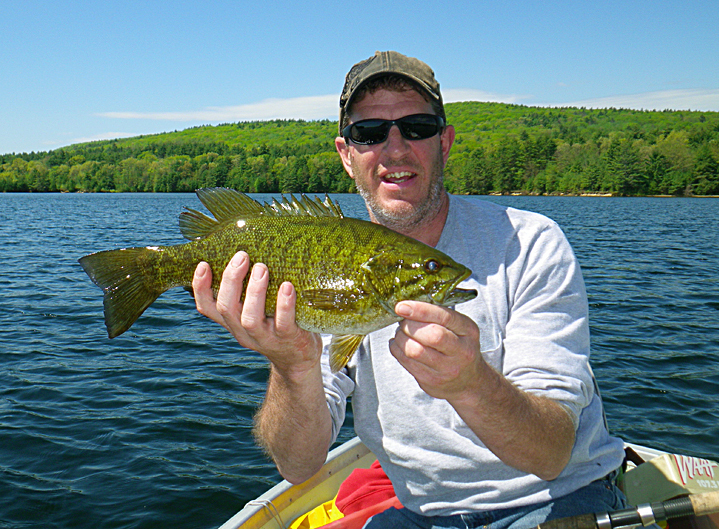 We hit some of the islands that produced some nice salmon last year but they were not there so me and Bill decided to switch gears and focus on the fat pre-spawn smallmouth that were around. Luckily the wind had died down a bit making it easier to fish. 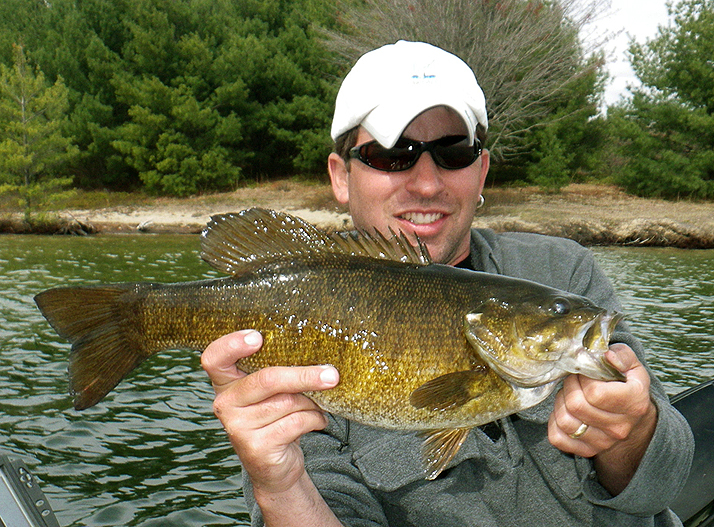 I landed 3 smallies with the biggest and also my new personal best weighing in at 4 lb 2 oz. 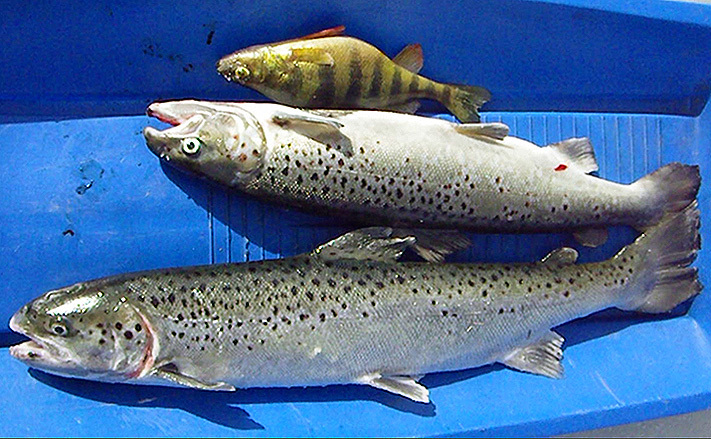 The other two fish were not that far behind in weight. Unfortunately Bill was not able to get into any on this trip but I’m sure he eventually will on a future trip. All and all for a short tip not a bad way to start the opener. 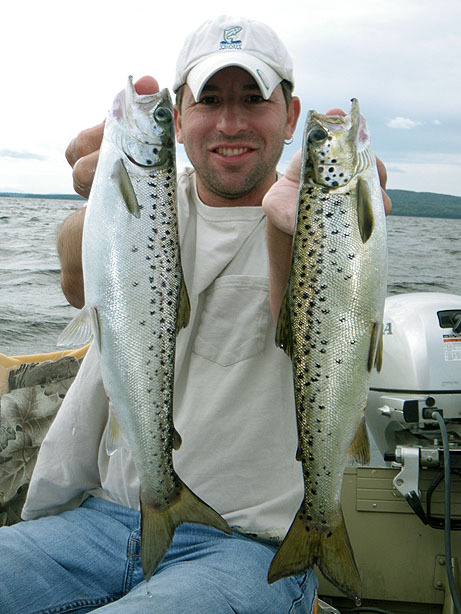 With the new boat seal restrictions on the Quabbin and the quality fisheries that exists at the reservoir I’ll be focusing allot of my upcoming weekend excursions there. 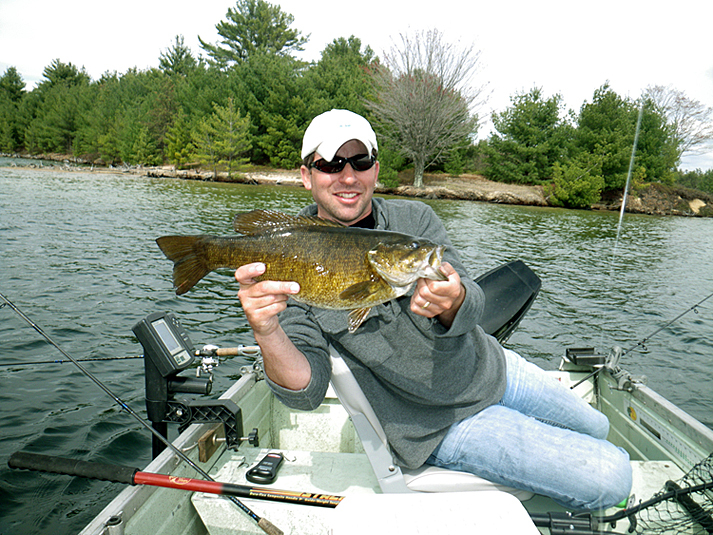 Hoping for more big smallies, giant landlocked salmon and trying for some lake trout as well. 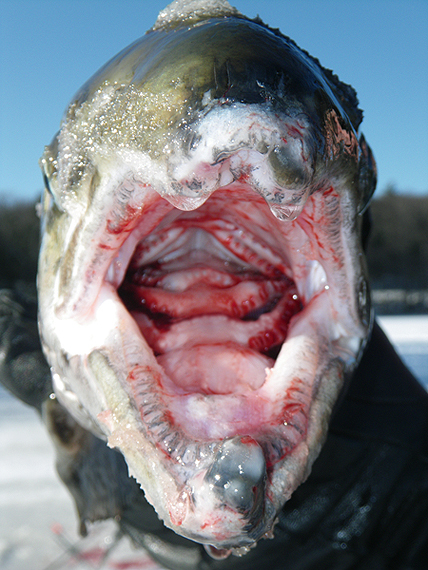 So check back and stay tuned and find out how I make out or better yet head down to the Quabbin yourself and try your luck. Tight Lines! Took the day off to take care of some errands and things I needed to get done. 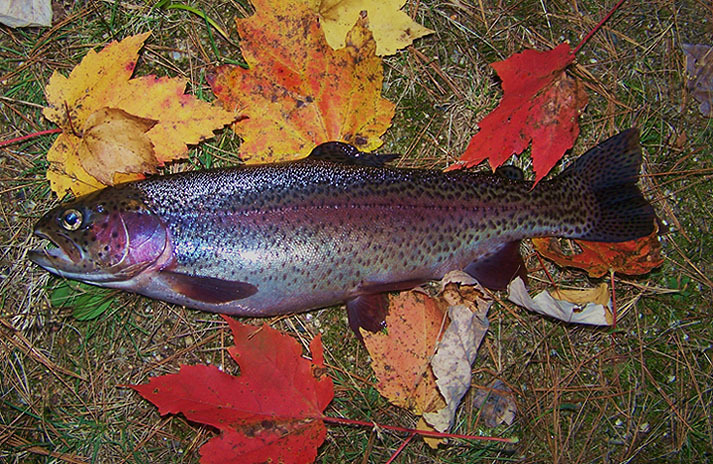 I finished up earlier than expected and headed out late in the afternoon in my canoe for some recently stocked rainbows. 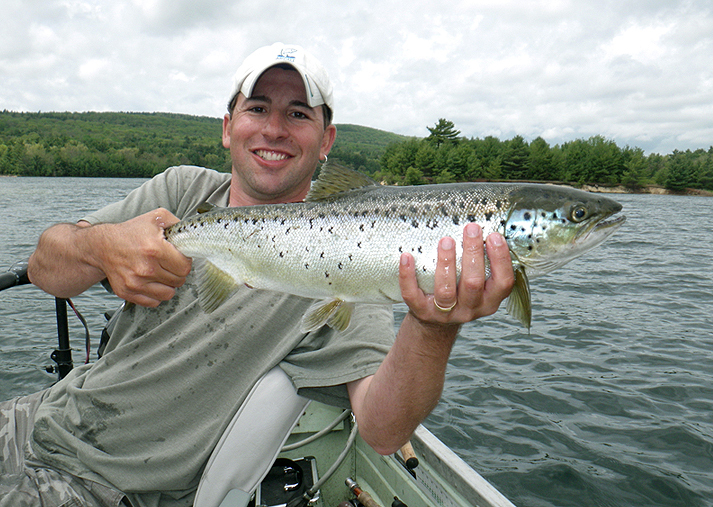 I heard the state had put in lots of 14-16 inch trout this year. The rumors I heard turned out to be true. 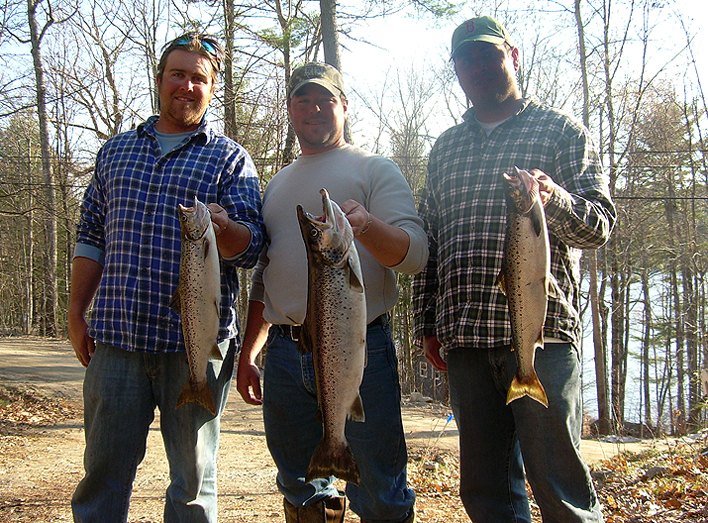 The trout were of decent size and fought exceptionally well. I caught about a dozen or so casting and trolling. I used flies, spinners and rappala’s. 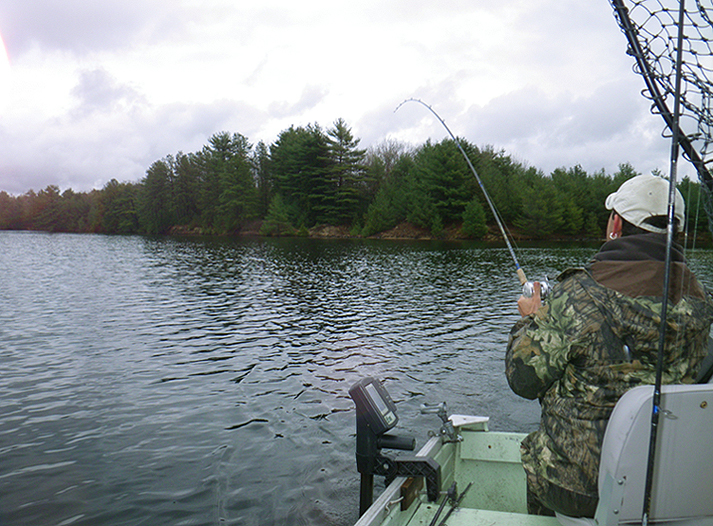 I had one rod with lead-core line I was trolling and not secured in a rod holder, that a large fish stole from me. 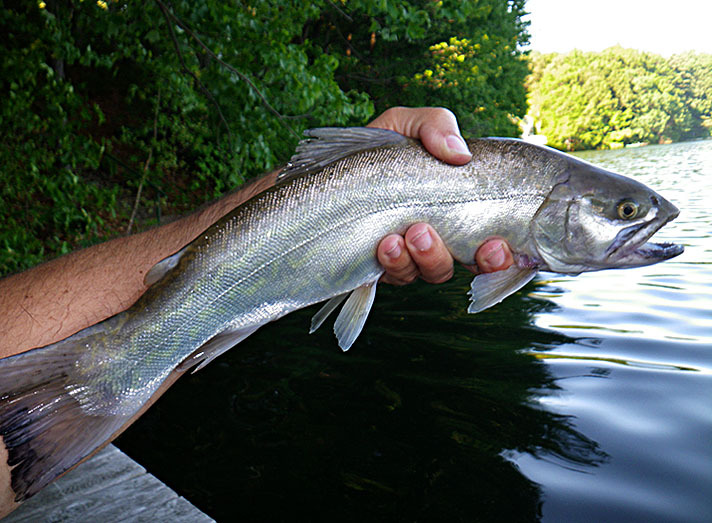 I saw a large silvery fish clear the water and it either had to have been a very large rainbow trout or brood-stock Atlantic salmon. Followed by the jump was my rod flying out of the canoe and into the water. I attempted to grab it but missed it by about 2 inches. 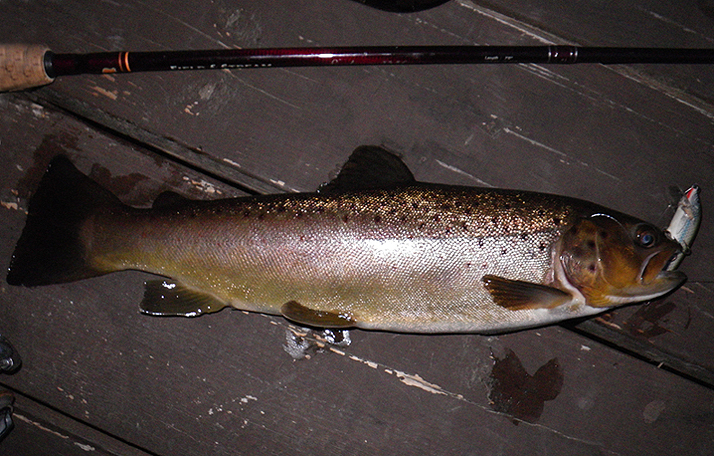 Normally catching a bunch of trout on a pleasant evening I would consider a good day but loosing a favorite rod of mine and then add the insult of loosing that rod along with a large fish with it to boot made for a not so good time. 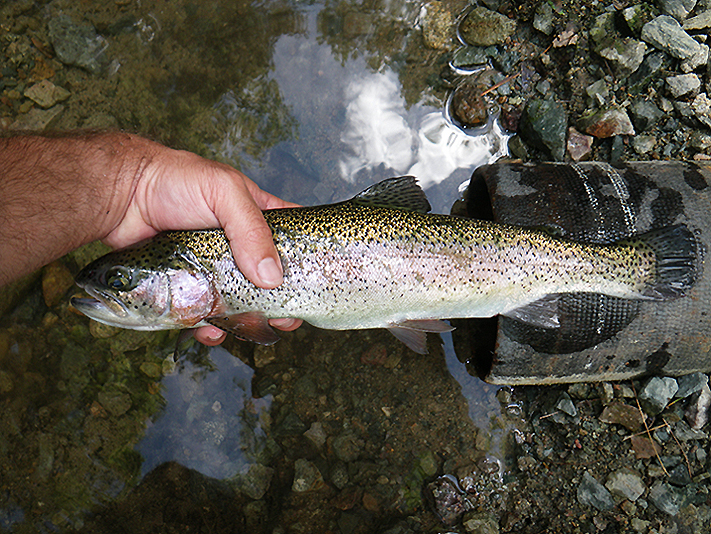 I kept a couple of hatchery bows for me and the wife’s dinner and released the rest. Tight lines! 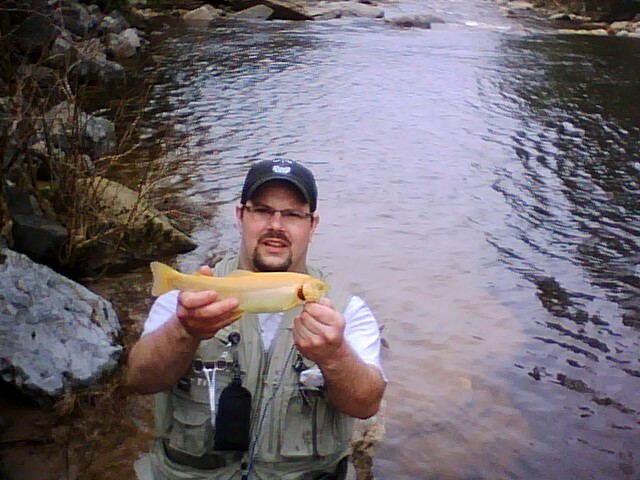 Larry on a fly fishing trip in West Virginia did very well and got this nice golden. 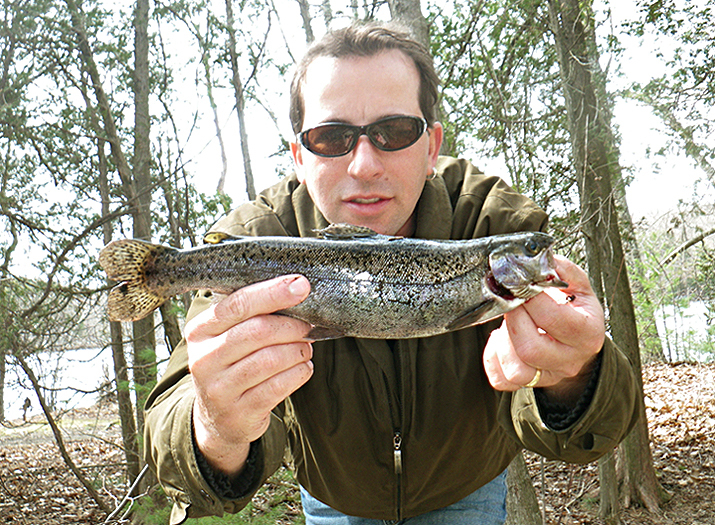 In addition he also landed a couple of rainbows tout and brown trout on dry flies and that it was very fun. He also reports that the stealhead action is slowing down now in Ohio but the walleye bite is picking up and he should be putting the boat in the water in a week or two. Sweet fish Larry keep those pics coming. 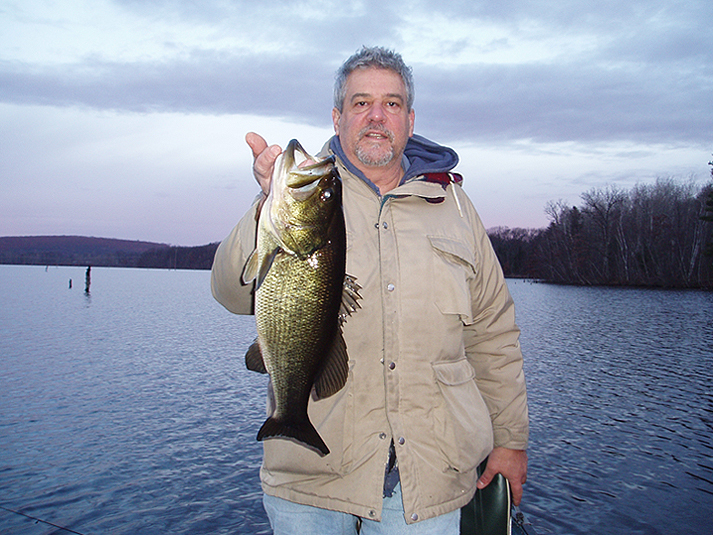 Steve sent us a quick report, he fished a lake in Orange and caught this 20 inch, 4 lbs 6 ozs Largemouth. Nice fish Steve! Stopped after work for a few casts again at a near by trout Pond. Felt lazy and didn’t feel like doing allot of casting so I tossed out some meal worms, under a float and got a couple of brown trout. Only fished for about an hour or so, nothing serious just wanted to enjoy another nice evening from shore. Released one brown and kept one for tonight's dinner. On the way home from work I stopped at a small no name, warm water pond. The weather has been so nice I just wanted to get out and take a few cast and explore a little before dinner. 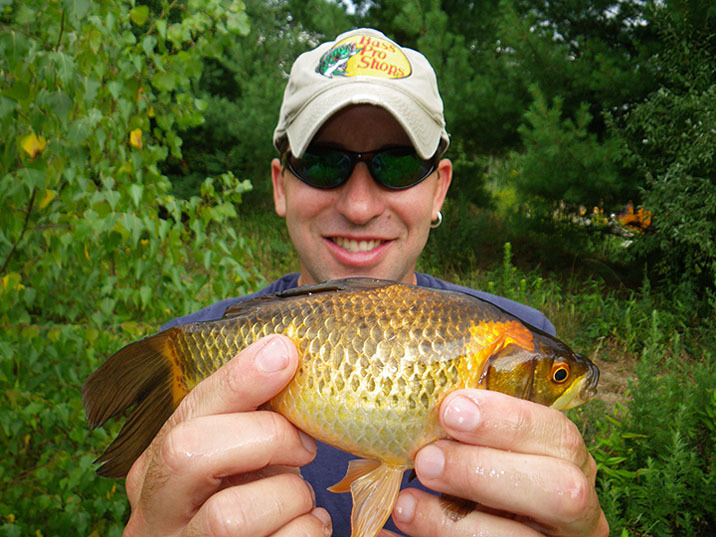 I targeted bluegills (A fish I don’t target often) using a ultra light rod and casting out some small spinners and some earth worms I pulled out from underneath some rocks near the lake shore. Caught a handful of gills along with a bonus largemouth I took off a rooster tail before heading back home. None of the fish were anything to brag about but just a pleasant evening to be out and feel some tugs on the end of the line. Some pretty colors too on some of those little scrappers. Tight Lines! 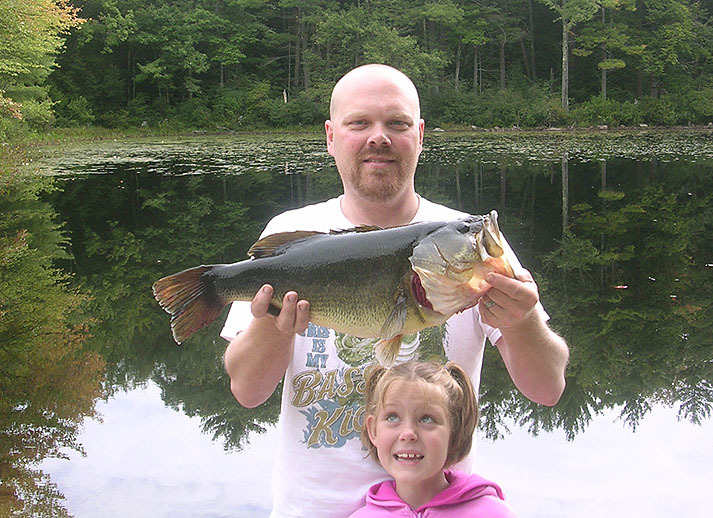 Thanks for sharing Chris and what a incredible catch, keep those reports coming! Here's a quick report from Ray. 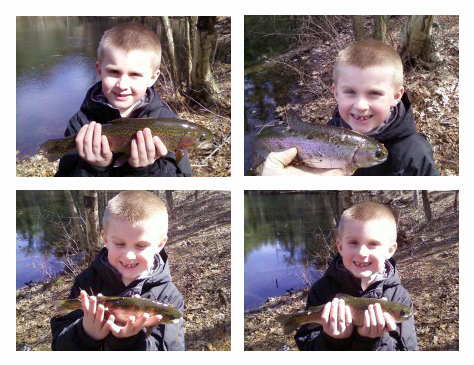 He says attached are pictures of three of eight hold-over trout that he and little Ian caught from a local trout pond. Ry got one off a dry fly using his fly rod and the rest came on power bait fished near the bottom. Nice job buddy, glad to see you continuingly keeping the little guy on some fish. I think we got him hooked on fishing with all those perch and crappie he got into during the ice season. DONT YOU JUST HATE IT WHEN THE SHOT COMES OUT BLURRY! Nice job Mark and keep them coming. 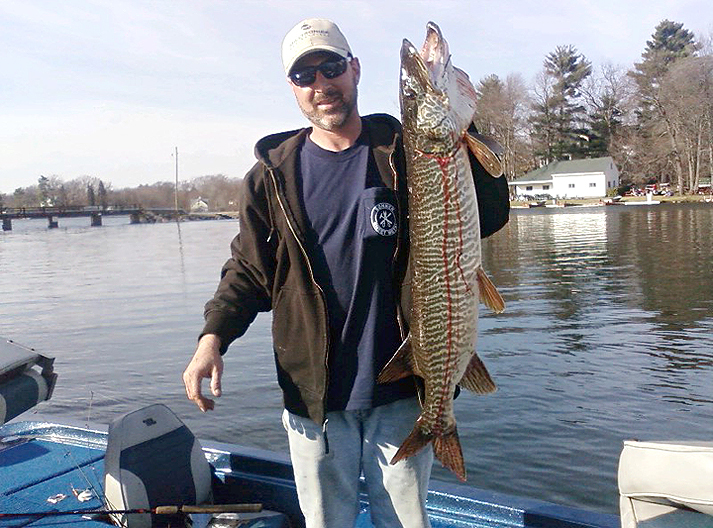 It seems the big pike bite turned on this weekend, some giant pike were caught. Unfortunately I missed out on that bite again. 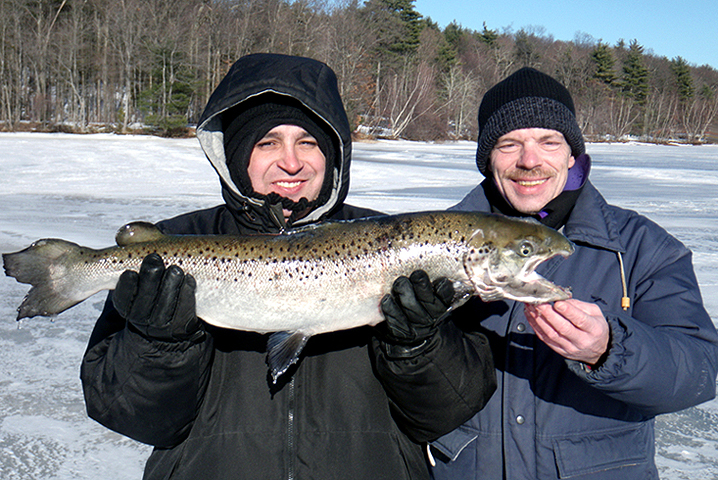 I still had some fun though, I got out on the ice with little Ian and Ray. 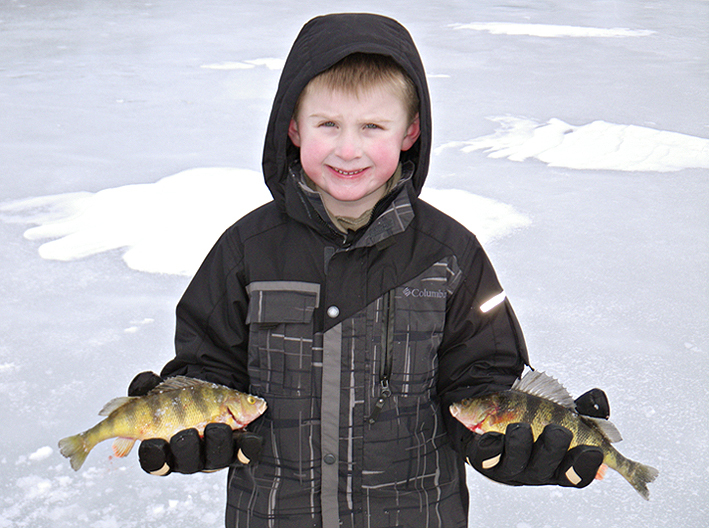 I guess little Ian had so much fun with the perch last time he was anxious for more ice fishing. Kids going to grow up and be a fishing animal. 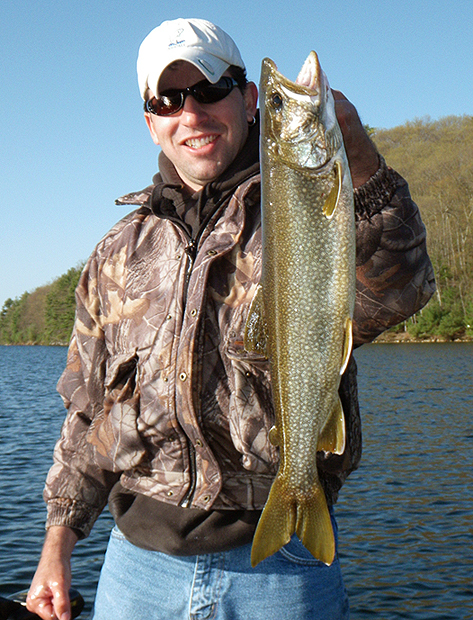 Anyway me and Ray took him to another near by lake plug pond. 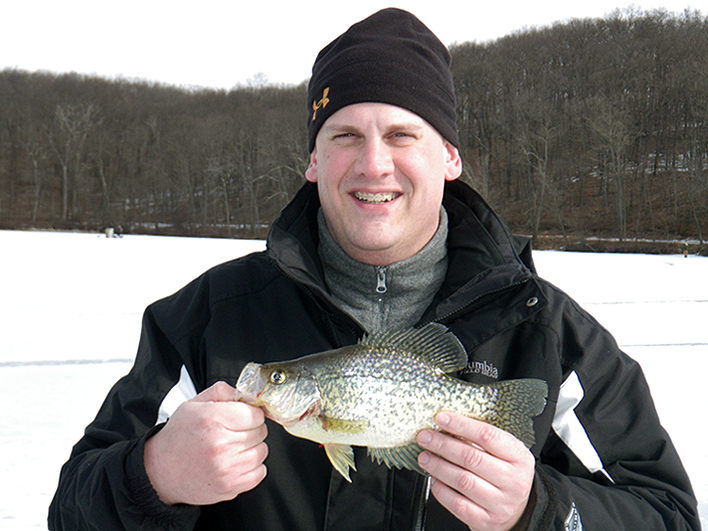 Action was slow but we all managed to land some crappie. We got about 5 crappie total. 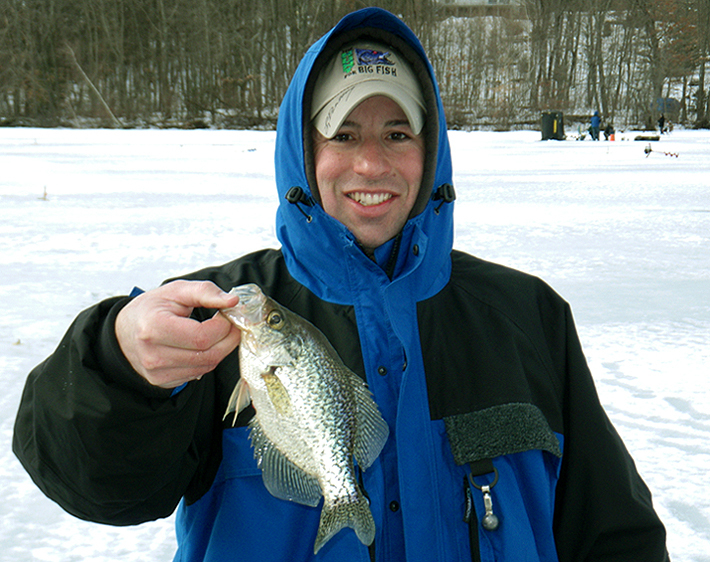 Ian had fun icing his first crappie, I did too pulling one up on the jigging rod. We fished during a derby there were a million guys out on this heavily stocked pond and not a single salmon or trout was caught. 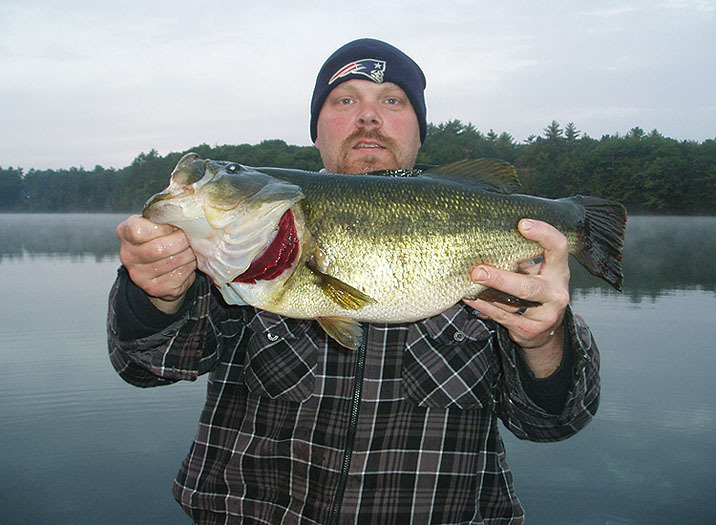 The largest fish of the derby was a 4 pound plus Largemouth. Pretty sad results but still a fun day. 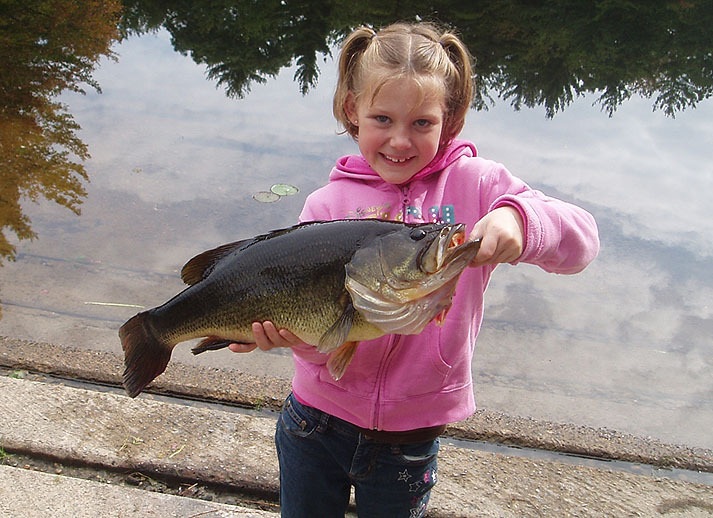 Take a kid fishing! 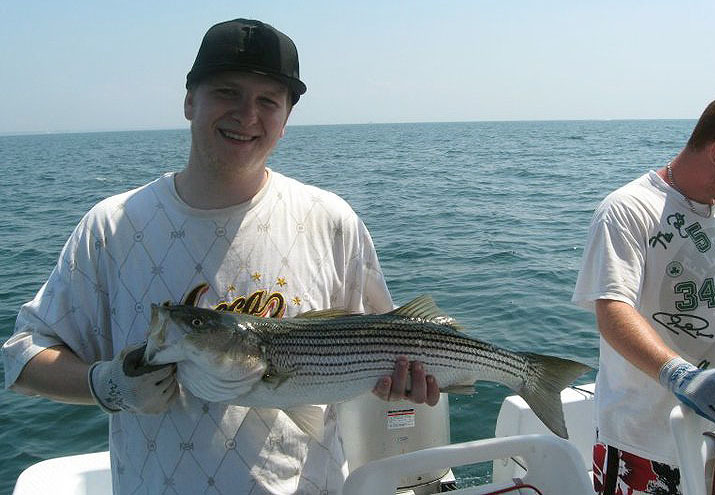 February-20-2010: I Met A Fishing Legend! 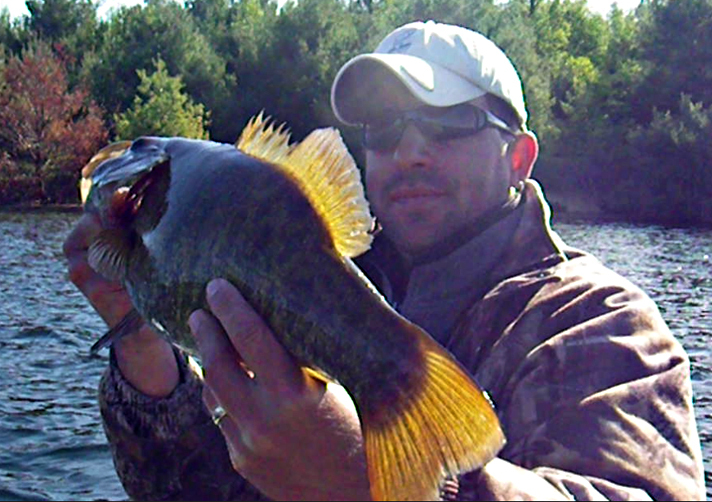 Ok, here’s my first ever non fishing report (sort of) but figured some folks might enjoy reading it. Saturday I decided to give up a ice fishing road trip for pike and instead headed down to the Bears Den fly fishing show in Taunton MA. I did so for two reasons one to pick up some new flies for the upcoming season and the second and primary reason to meet the legend himself Larry Dahlberg. 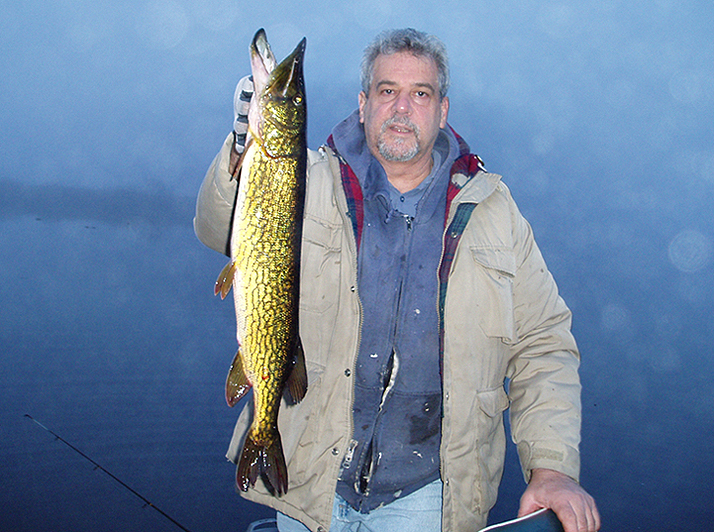 Before the popular cable shows “Hooked” or “River Monsters” Mr. Dahlberg had already been there and done that. 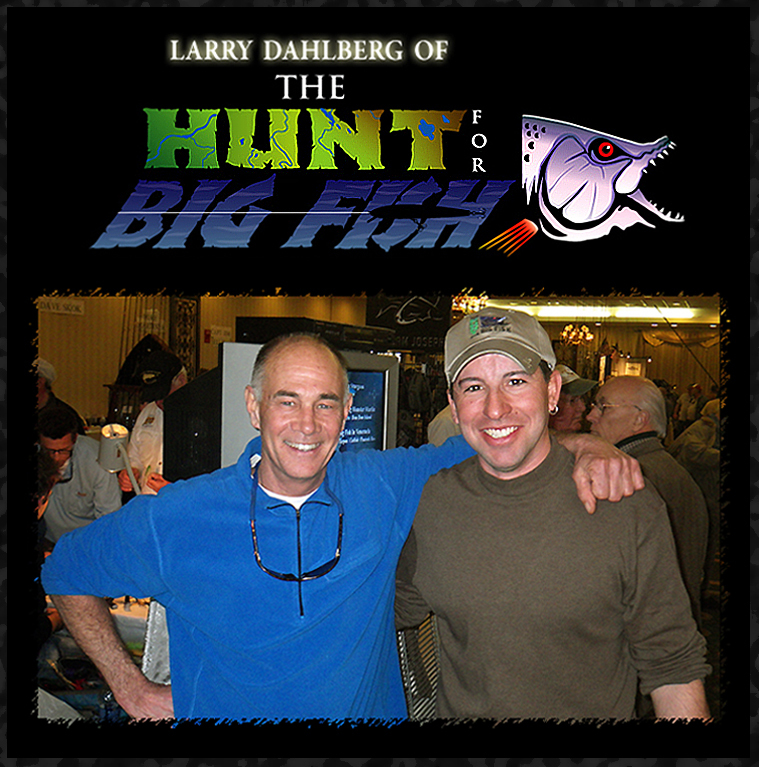 Host and TV personality of my favorite fishing program “THE HUNT FOR BIG FISH”. From musky to peacock bass, tarpon and everything in-between. He’s traveled the globe and done it all and in my opinion is the ultimate big fish hunter & multi-species angler on television. I’m a big fan of the show and it is one of very few fishing programs I find entertaining or get into. 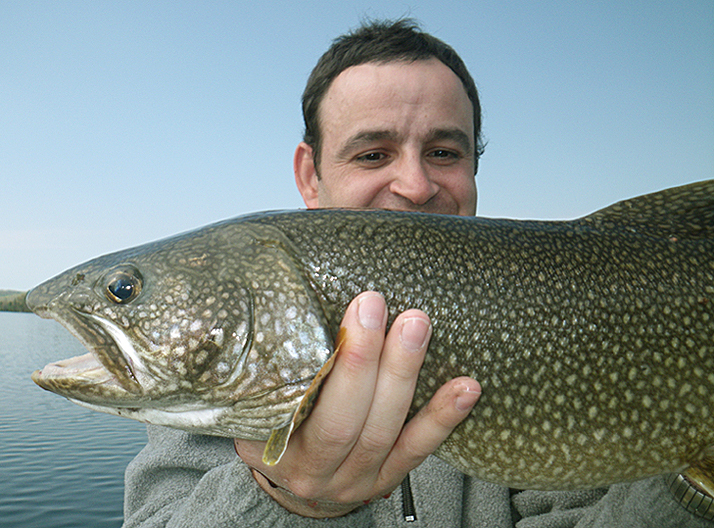 The show targets big fish you’ve heard of, to exotic and strange fish most have never even seen or heard of. Which I find separates itself from the others shows. 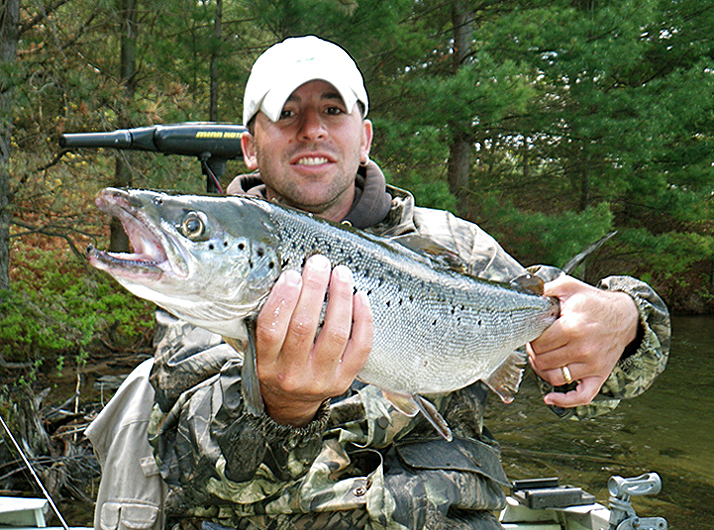 I’m just a local weekend angler and don’t mean to ruffle any feathers here, but I find most of the other fishing television hosts to be a bit tired and boring, week after week catching the same old tired species of fish or worse an infomercial masked as a fishing show. Understandably they all need a few sponsors to exist and pay some bills but then there is just plain selling out. You know the ones with all those patches on their shirts, making a big deal of catching 1 pound bass and every other word coming out of their mouth seems to be a product promotion. Those type of shows I find myself ignoring. Which I guess is why I’m such a fan of Mr. Dahlberg’s program because it’s different and refreshing. You never know what he will be chasing or what angling method he will be using during his pursuits. 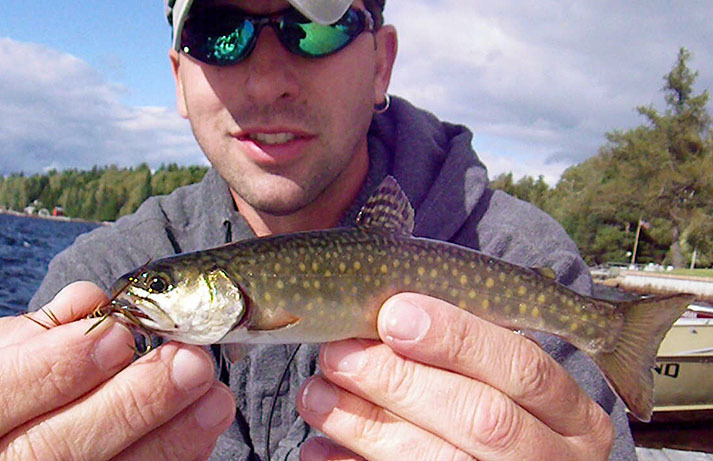 In my past I have ignored opportunities to meet other TV fishing personalities, simply because I’d rather be on the hard water than attend a show or my lack of interest. But in this case I made an exception and was glad I made the drive to meet Mr. Dahlberg. I’m not sure if my first impression on him came off a bit quirky or not but when I met him he was friendly, gracious, entertaining and a bit funny. I got to learn how to tie his classic fly the “Dahlberg Diver” by the man himself and during that demonstration he had mentioned that he had never written an article on how to tie his classic fly but that he had found and read articles on how his own fly should be tied, he then pointed out that they were all incorrectly written and the crowd, including myself got a chuckle out of it. It was a good time. Scott and the guys over at Bears Den did a great job organizing this free show. I also picked up some fly’s I look forward to testing out this spring on my favorite local waters. Next Saturday I hope to spend it outdoors though on the hard water, if it doesn’t melt with all the rain we have been getting lately that is. Tight Lines! 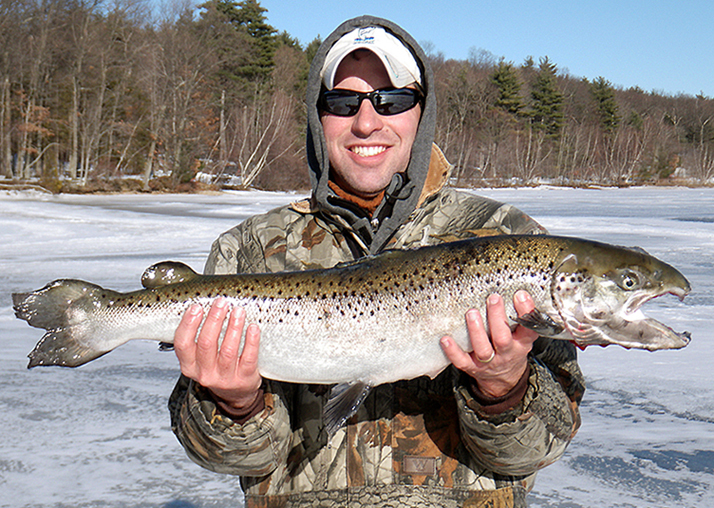 February-15-2010: Winter Brook Trout & Landlock Salmon Memories. CJ found our website and was kind enough to send us some pictures. 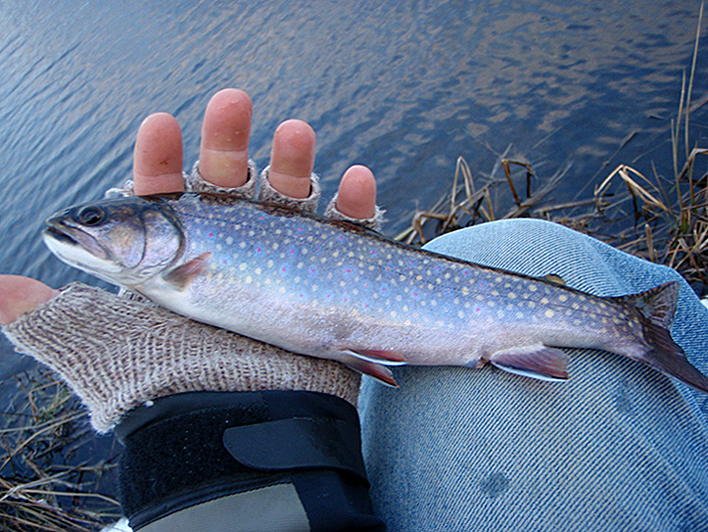 He went for a walk down a Cape Cod pond and got into this beautiful and colorful winter brook trout. 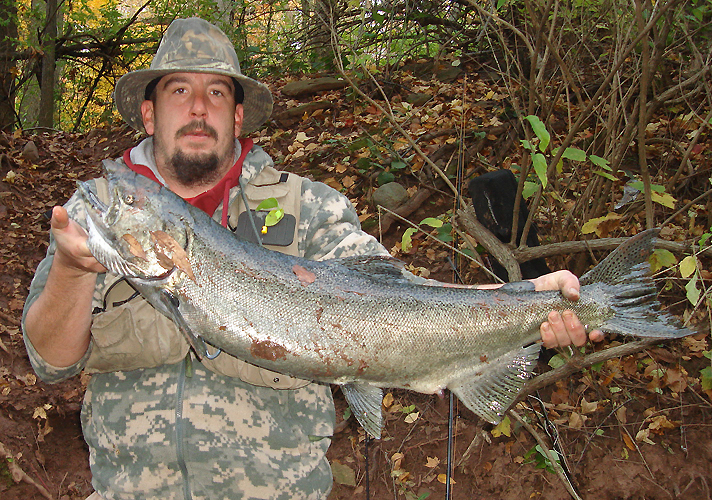 He’s also shared with us some great pictures of some of the landlocked salmon he has taken in seasons past. Great fish! Well I finally got back out on the ice again. 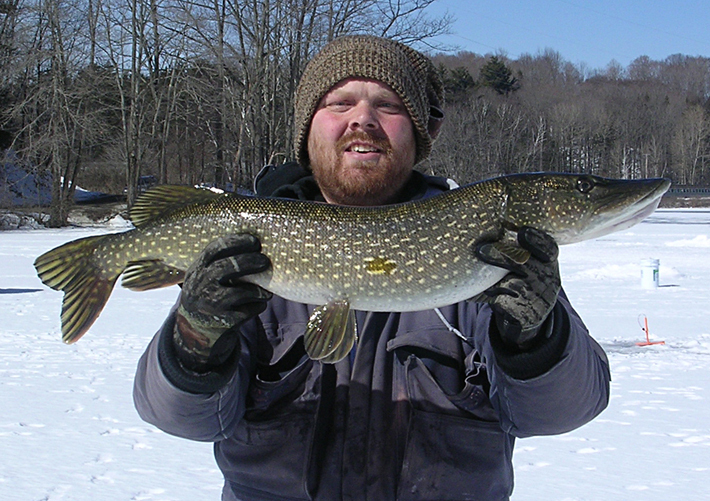 Saturday I originally wanted to target big pike in CT. A good friend of mine Ray though wanted to join me ice fishing but also take 6 year old Ian with us (his future step son). Ray wanted to stay a bit more local, near his fiancés house so he could take Ian and drop him off when he got to cold or bored. 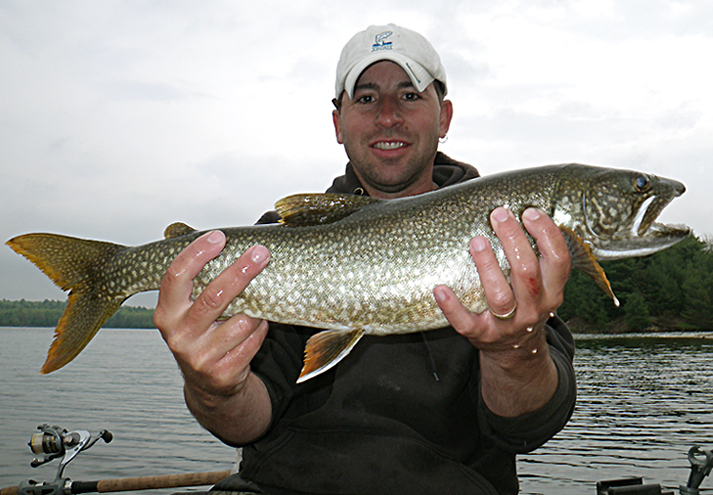 As anyone knows who’s ever fished for pike it can be real slow fishing, flagless days are not uncommon, especially when fishing large baits. 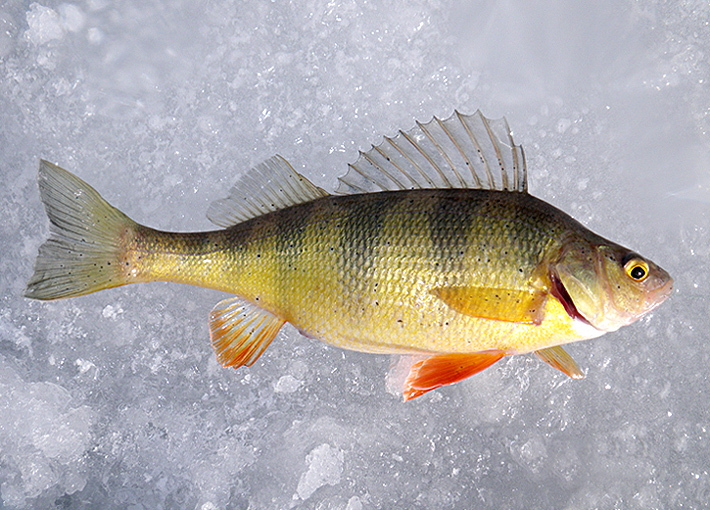 It was little Ian's first time ice fishing and we wanted to take him somewhere were we had a shot at some numbers of fish, regardless of species. I couldn’t say no, so I postponed my pike hunt for another time. 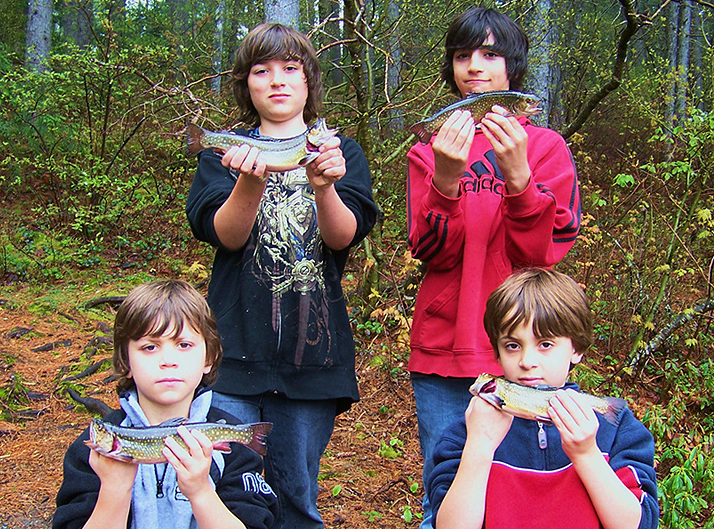 Kids get bored so easy and don’t care what kind of fish they catch. 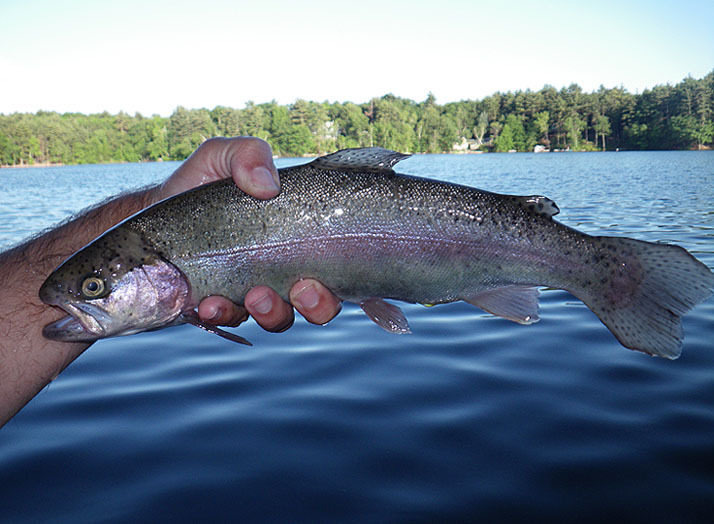 So me and Ray settled on a nearby lake that also happened to be stocked back in the fall with some brood stock salmon. So there was still a small chance at something big being caught. 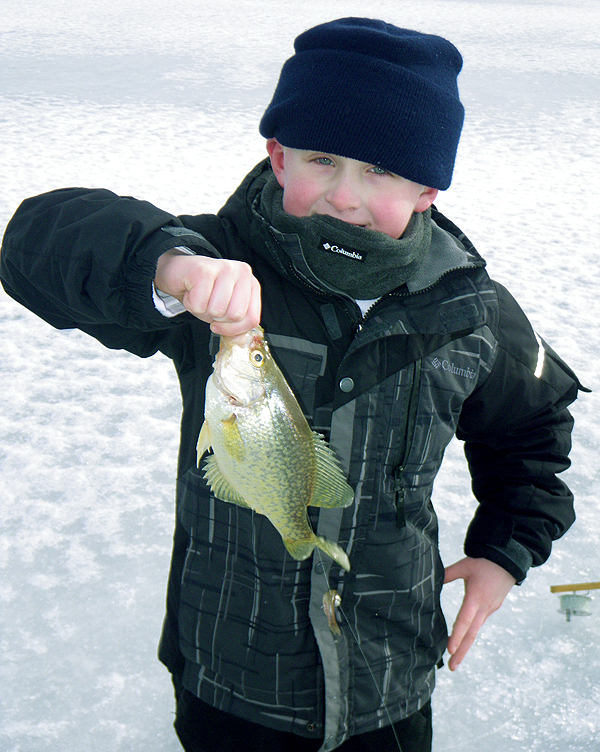 Little Ian was a trooper and stuck it out most of the day and kept busy scooping out holes and keeping them ice free, playing with the shiners and chasing yellow perch flags. 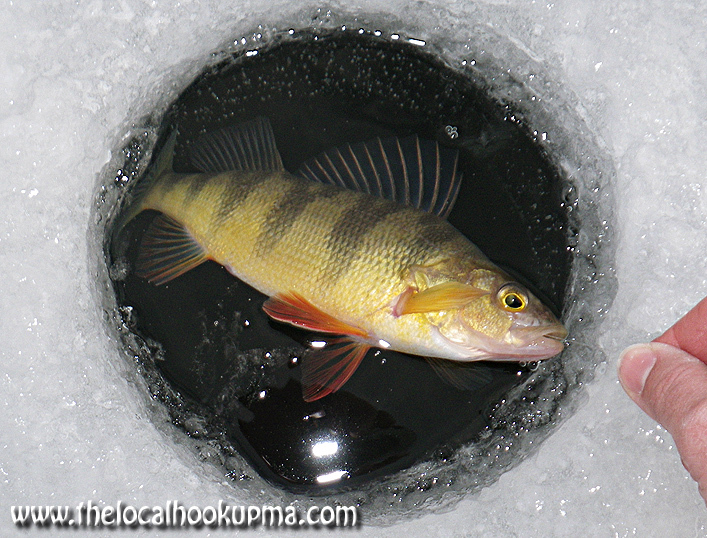 The yellow perch kept us busy between all of us I lost count how many we caught. I had a couple of runs that took out some line but nobody home when I when for the hook sets. Ray had what was undoubtedly a salmon on that had the spool screaming but when he set the hook it came unbuttoned, better luck next time buddy. The spot we wanted to set up on was already taken when we got there and it gave up two salmon for one of the guys in that group. A 5 and 6 pounder, those guys seemed nice and were fun talking too. The spot where Ray had his screaming run was the spot closest to where they were set up. 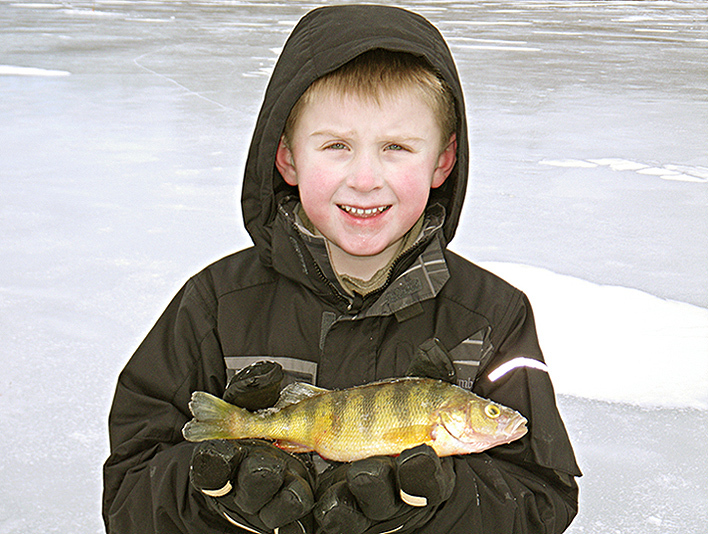 The salmon may not have co-operated for us but the yellow perch action was allot of fun and it was also a blast introducing the little guy to ice fishing. Tight Lines and Take a kid fishing! Happy New Year everyone. It's hard to believe as I write this entry into this digital journal that it's 2010 already, time sure does fly by. This is my 3rd year sharing pics, stories, misspellings and improper grammar......LOL! Well it was my first time out this new year ice fishing and a great beginning of another season. 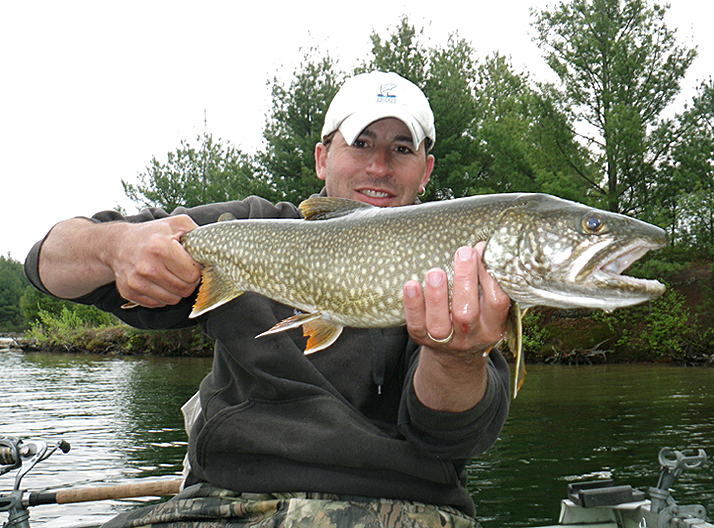 I wanted to target something big, so I debated between going after pike or (broodstock) Atlantic Salmon. I decided to chase the salmon and boy I’m glad I did. My friend Bill and Bert joined me. I set my 5 tip ups along with Bert's 5 tip ups. 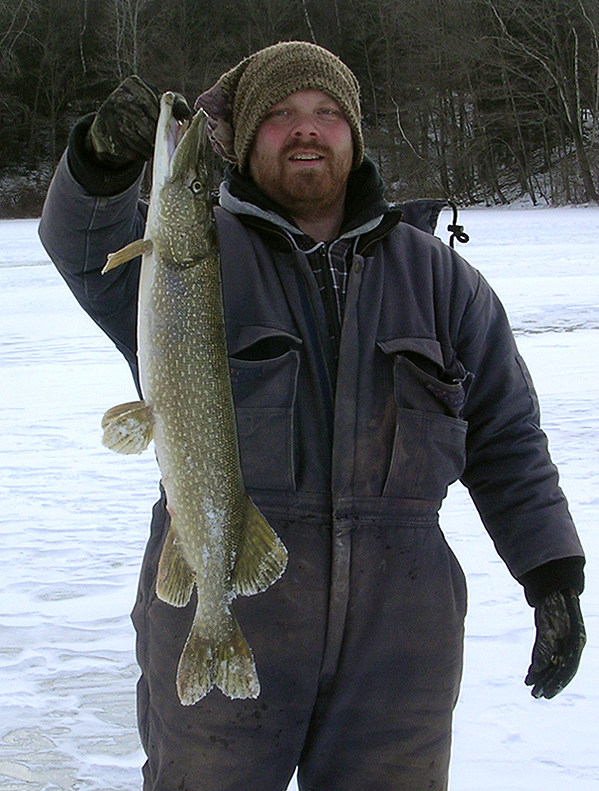 I rigged all the tilts with medium shiners, 3 feet under the ice. Some say these brood Atlantic's are not line shy but I believe sometimes they will drop the bait if they feel a steel leader attached to their morsel of food. 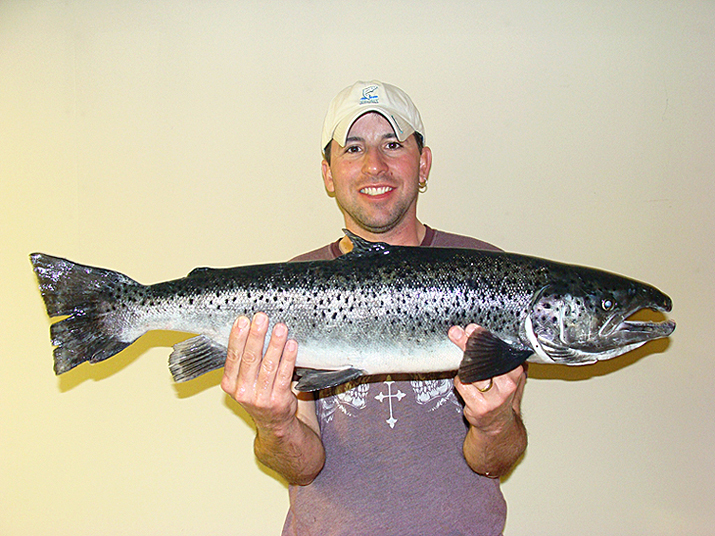 Not wanting to take a risk and knowing big salmon are far and few. I spent the night before tying on some 10 lbmonofilament line leaders and experimented with down sizing my hooks to a size 8 (blood red). 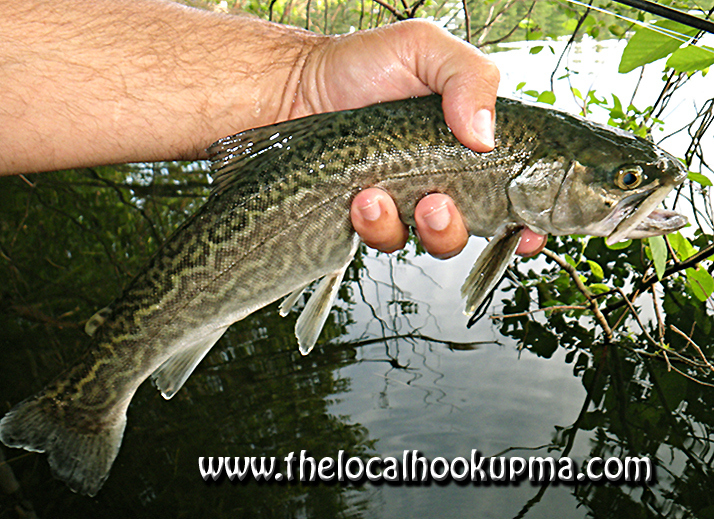 Without the fish feeling a bulkier hook my theory was it would be less likely to spit out the bait. I hoped that I would get the opportunity to test this very simple theory. After only 2 wind flags in about 3 hours of fishing I was starting to have my doubts. Finally another flag went up in a spot I had felt confident in and this time the spool was screaming line. I had planned on letting Bert take it but I warned him it was a real big salmon and that it would have to be played out carefully or the mono line would break or the hook would come unbuttoned and that he would not just be able to yank it out like the small bass and pickerel he's used to forcing up from the one other ice fishing trip he did years back. 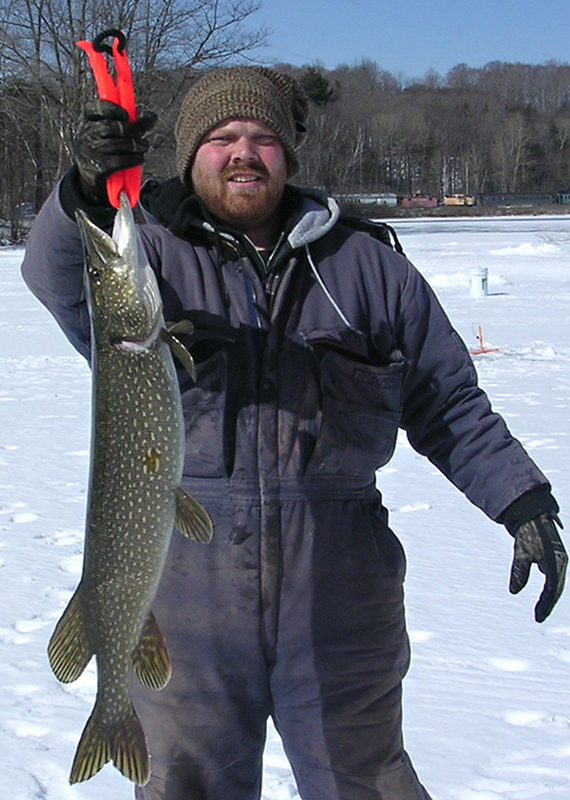 After hearing that and being inexperienced with ice fishing herelinquished the tip up back to me again. When I put the breaks on him I knew with certainty it was a good one. I played it for a bit and it made a handful of runs. Each time it got near the hole it would bolt again. Because the fish was making so many runs I had Bert still help out by holding up the trap to help keep the line from getting caught on any of the ice crevices. Bill filmed some of the battle and also helped undo a tangle on the spool right before the fish made another run. The head started to get near the hole again and I did not want to risk lifting the fish straight up and breaking the line so I gaffed the fish to get her out of the hole. These old retired broodstock fish are stocked for put and take and don't hold over for very long. I estimated the fish between 10-12 pounds. A couple hours after landing the fish I got her on a certified scale at a local bait shop and she officially weighed in at 10 lbs 5 ounces. She probably shed some ounces from just the blood alone she lost. She probably would have went 10 and a half pounds had she been weighed immediately after capture. Regardless the fish more than met the weight qualification for a state pin award. 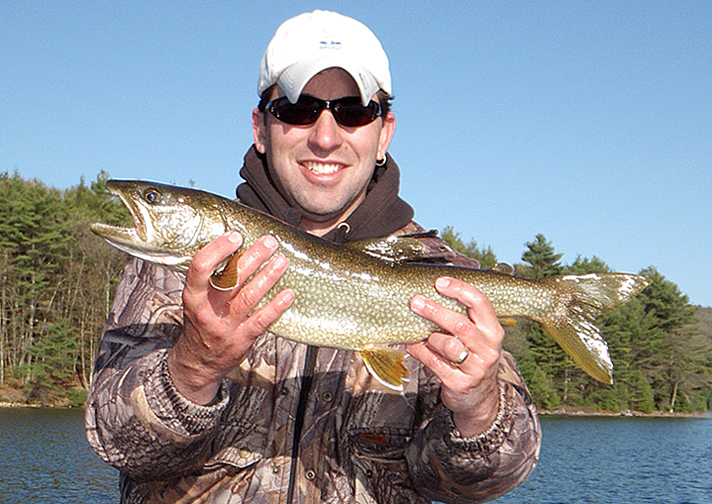 A great fish to start the new fishing season with. I hope to get a video up of this catch soon. Thanks again to Bill and Bert, not sure I would have landed it without your help guys. Can't wait to get back on the ice again, Tight Lines All! Updated frequently, so check back often.